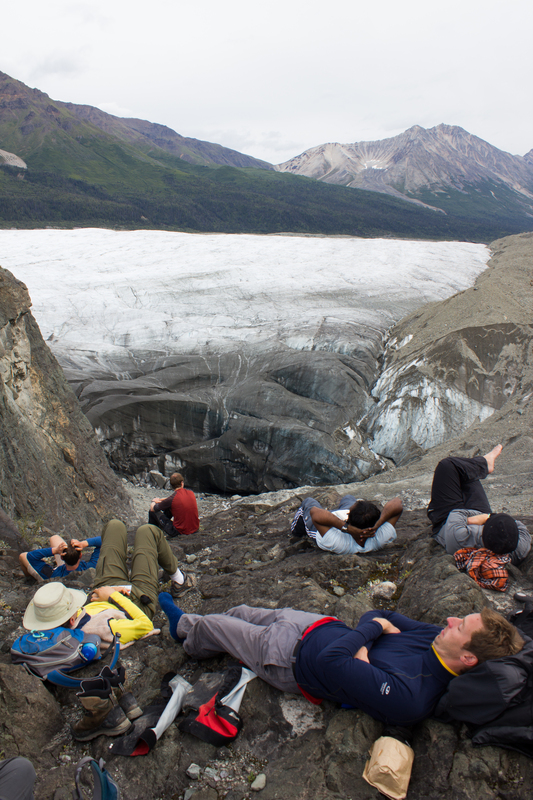 At the beginning of August, I was fortunate enough to take part in the International Glaciology Summer School, in beautiful Alaska. 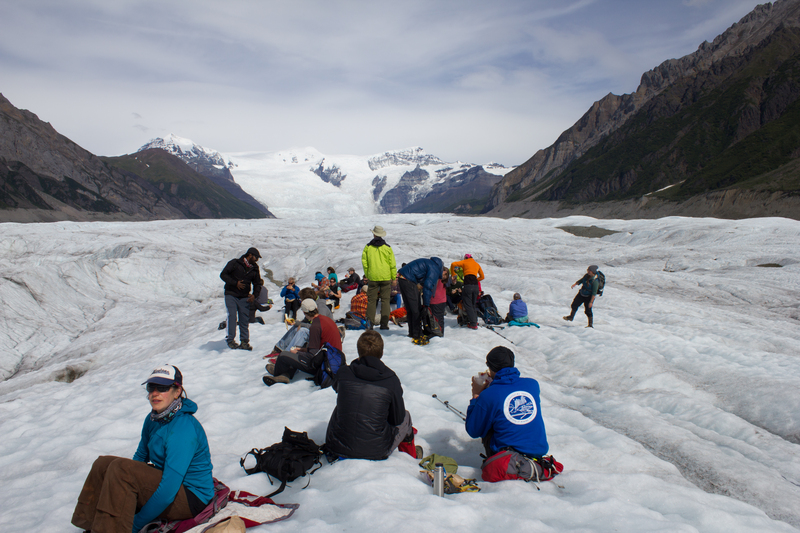 The school is run every two years, directed by Regine Hock of the University of Alaska Fairbanks, and brings together students and instructors from all over the world. 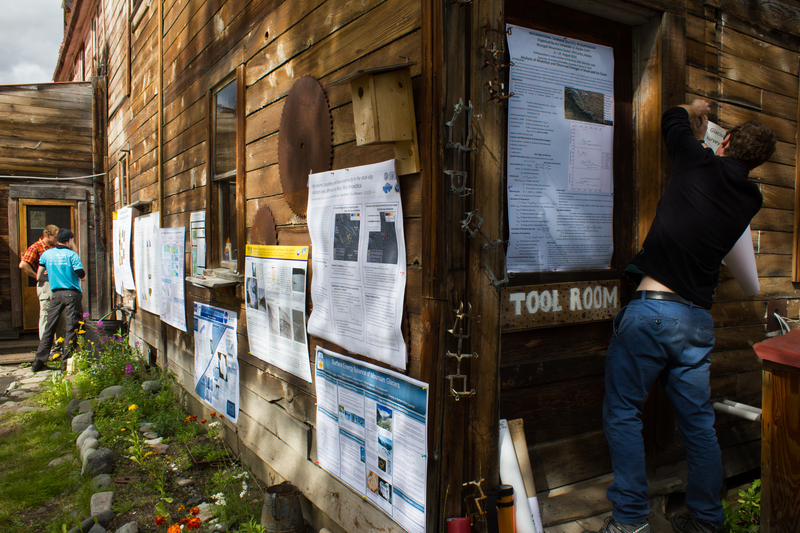 Based in the Wrangell mountains, in the old mining village of McCarthy, the school provides an opportunity to learn from experts in a range of fields within glaciology, and perhaps more importantly, provides a platform to engage with and get to know others embarking on research in the science. 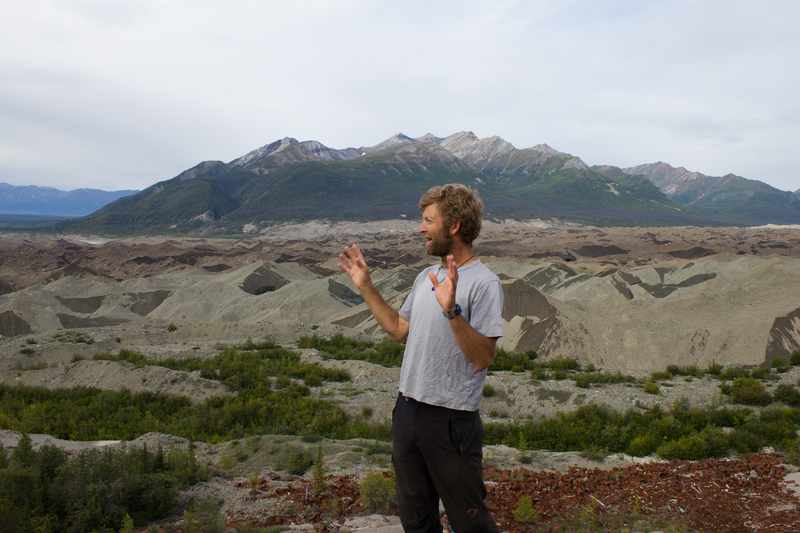 The 10 days of the course were some of the most enjoyable of my academic career, and I left inspired by the enthusiasm and curiosity of my peers. 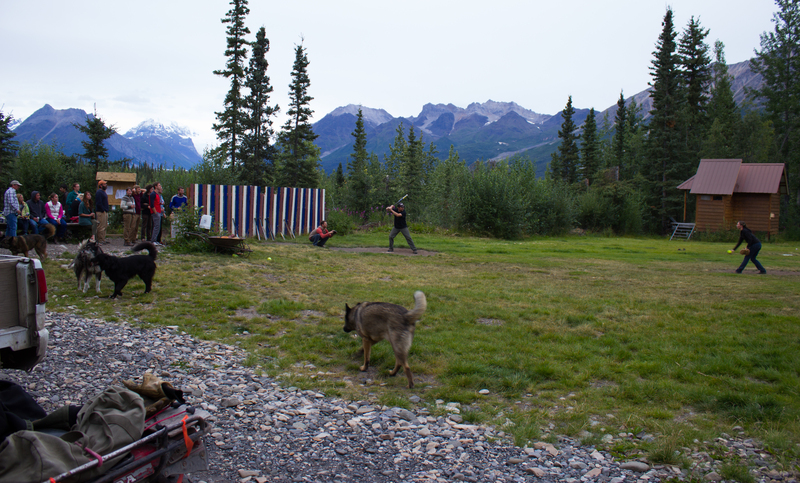 Below are images from some of the activities that took place outside of the classroom (click on images to enlarge). 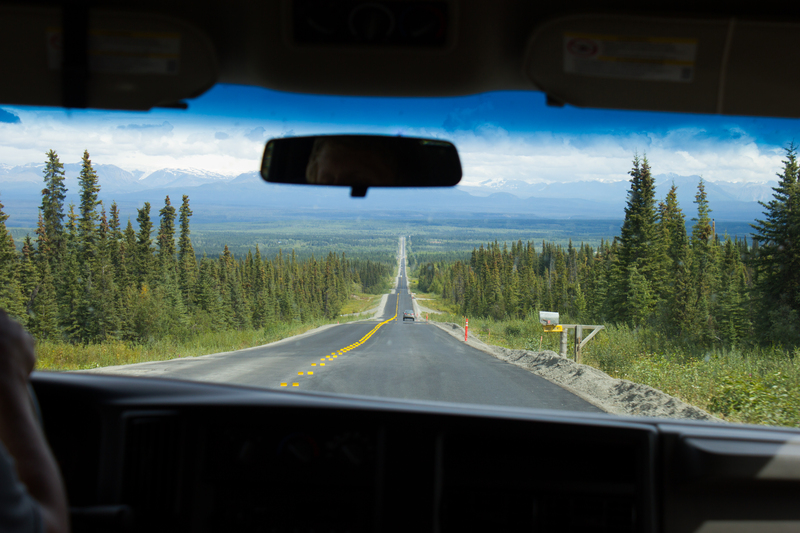 Hitting the road from Fairbanks to McCarthy, and aiming for the mountains. 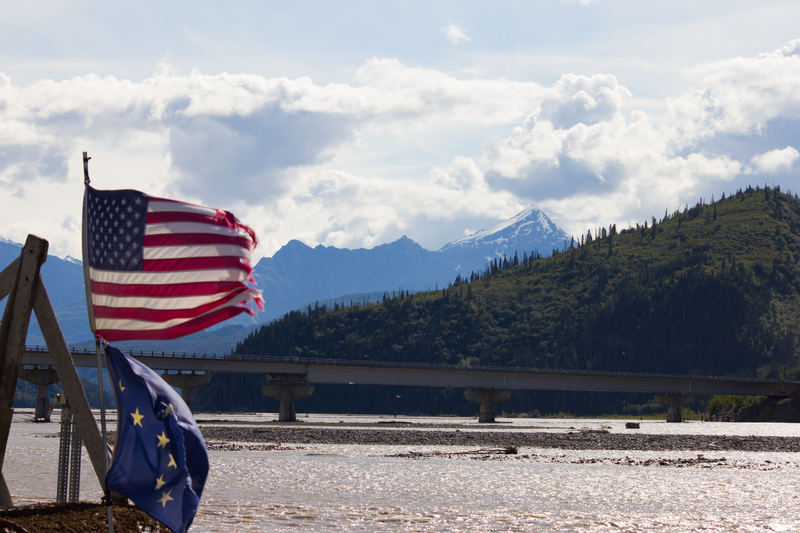 The drive to McCarthy took 11 hours, but it was broken up with regular stops. 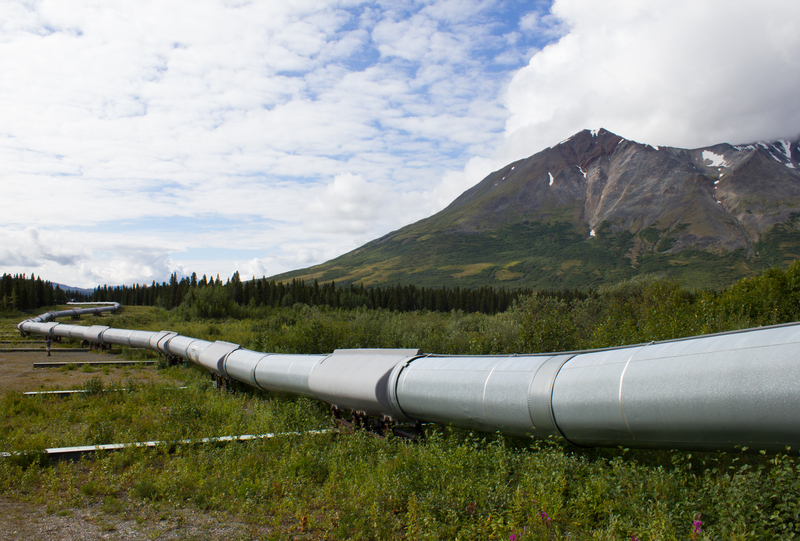 The Trans-Alaska pipeline crosses the entire state, north to south, from Prudhoe Bay to Valdez, stretching over 1,200km. Not a popular decision. 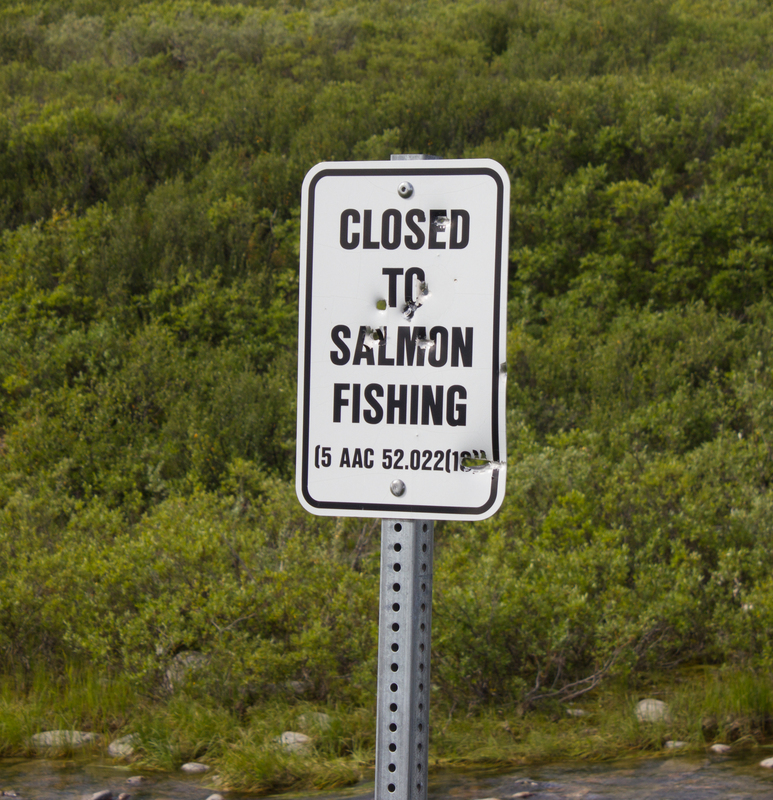 In reality, the salmon at this point have traveled so far inland from the sea (to reach spawning grounds) that they have lost much of their mass, and are not suitable for consumption. 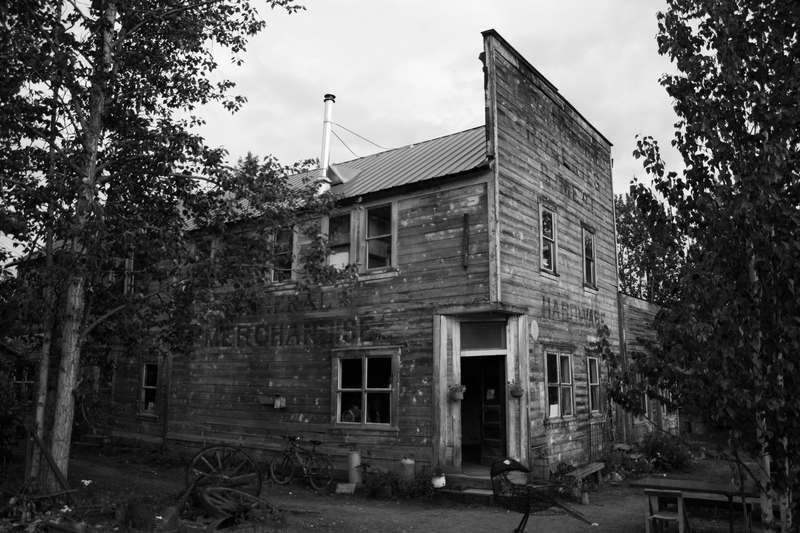 McCarthy’s old hardware store, now operated as the Wrangle Mountain Center, was our base for the summer school. Tools of the trade. 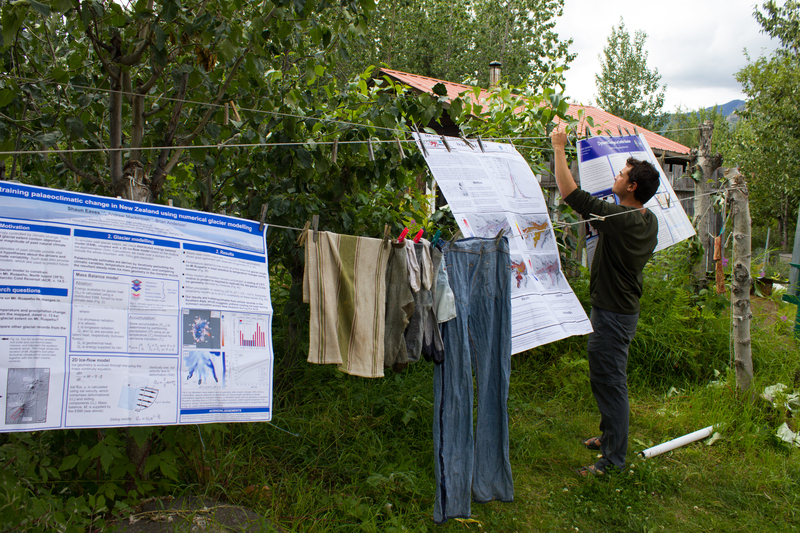 An unconventional poster session. Friday night softball in McCarthy. 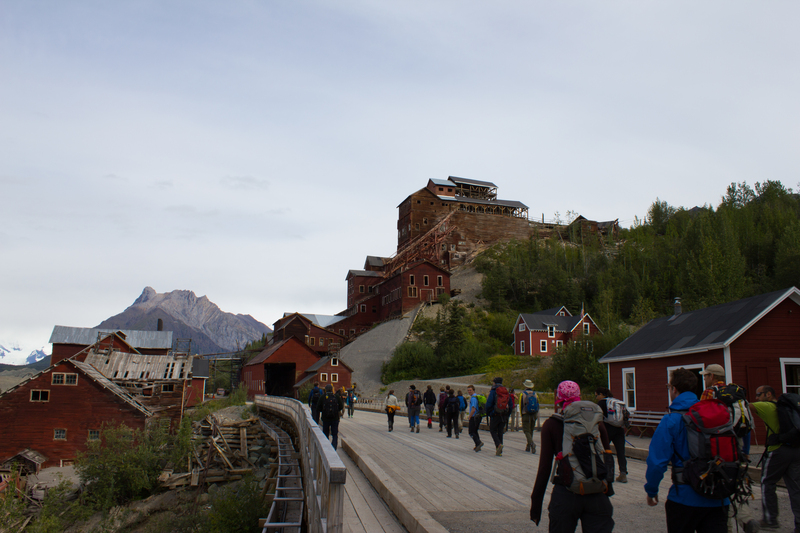 Passing Kennicott mill, where ore from the surrounding copper mines was processed in the early 1900s. Mike in action. 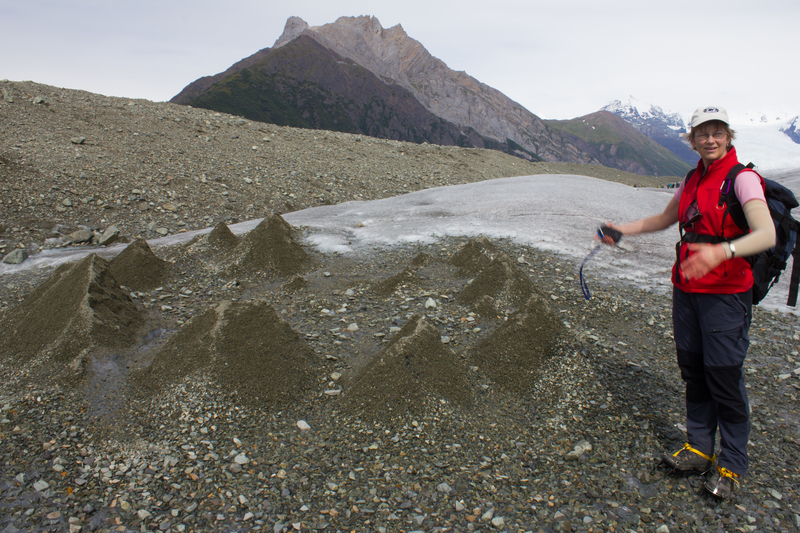 The expanse of what looks like gravel in the background is actually the lower reaches of the Kennicott glacier; the ridges are composed predominately of ice, coated with a thin layer of debris. 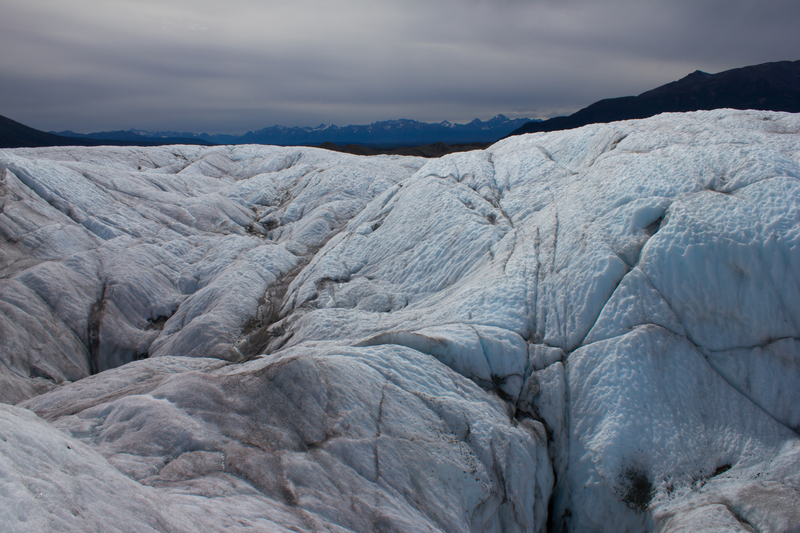 The material comes from the lateral moraines of numerous tributary glaciers that have merged with the main trunk of the Kennicott, higher up the valley. 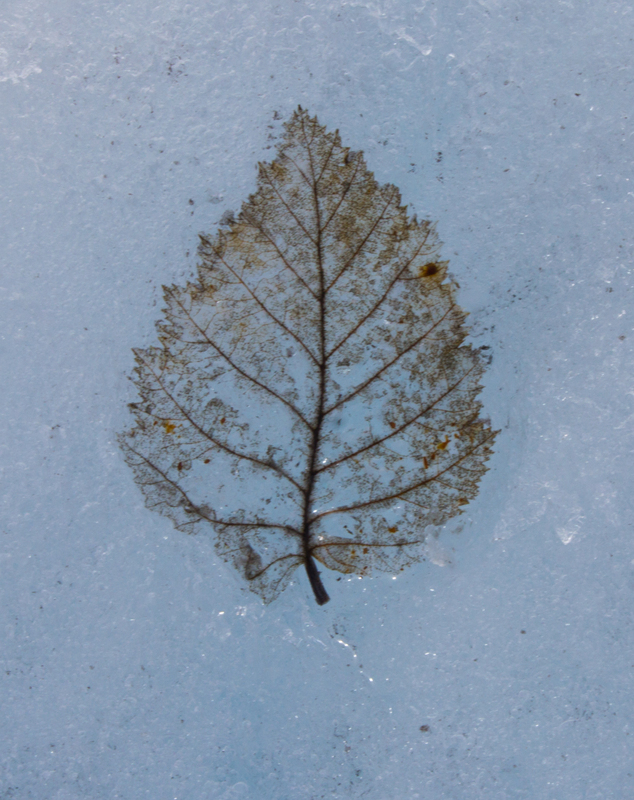 Footprint of a moulin. 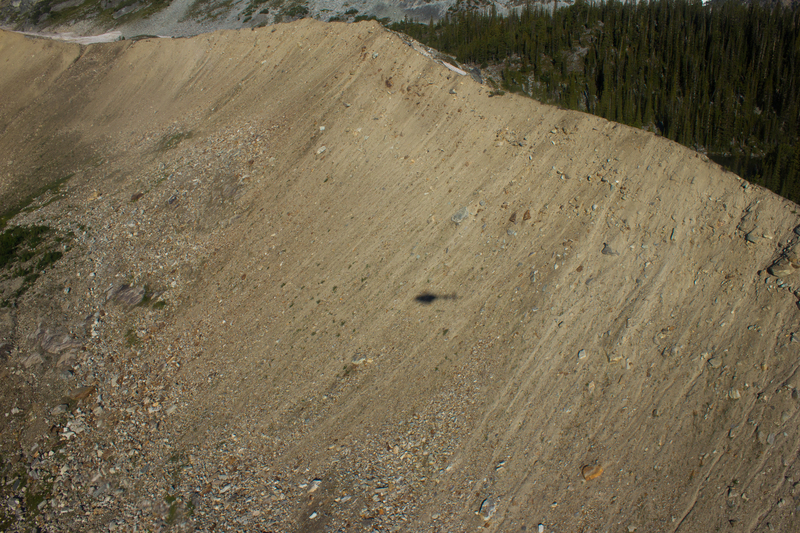 Debris carried downwards by water is deposited at the bottom of the moulin. 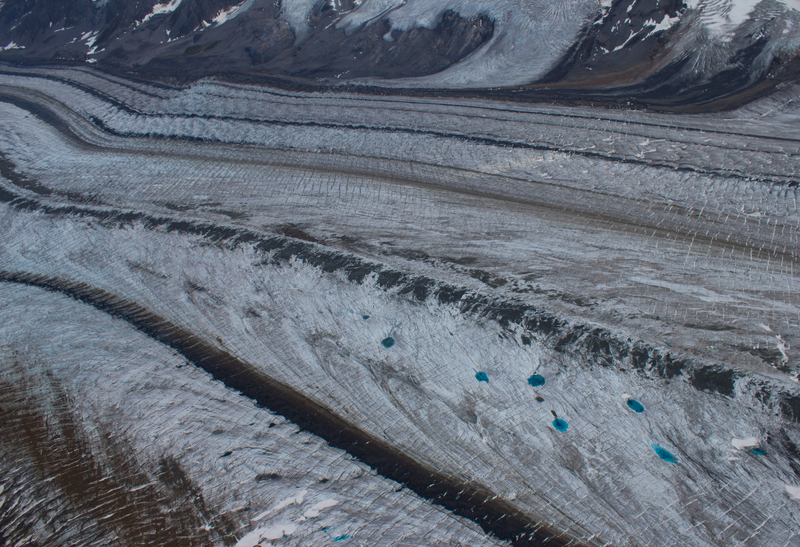 When the overlying snow and ice melts (and the moulin collapses), the ice covered by this material melts slower than the surrounding exposed ice, resulting in these ridges. 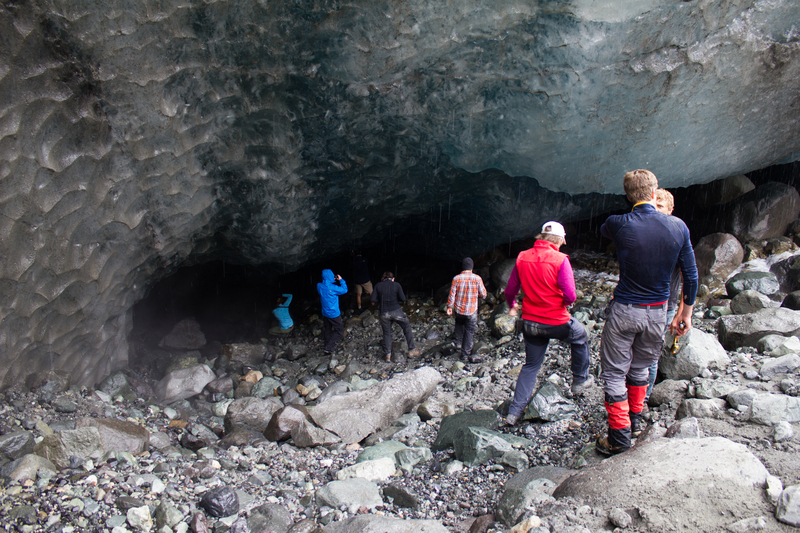 Glaciologists in their natural environment. 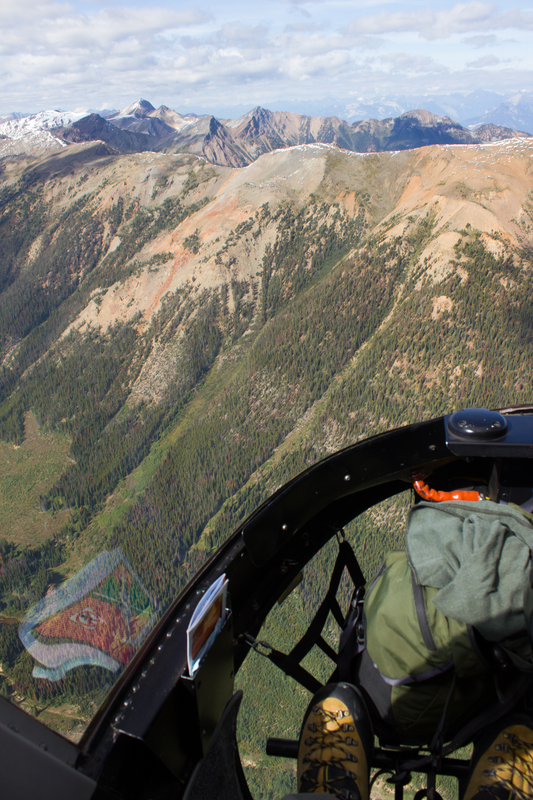 Descending into a temporarily empty lake basin. 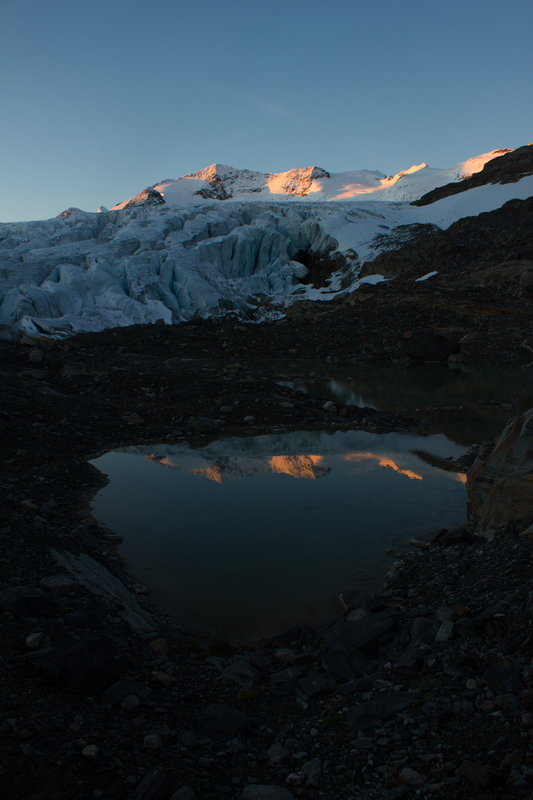 This lake, along the margin of the Root glacier, can fill or drain in a day; the water flowing through subglacial channels. 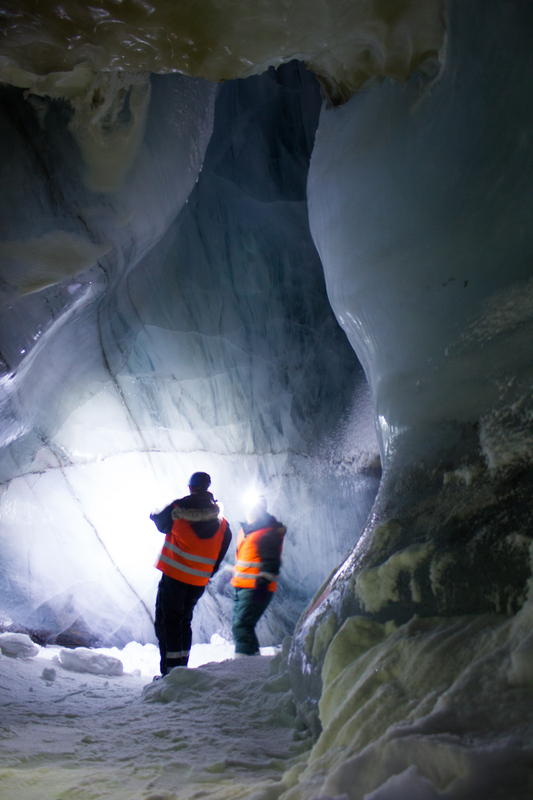 What lies beneath a glacier? The blue room. 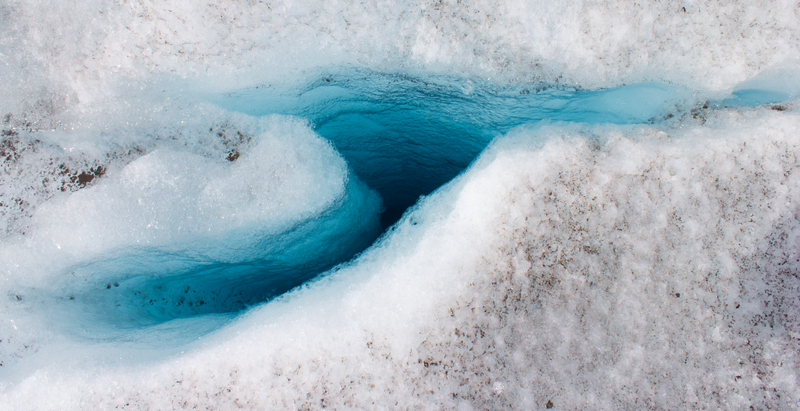 I spent longer crouched in a subglacial river than is probably recommended, but it was a hard place to leave. 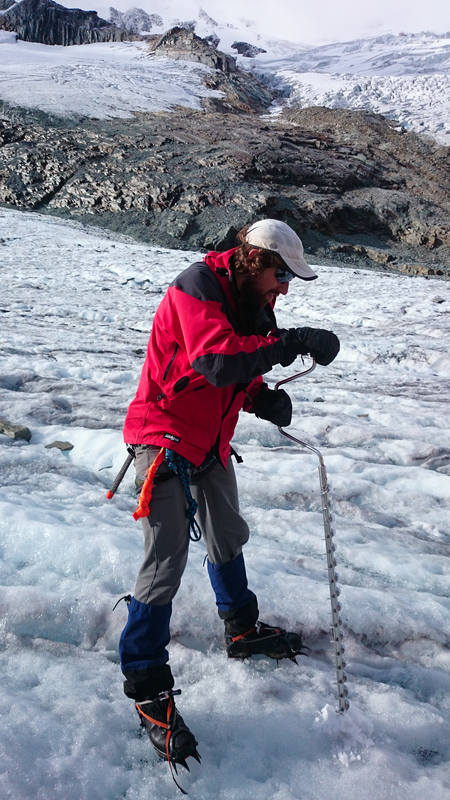 Having seen all there is to see on the surface of a glacier, Colin decides to check out a moulin (not really; don’t do this). 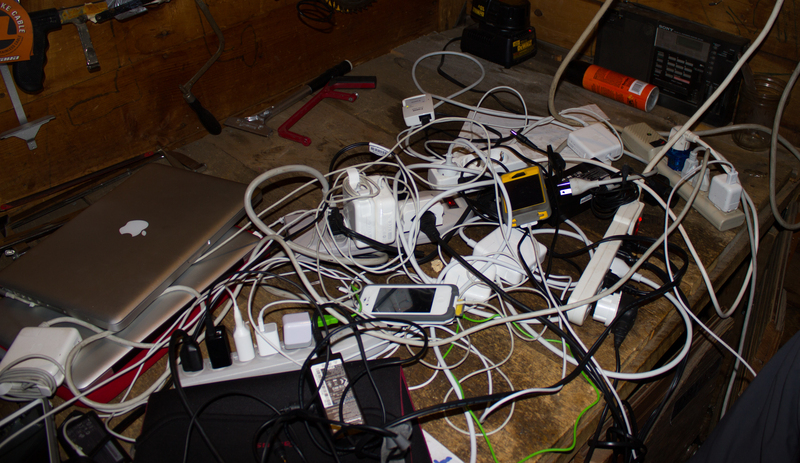 Outlets were a commodity when power was available. 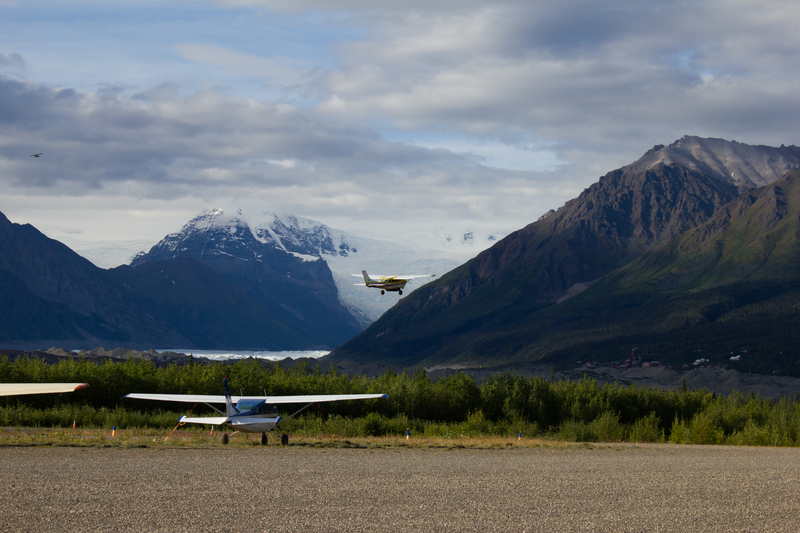 A group of us took advantage of the landing strip in McCarthy, and arranged a flight over the surrounding glaciers and mountains. 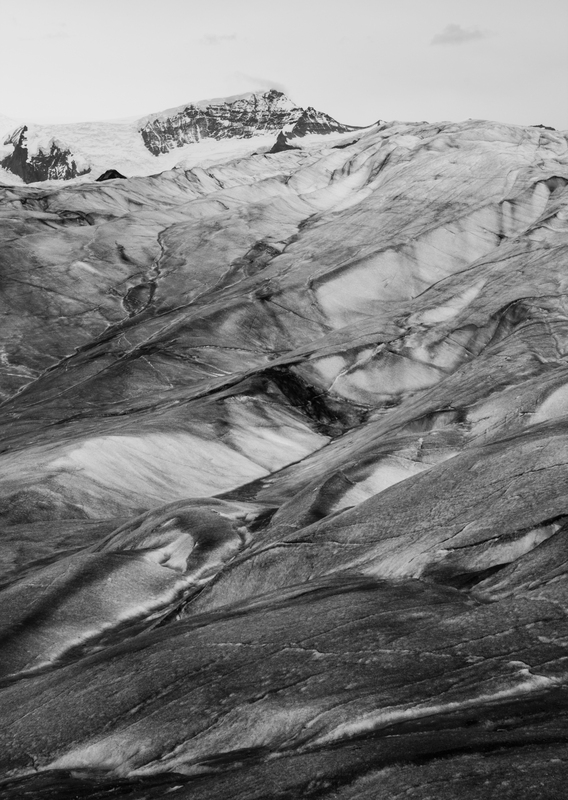 The debris covered terminus of the Kennicott glacier. 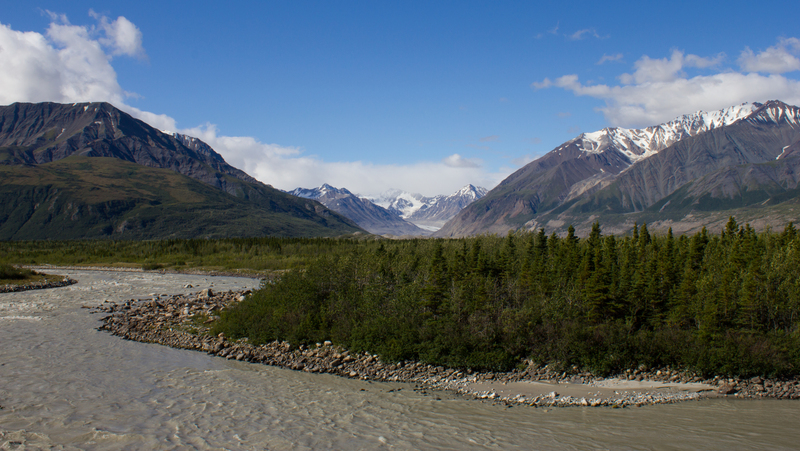 The village of Kennicott can be seen along the right margin. 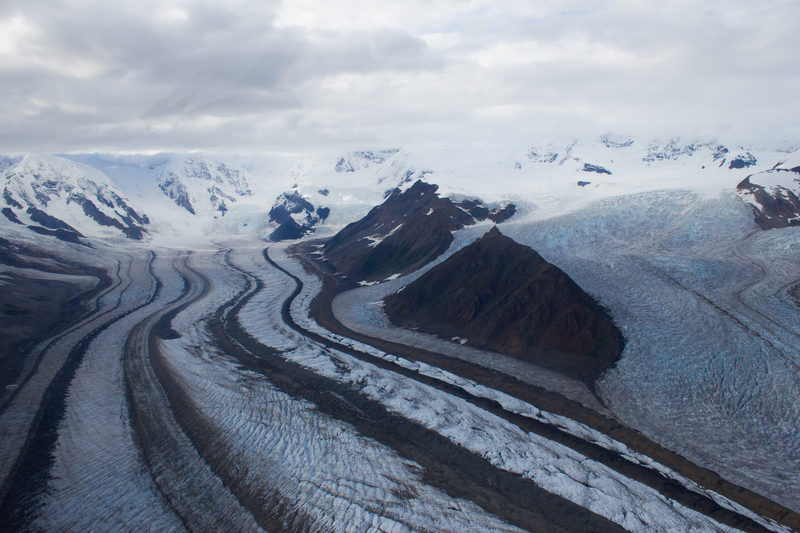 Further up the Kennicott, medial moraines are visible as dark bands on the surface, and are formed by the merging of several tributary glaciers (and their lateral moraines). 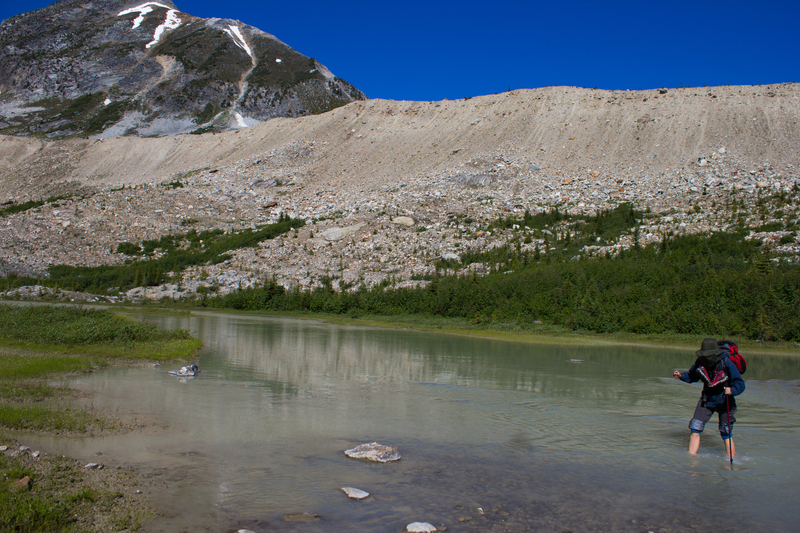 Medial moraines and incredibly blue melt water pools. 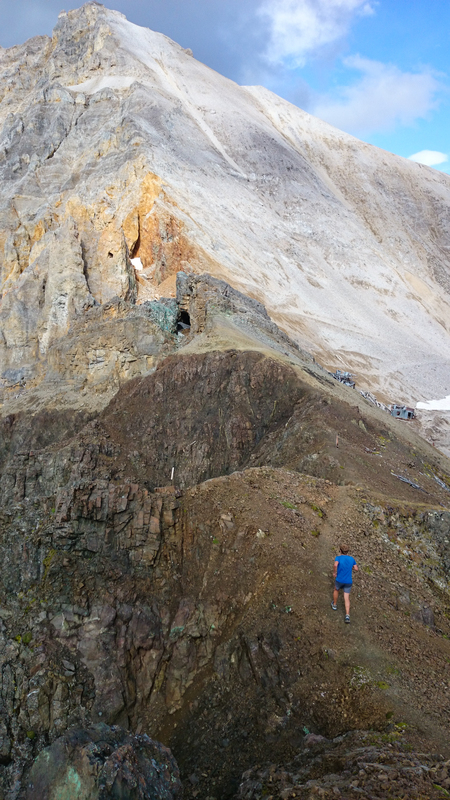 Trail run up to the old Bonanza copper mine, in the mountains above McCarthy (phone pictures). A very fuzzy picture of a black bear encountered during the run. 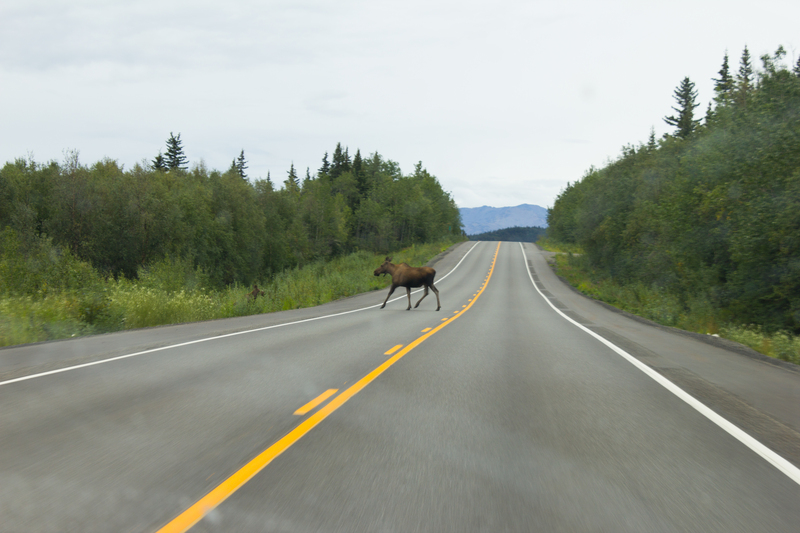 Obligatory moose, with calf (I was driving at the time). 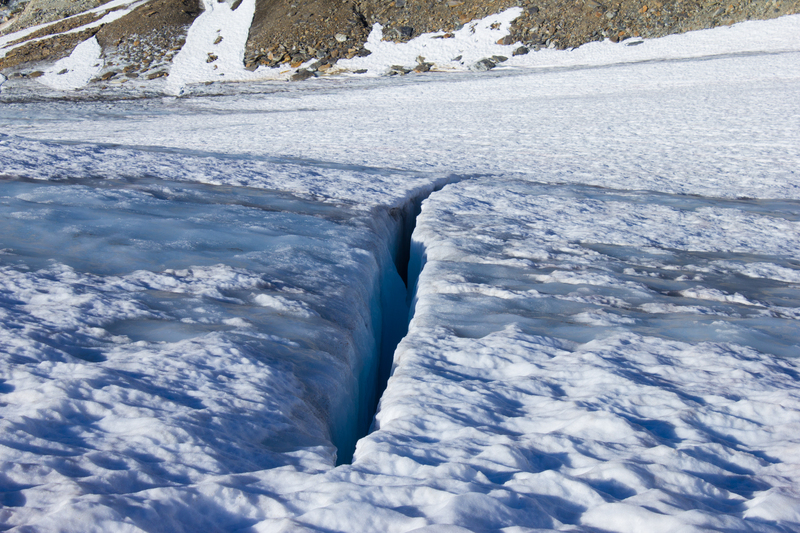 The winter snowpack was still hiding crevasses. 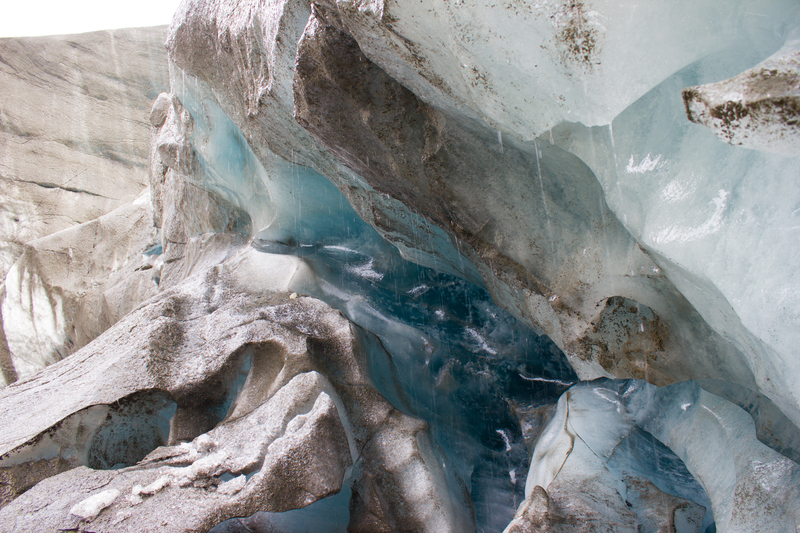 Where it had melted, large swaths of cracked and yawning ice had been exposed, hinting at what may lie beneath the snow cover. 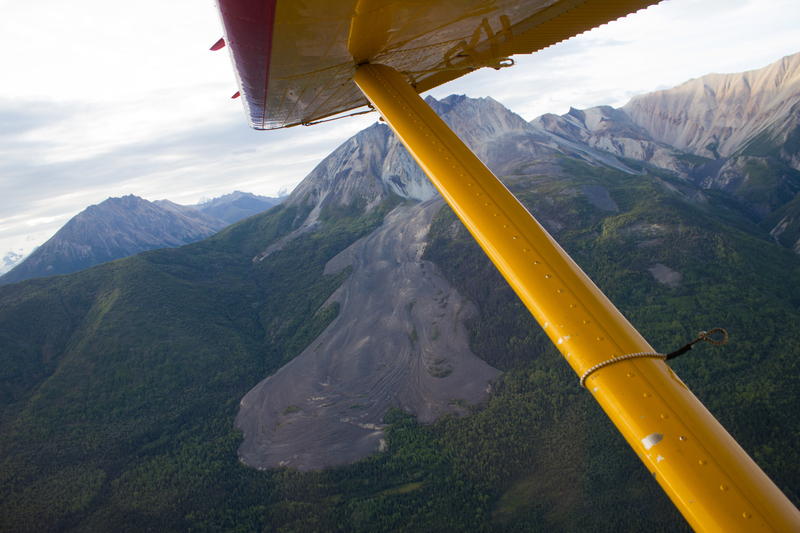 One day earlier, July 8th, Valentina Radic and I had left Vancouver, aiming for the town of Golden, near British Columbia’s eastern border. 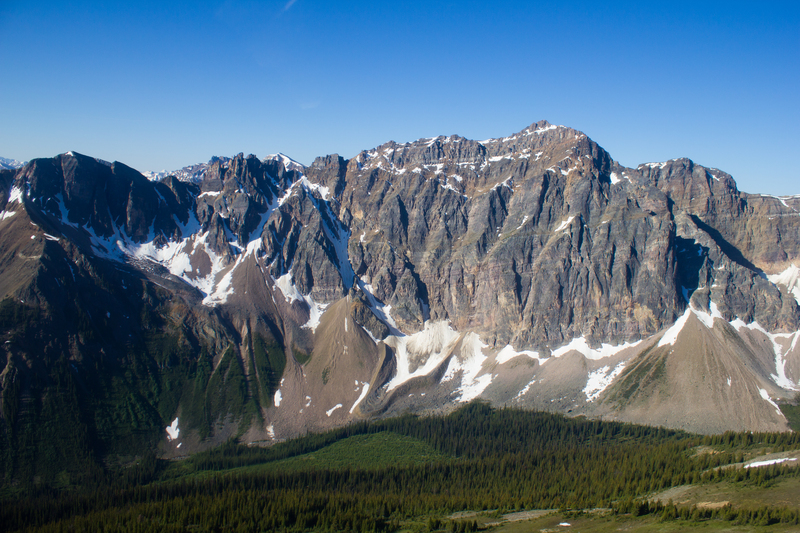 Our route brought us on a nine hour drive, passing from the Coastal Mountains, through the vast Interior Plateau, and into the Selkirk range near the edge of the Rockies. 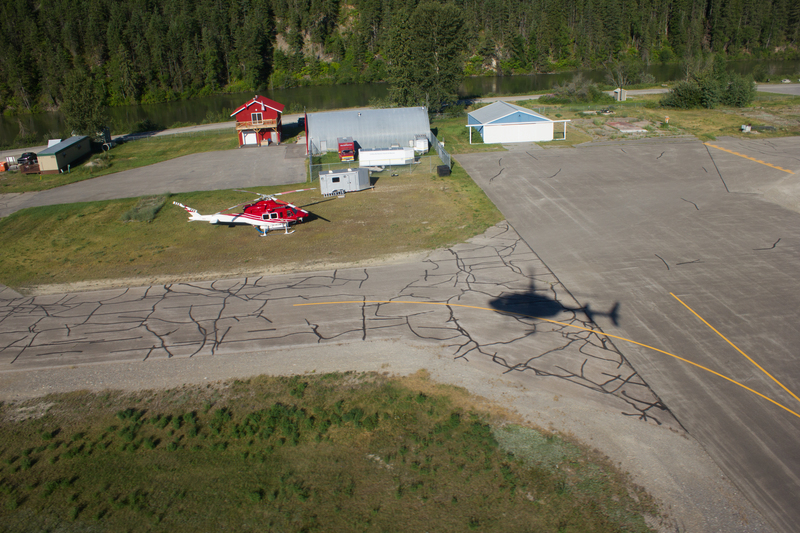 Golden was to be the staging point for this summer’s field campaign. 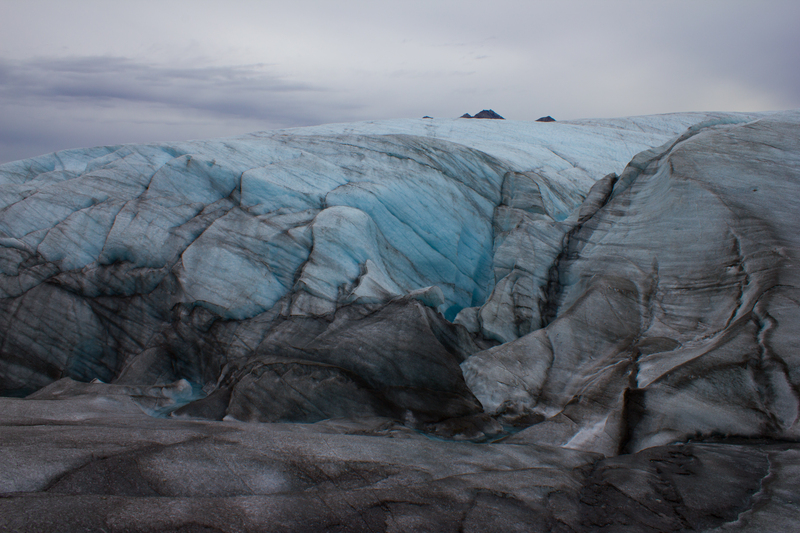 The plan was to install a weather and glacier monitoring station on Nordic Glacier. 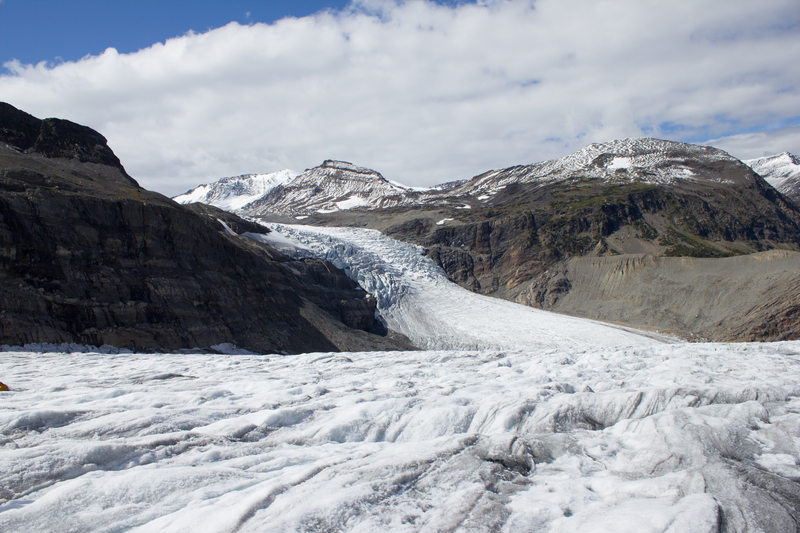 The station was to observe the melt rate of the surface of the glacier, and to record any meteorological varibles that may affect melting (see The Project). 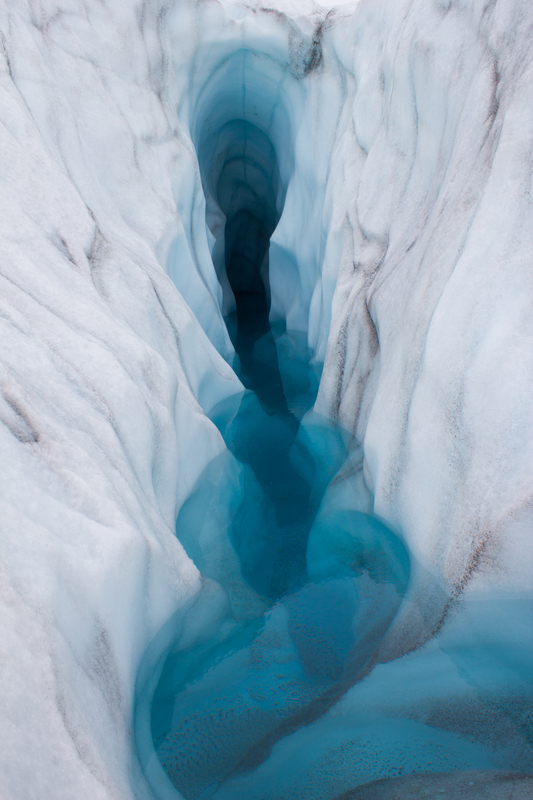 Nordic was selected as its meltwater drains into the Columbia river. 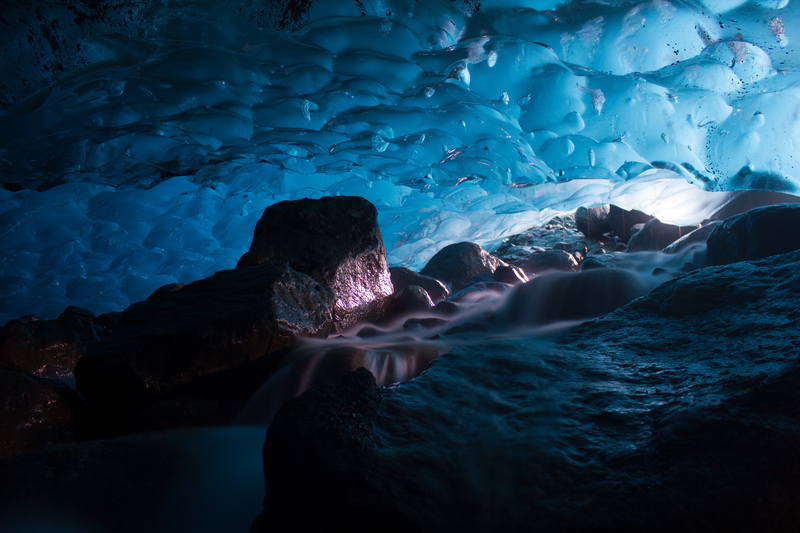 This is the largest river in the the Pacific Northwest, and the forth largest in the United States. 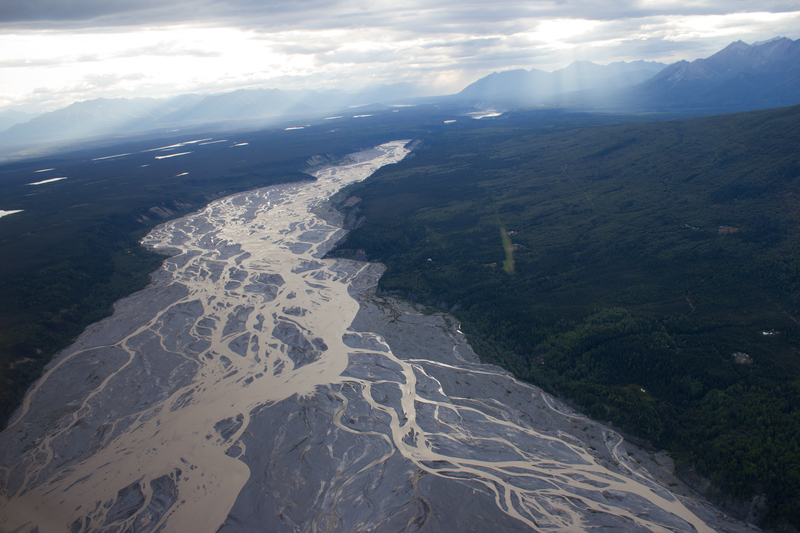 It stretches for 2,000km, through BC and seven US states, with a drainage basin the size of France. 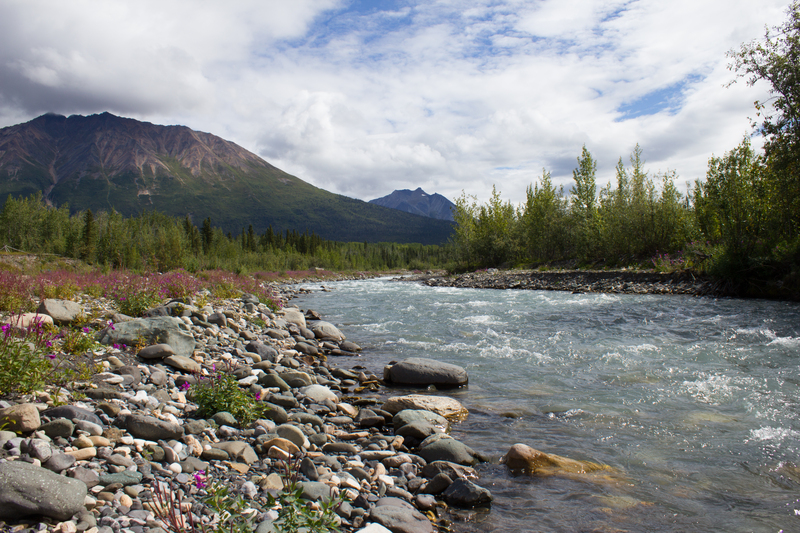 Its waters are used for irrigation and hydroelectric power production, with 14 dams on the main stem, and more on its tributaries. 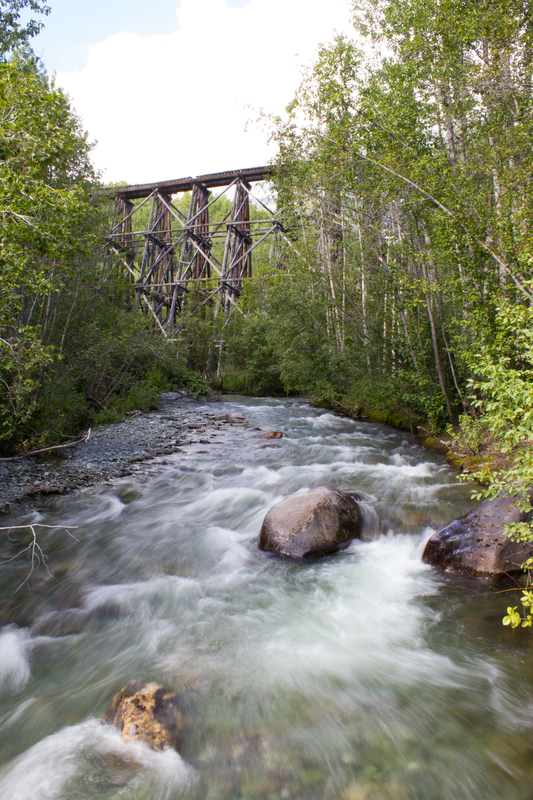 I had encountered the Columbia before, but much further downstream in the state of Washington, while rock climbing (see Vantage Point). 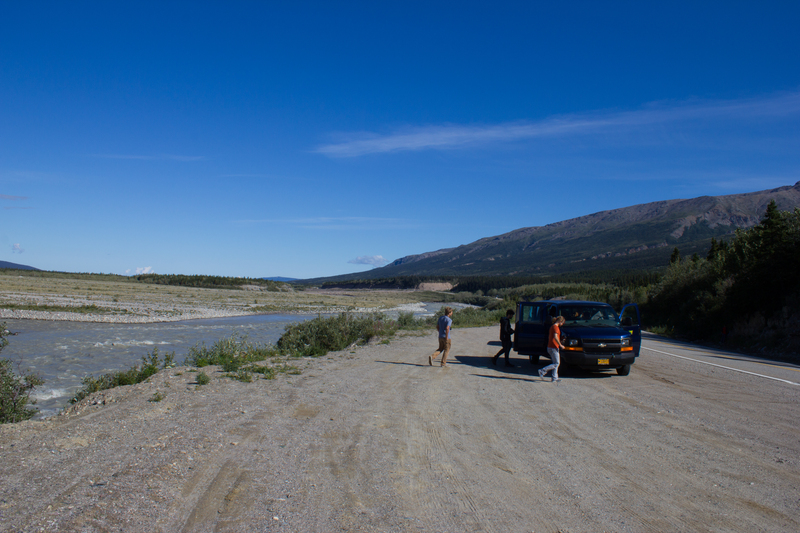 On arriving in Golden, we drove straight to the home of our hosts for the night, Tannis and Steve. 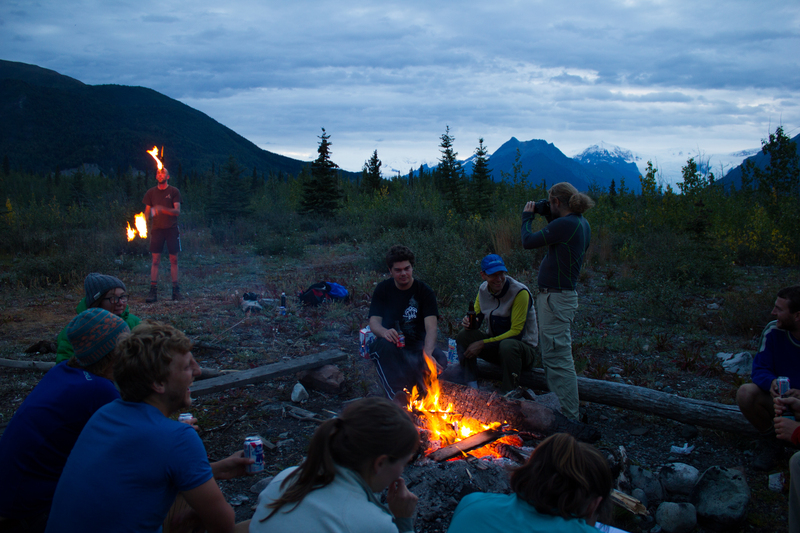 When initially planning this trip, we had intended to camp once we got into the mountains, but Tannis and Steve kindly offered us the use of their backcounty ski lodge (Sorcerer Lodge) which is located in the same valley as Nordic. 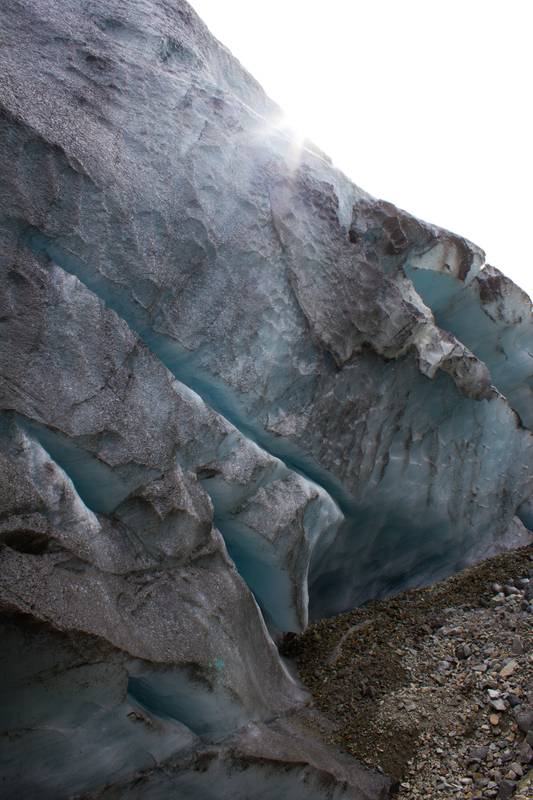 Operating in the area for over twenty years, they have seen firsthand the changes undergone by the glacier. It was inspiring to see the interest and enthusiasm (and knowledge) that they showed for the project, and was a reminder that this research wasn’t just an academic exercise. 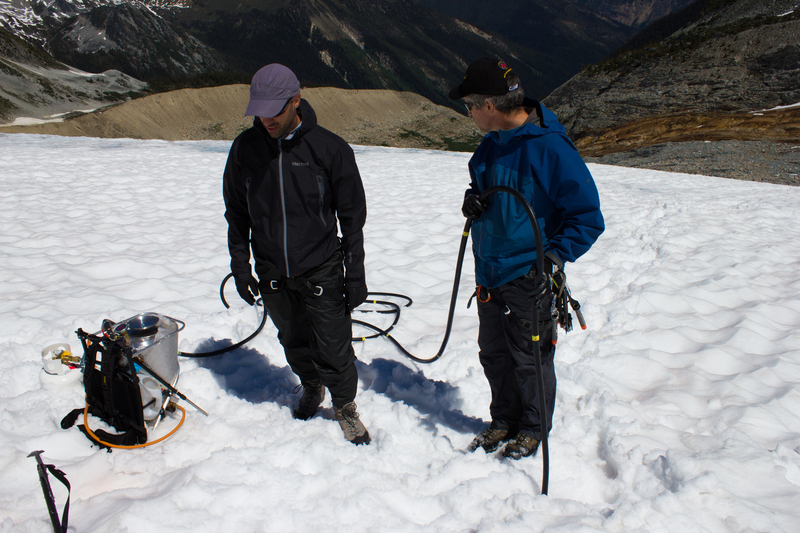 Joining us in Golden were Brian Menounus and Federico Ponce, two researchers from the University of Northern British Columbia. 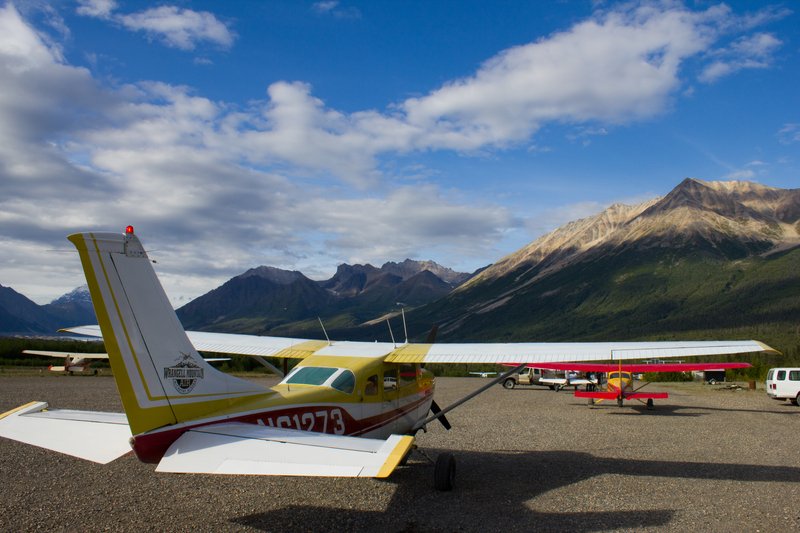 With our team of four assembled, we stocked up on some soon to be burned calories (with excellent burgers in Golden), and bedded down for an early departure. 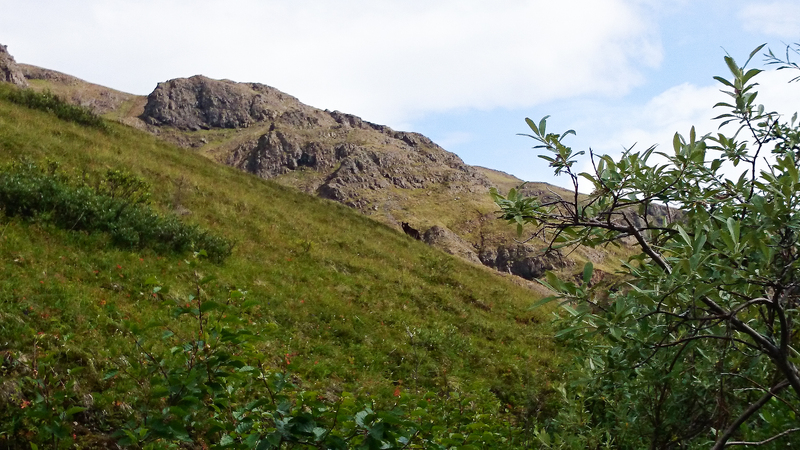 Ascending the valley towards the mountains. 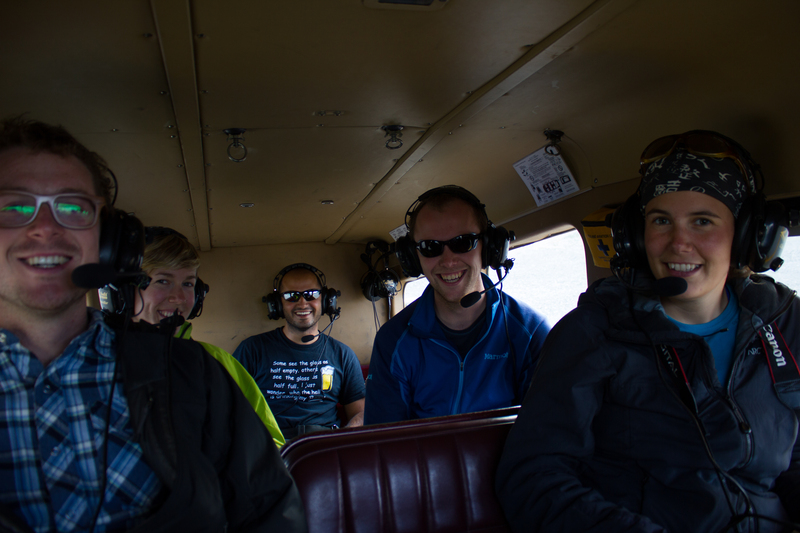 Our flight to the glacier the following morning went smoothly, with Steve lending us his experience with helicopter transports. 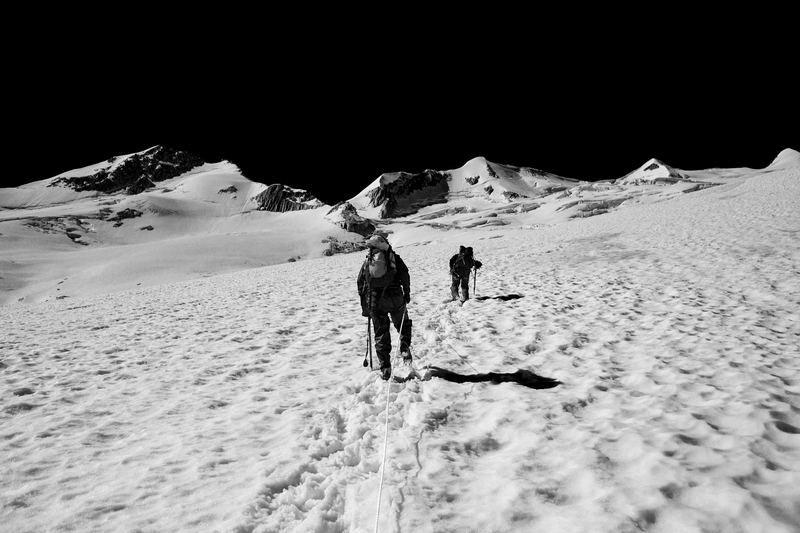 Valentina and I went in on the first run to scan for a suitable site for the station, and to get dropped off on the glacier with the main equipment for the station. 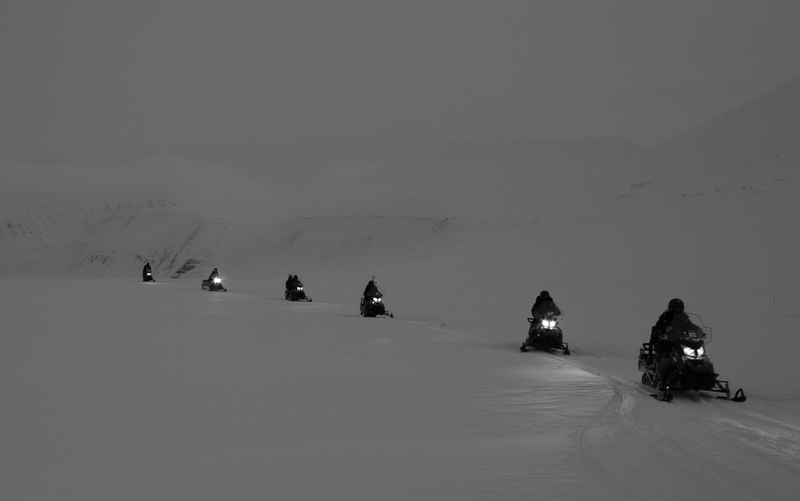 Brian and Federico were to travel in on the second run to bring equipment to the lodge. 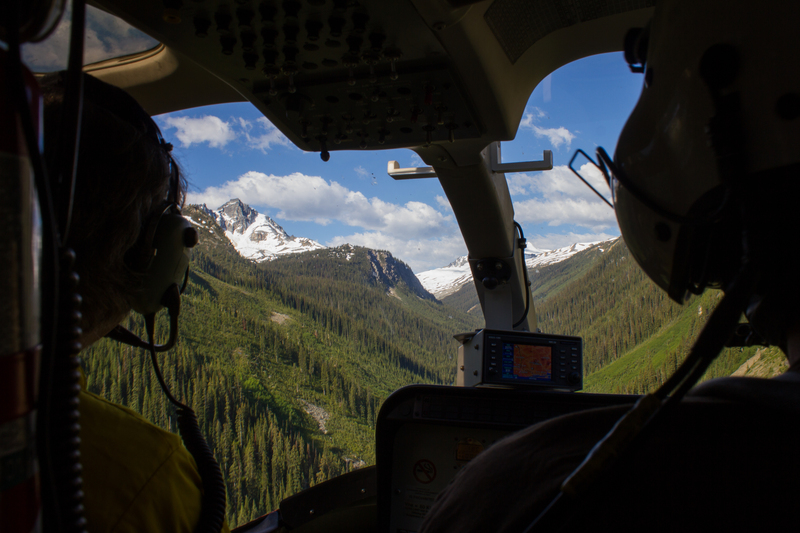 After several months of looking at Nordic in photographs and maps, seeing it grow larger through the window of the helicopter, I felt excited and nervous. 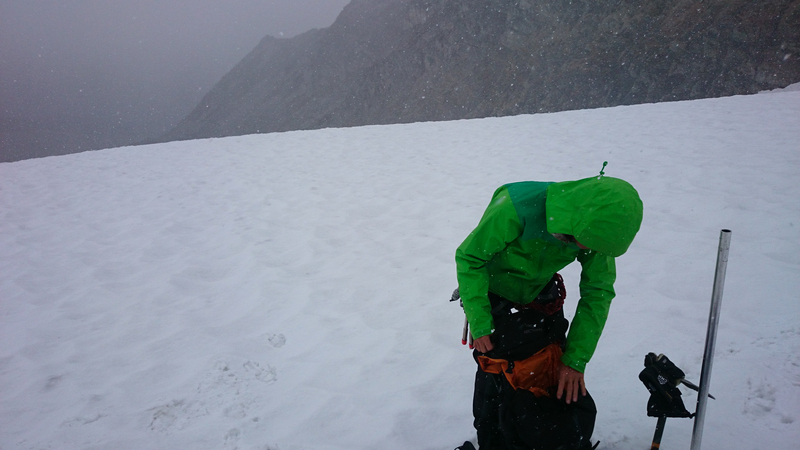 As we drew closer however, I was concerned to see the extent of the snow cover in the area we had been planning to deploy. 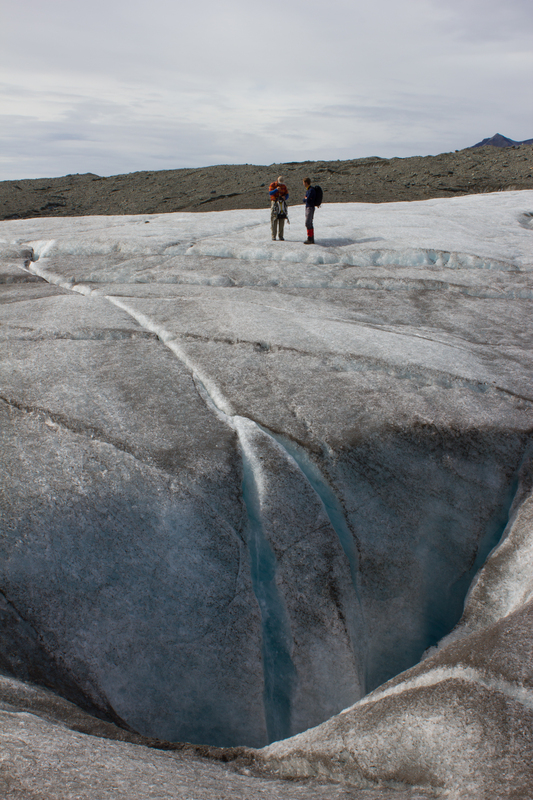 Working on a ‘dry’ section of a glacier (where there is no snow) has the major advantage of being able to see the location of the crevasses. 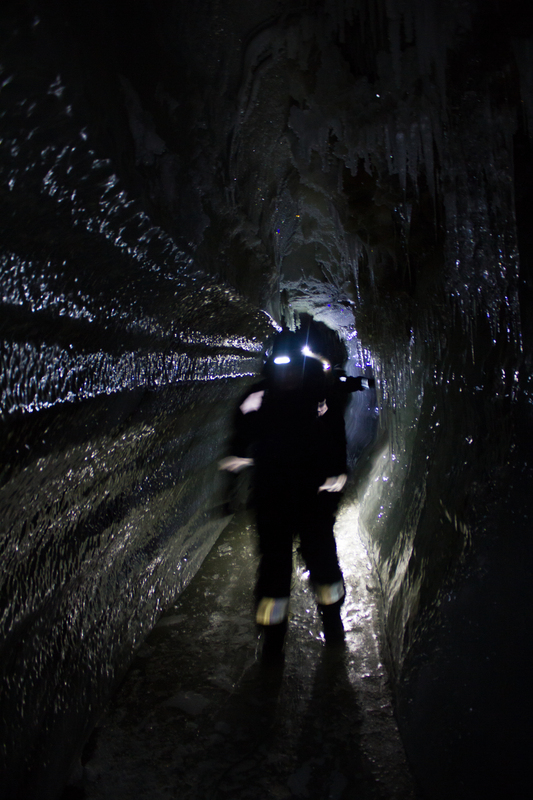 Not only is this much safer, it allows you to move and work more efficiently, as precautions such as being roped together are not necessary. 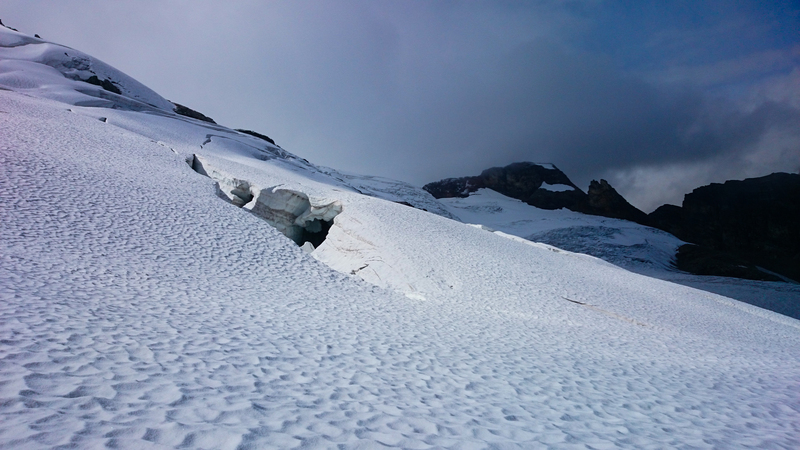 We had hoped that the winter snow pack would have melted from our site by the time we arrived, but it appeared that, for this season, we were a little early. 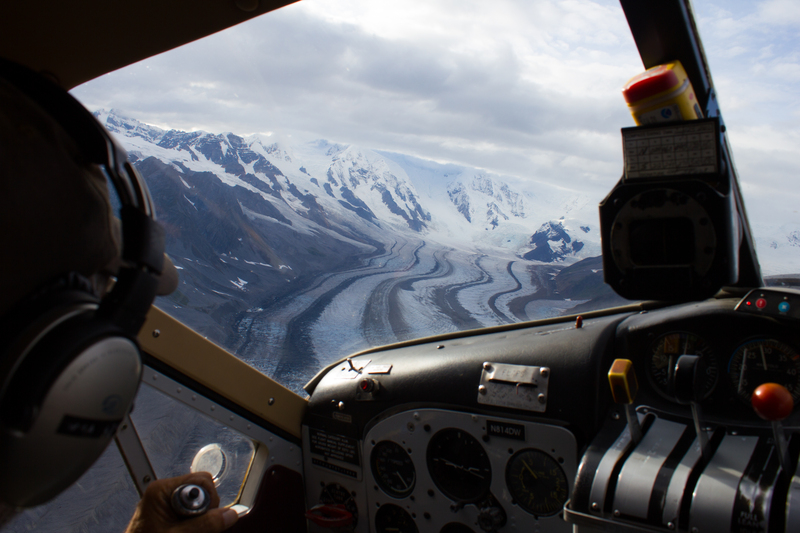 Initial fly over of the glacier to select a suitable site. 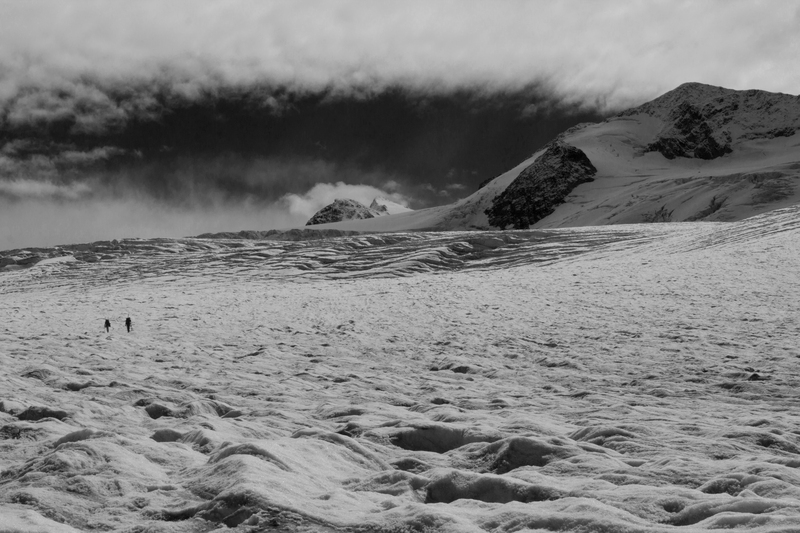 It became apparent at this point that there was still significant snow cover. 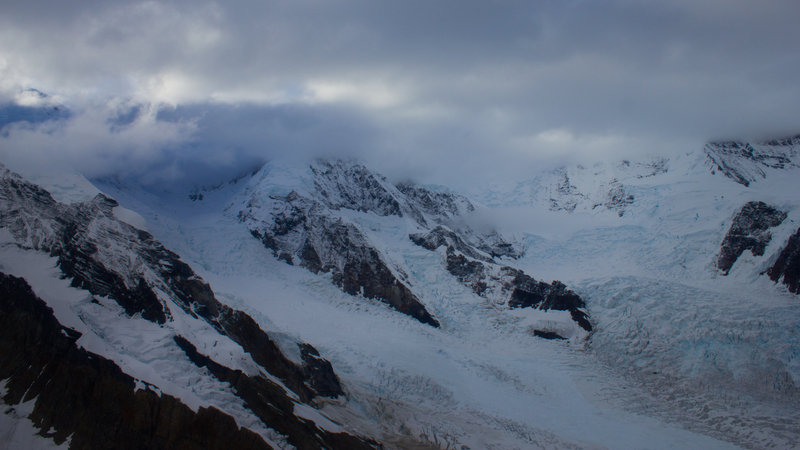 We landed on the glacier, and unloaded our equipment with the engines still running. 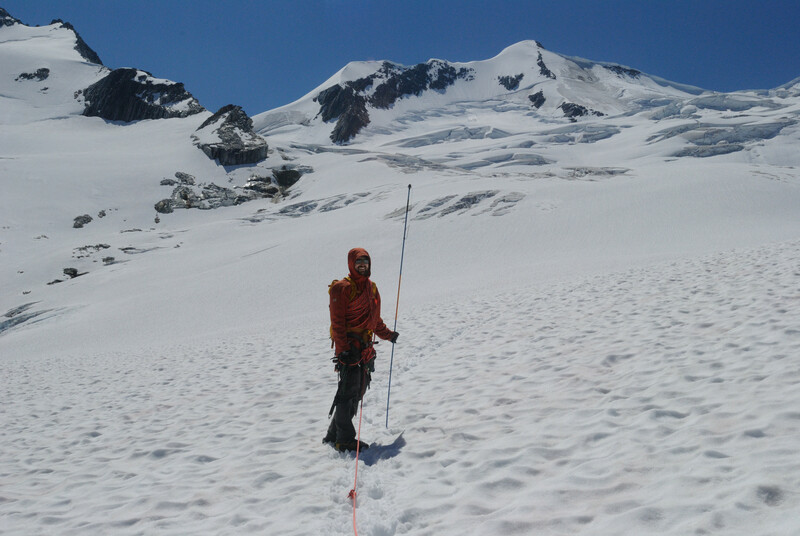 As soon as we were clear of the downwash from the departing helicopter, we roped up and started surveying the area for the flattest spot for our station, probing the snow as we moved to check for crevasses. 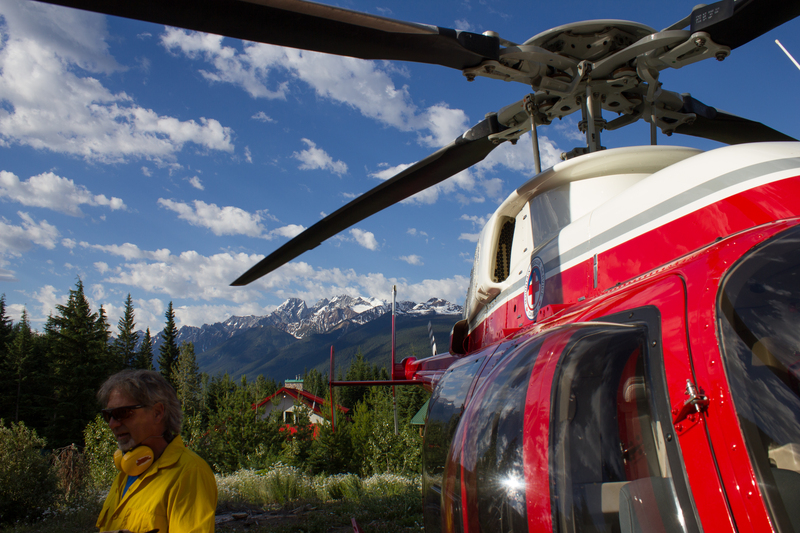 After the helicopter returned to deposit the larger pieces of equipment, we flew down as far as the lodge to meet with Brian and Federico. 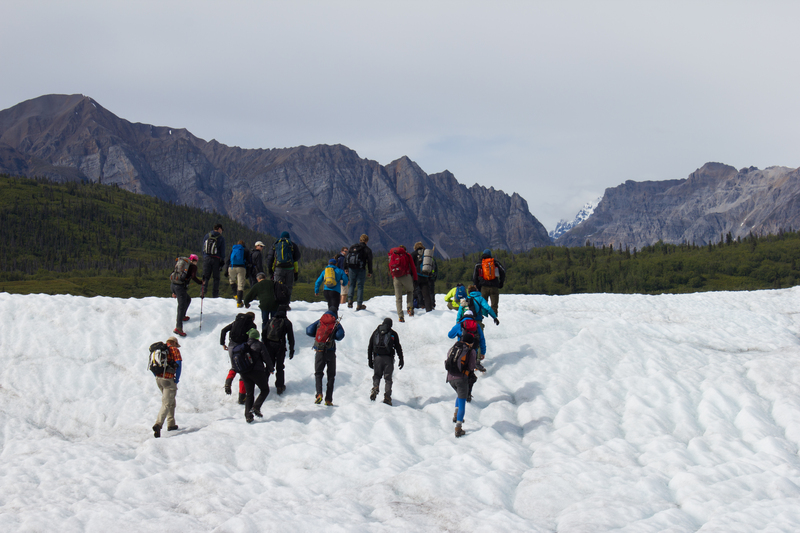 With conditions the way they were, we decided we would hike up to the glacier together, and find the safest route to the site. 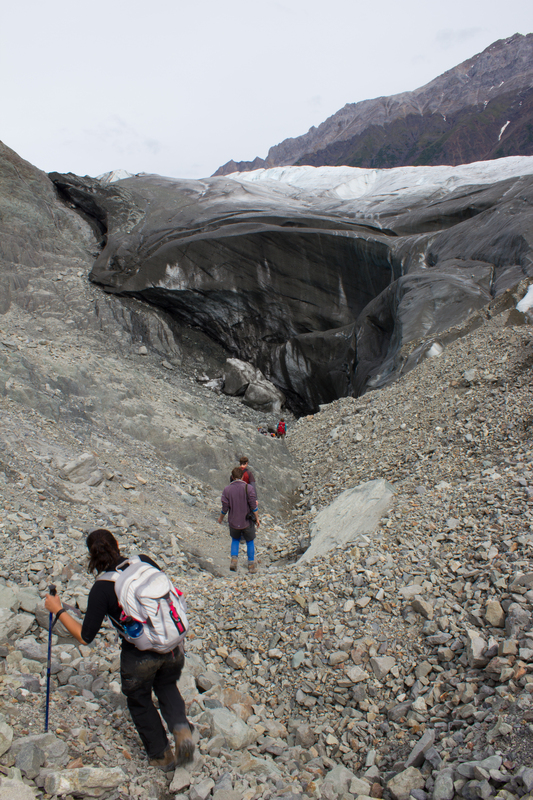 Traversing the moraine at the beginning of the hike to the glacier. 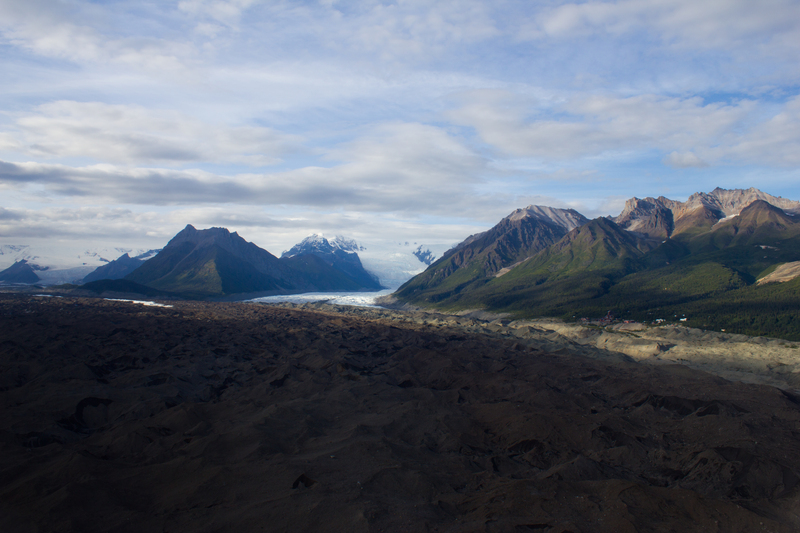 Smoke from forest fires further down the valley can be seen hanging in the background. 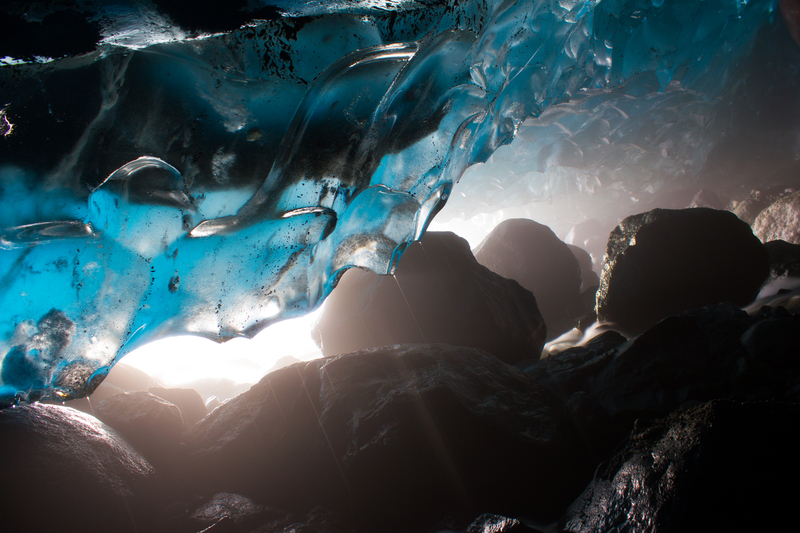 Nordic Glacier. 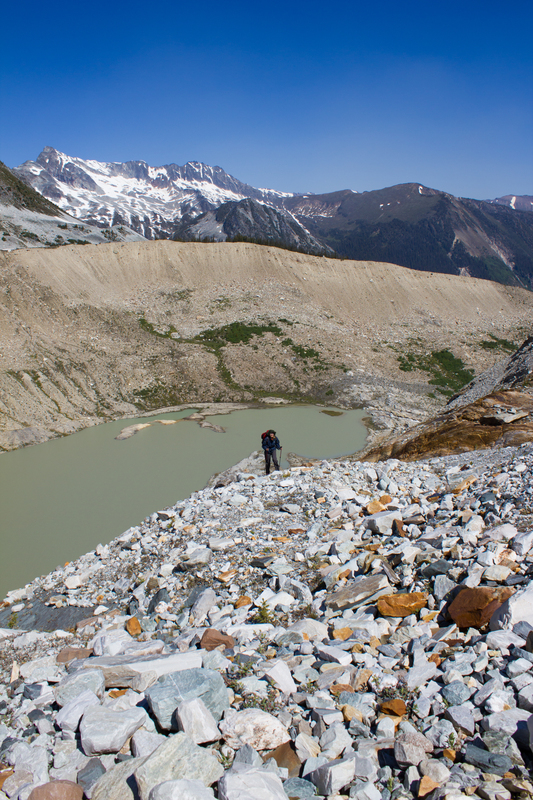 After descending the moraine, our route crossed the river, and followed the base of the mountain on the left side of the image as far as the patch of rust coloured rock to the left of the upper lake. 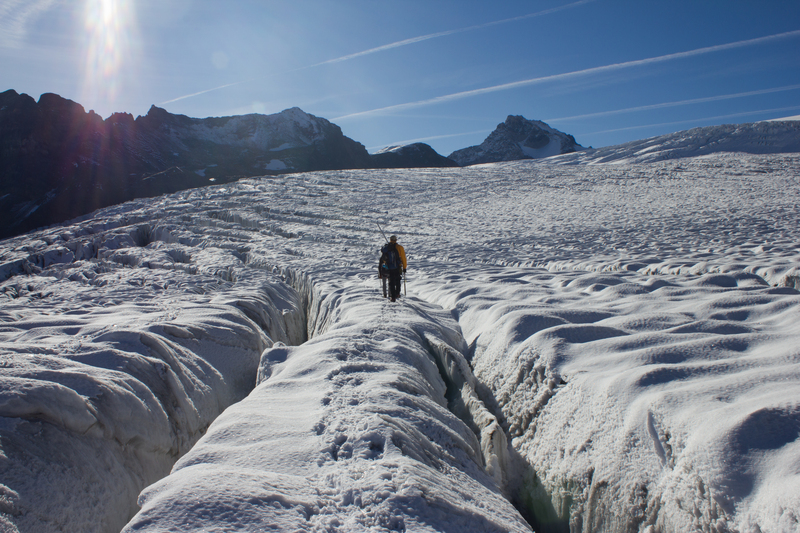 This marks the beginning of the ‘Wedding Band’, which we ascended up to the left to gain access on to the glacier. 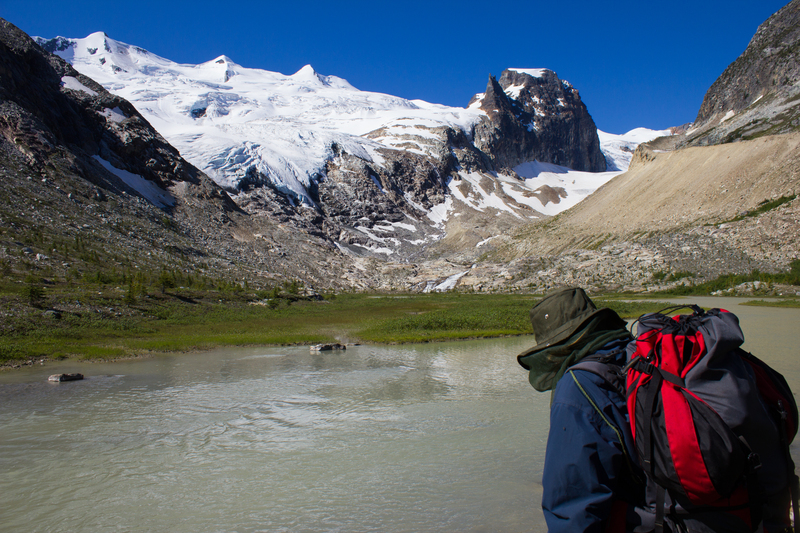 Each day, our hike to the glacier would begin with crossing the lateral moraine that separated the lodge from the main valley. 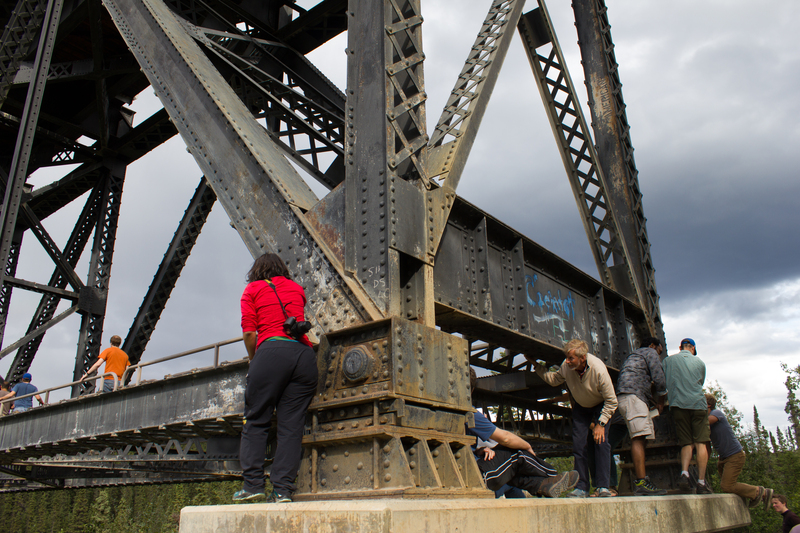 From there, we would descend and traverse the valley to the other side, crossing the river to do so. 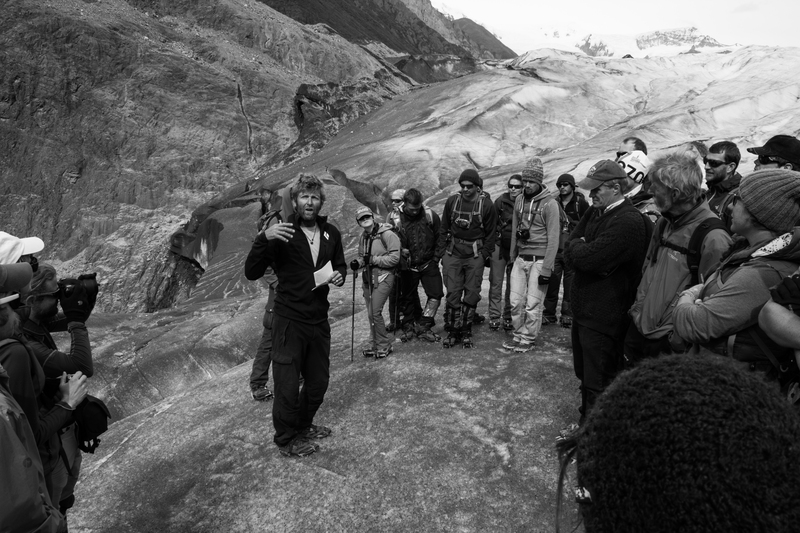 The river crossing was a glacier monitoring exercise in itself. 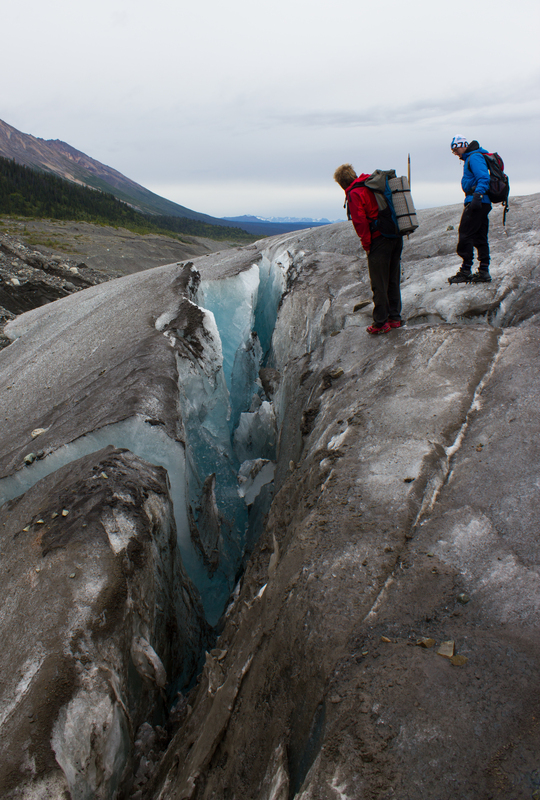 As the river’s source is the melt water draining from the glacier, there was a distinct daily pattern in the strength and level of the flow. 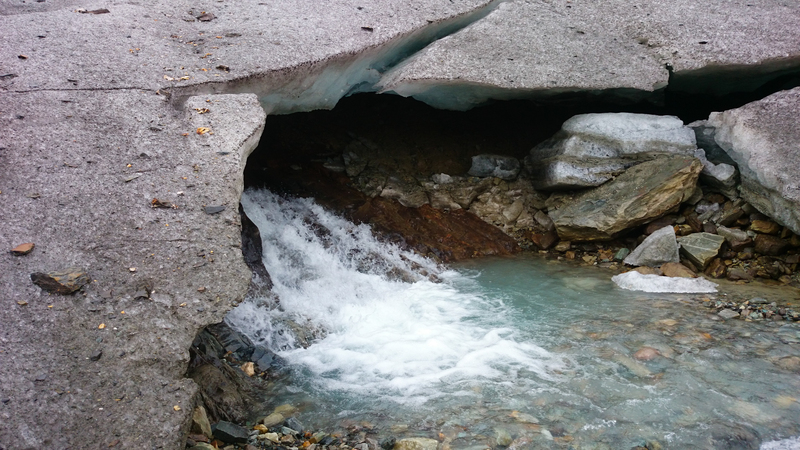 In the morning, when there had been little melting during the colder night temperatures, the water level would be well below my knee. 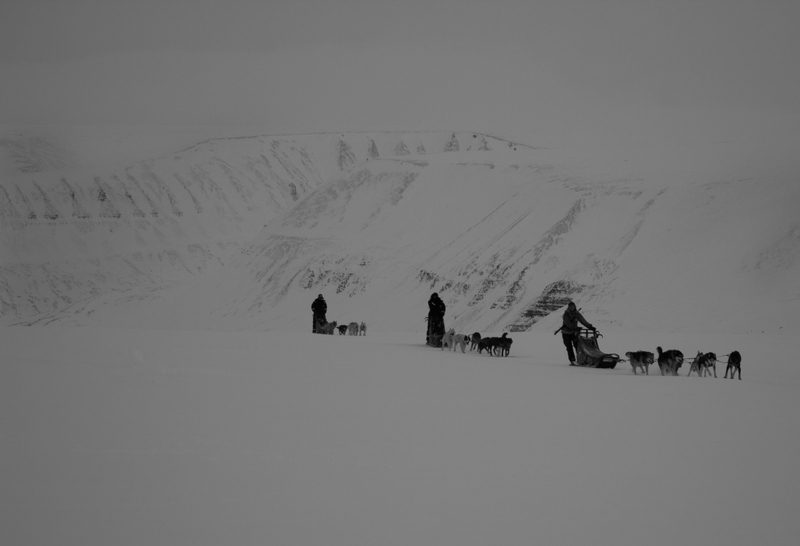 Returning in the evening, after a day of warm temperatures and sunshine, the flow would be much stronger, pulling at already tired legs. 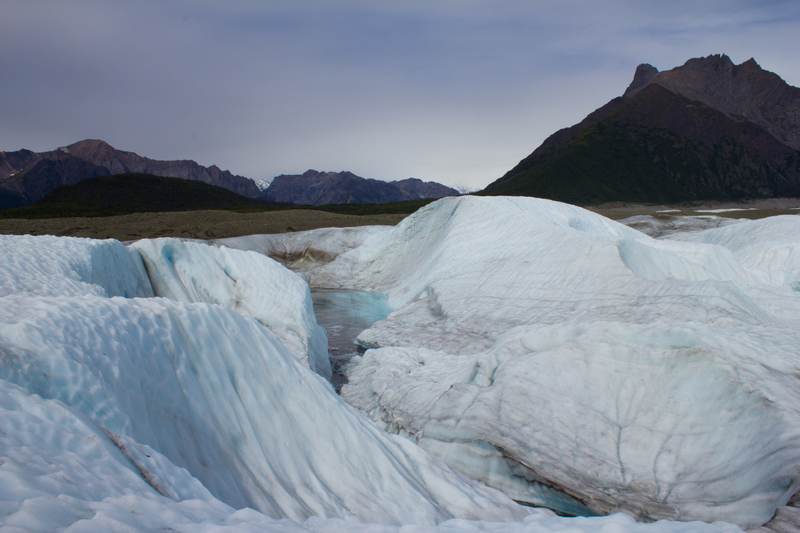 As you’d imagine, the water was pretty cold, and it was incredible to feel how quickly your heat could be drained away. 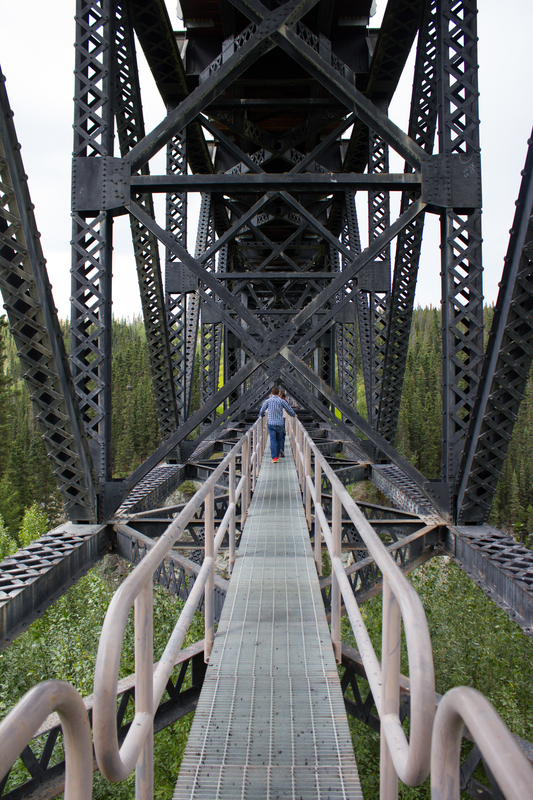 Approaching the crossing. 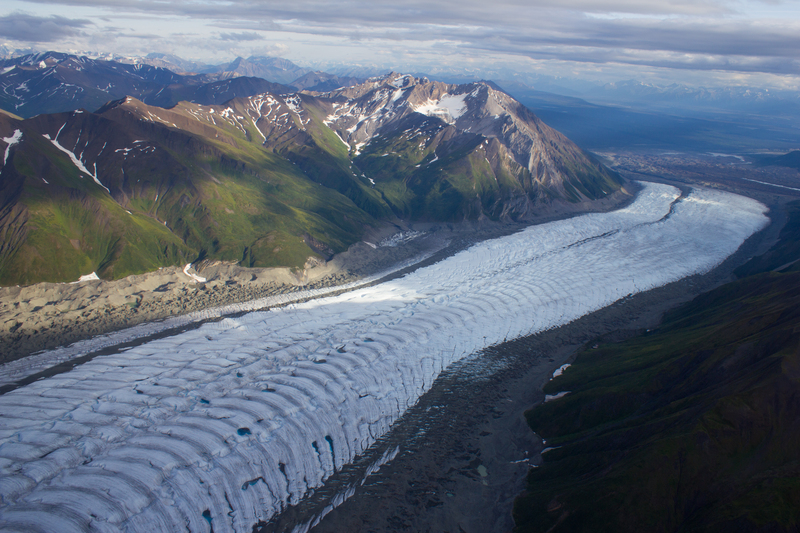 The river is fed directly by melt water from the glacier, meaning its temperature is very cold, and its flow varies greatly with the time of day. 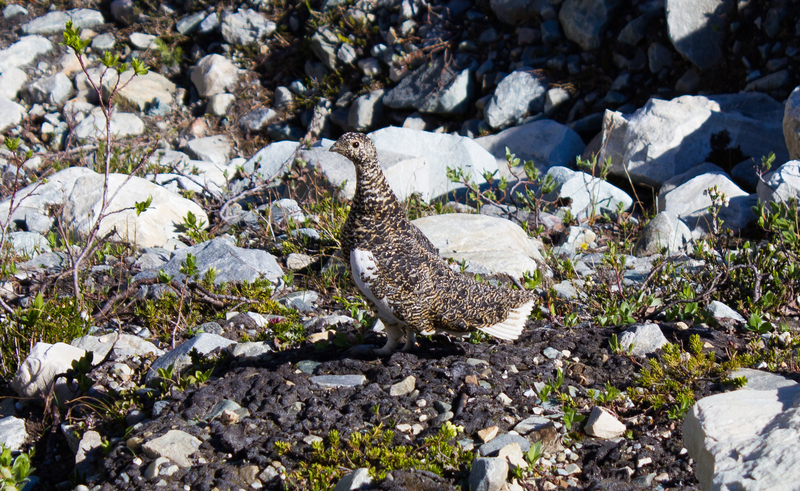 Rock Ptarmigan. 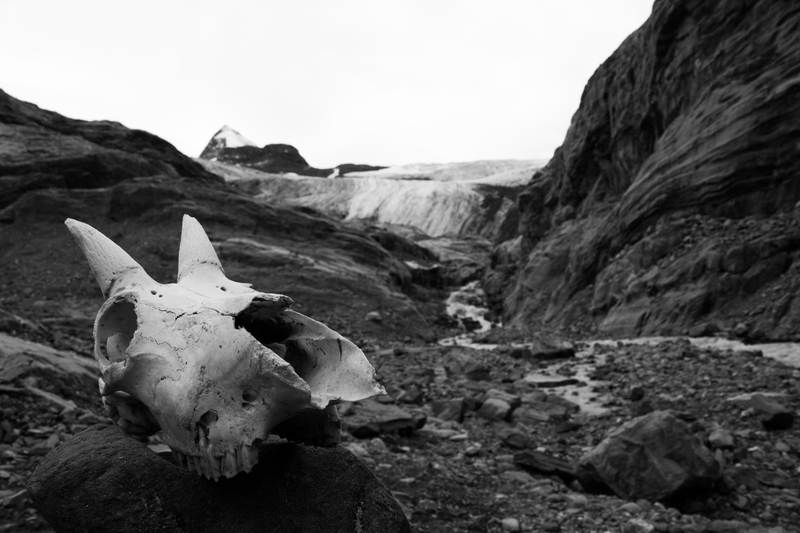 I came across quite a few of these, usually only noticing them when I was within a couple of meters, and they would burst from behind a rock , freaking me and themselves out. 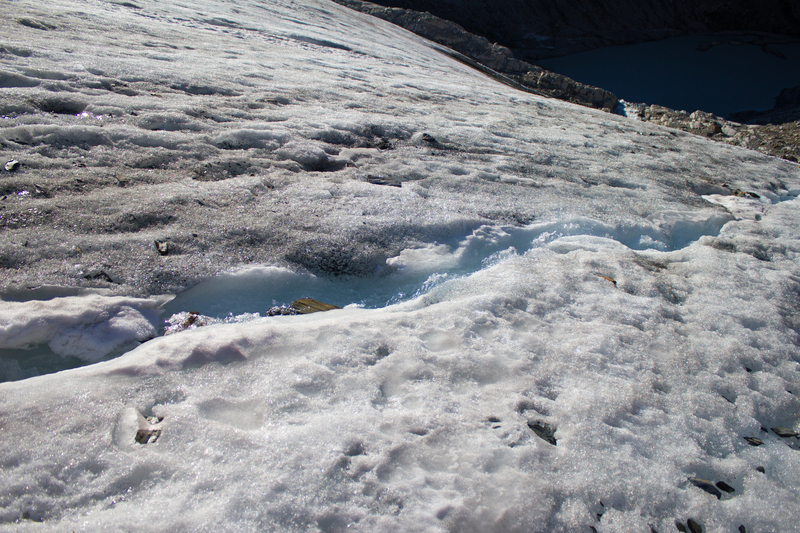 Ascending alongside the glacier, significant crevasses were visible in the ice where the snow cover had melted. 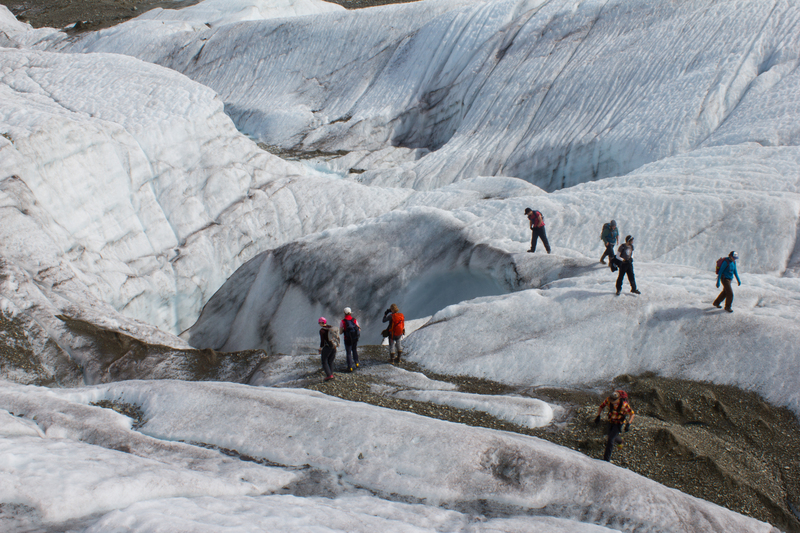 Setting out on the glacier towards the site where we had deposited our equipment by helicopter. 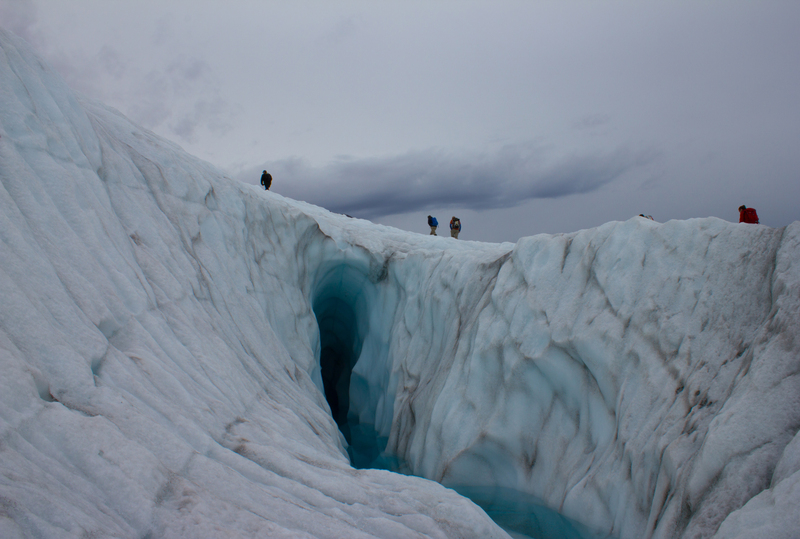 Probing for crevasses on the snow covered sections of the glacier (Photo by Valentina Radic). 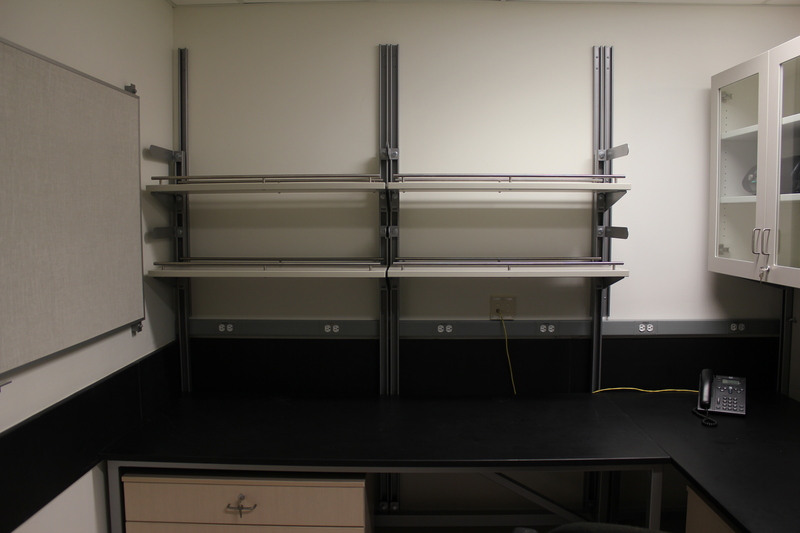 Installing the station came together relatively quickly. 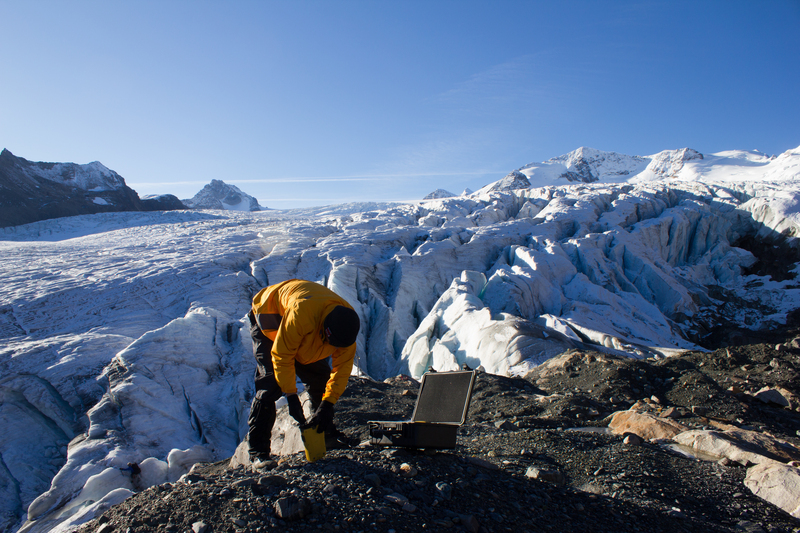 Although the glacier is a very different working environment to the lab or test field, I really felt the benefit of all the trial runs and lab assemblies. 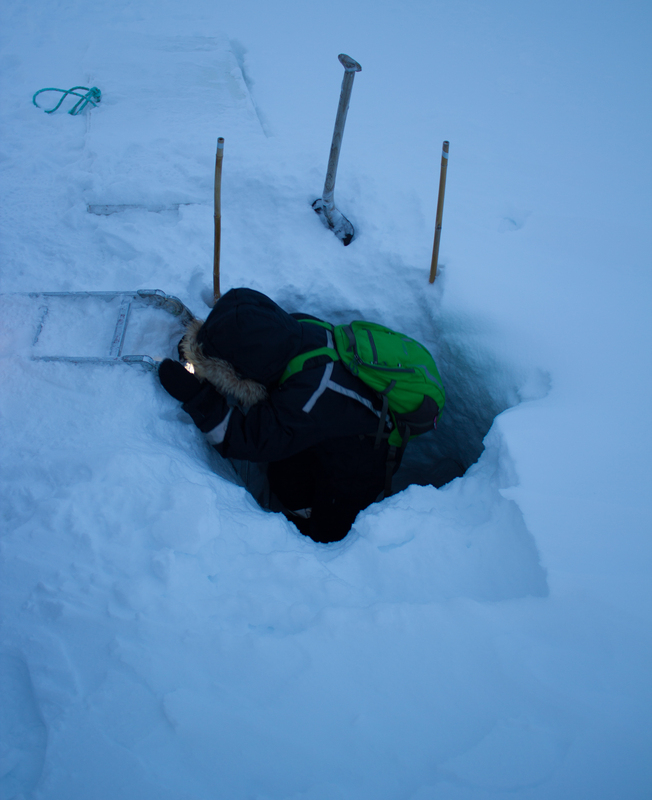 The station was constructed, wired, and operating after one, albeit long day, and it was fantastic to have the additional manpower of Brian and Federico, who obliged me with some serious ice drilling. 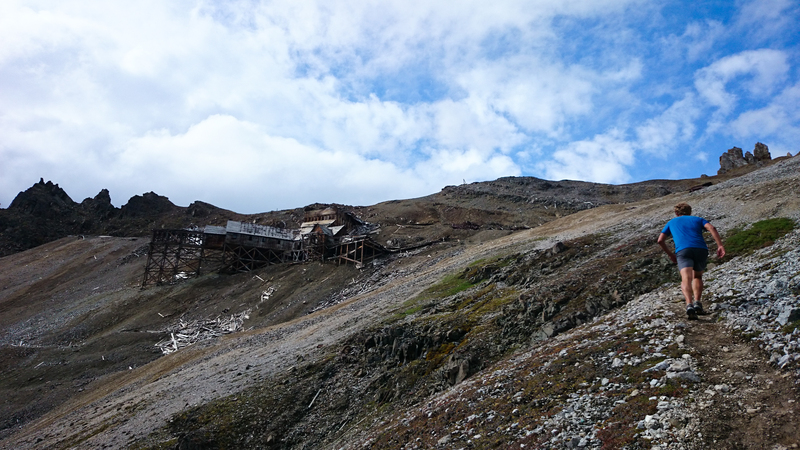 A second day was spent testing to see how the data and power system was performing, and also securing the various components of the station in preparation for two months on the side of a mountain. 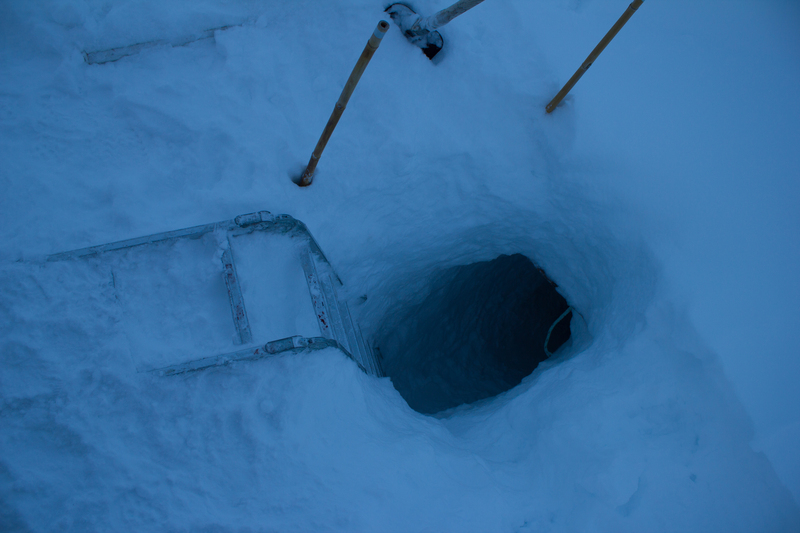 A combination of steam drilling (above) and augering (below) was used to bore holes into the ice for mounting some of the sensors. 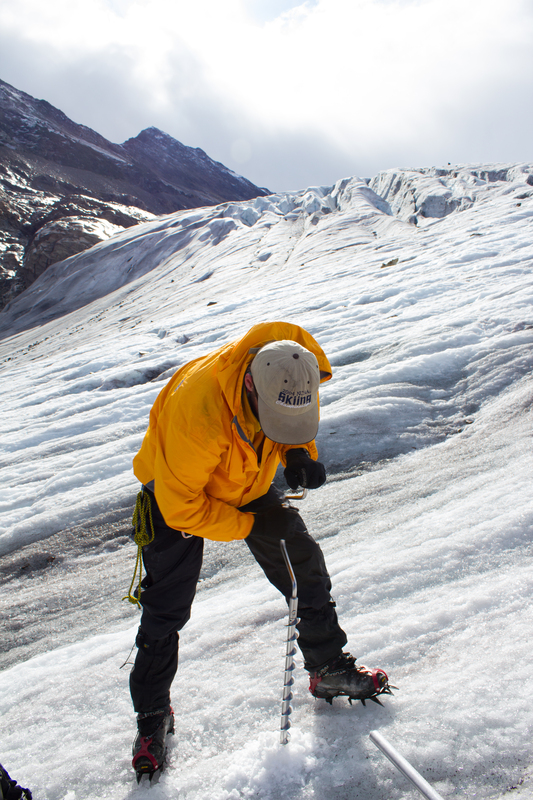 Mounting and wiring the sensors on the main ‘quadpod’ (Photo by Federico Ponce). The completed station, looking northwest. 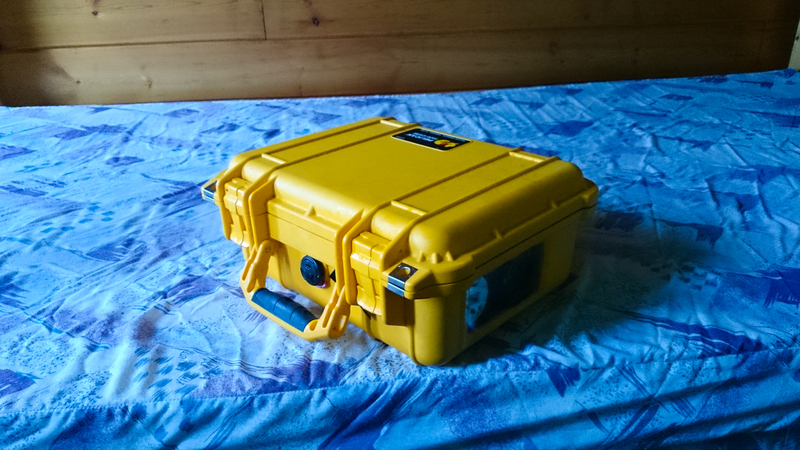 The solar panel can be seen in the left background, which recharges the batteries housed in the yellow case. 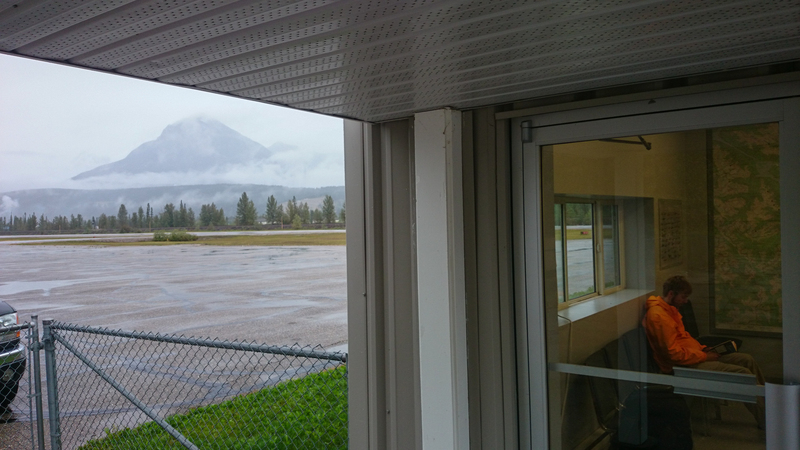 The rain gauge and the snow/ice level monitor mast is behind the main station. 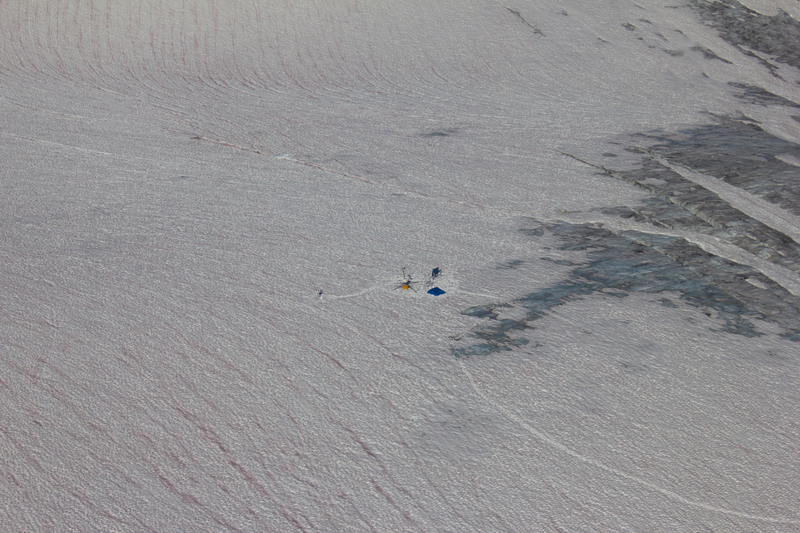 The blue tarp contains the tools and equipment used for the installation, and will be left secured on the glacier until the station is dismantled. 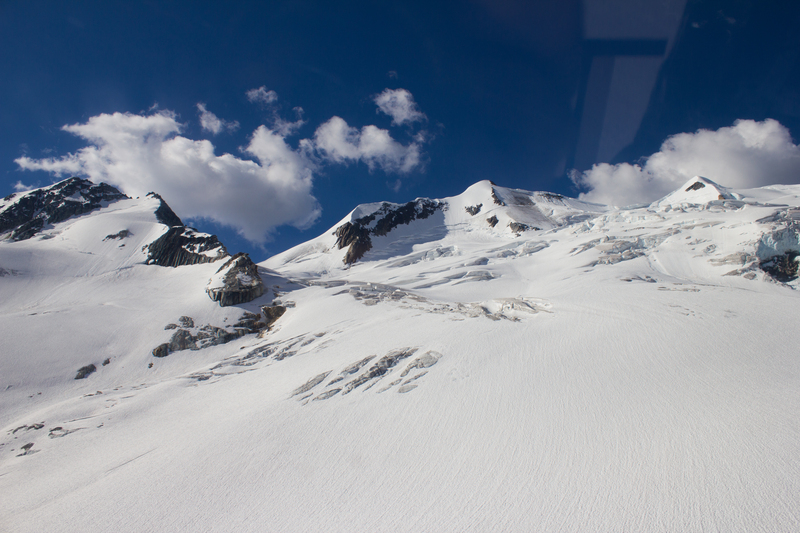 A camera for monitoring the glacier and the station over the season (see A Camera For all Seasons) was installed to the south, with its view similar to the previous image. 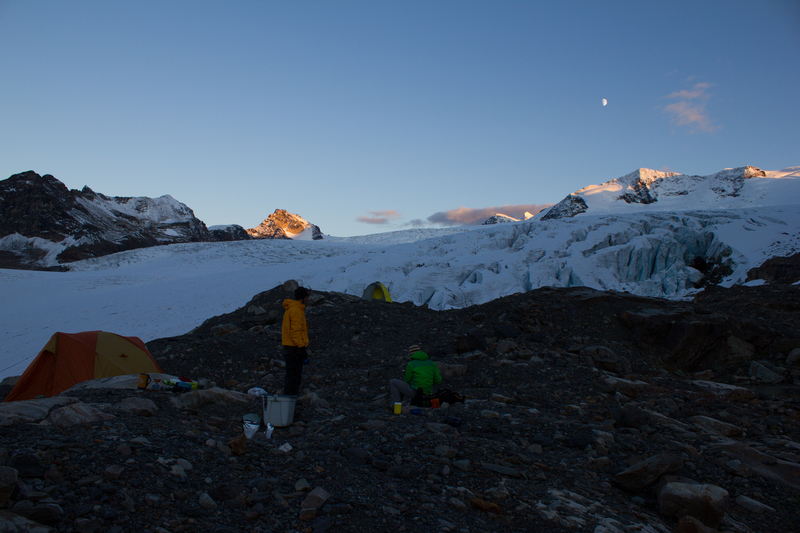 The weather during our field work was relatively warm and sunny, and we would notice a significant difference in the surface of the glacier between ascending in the morning and descending in the evening. 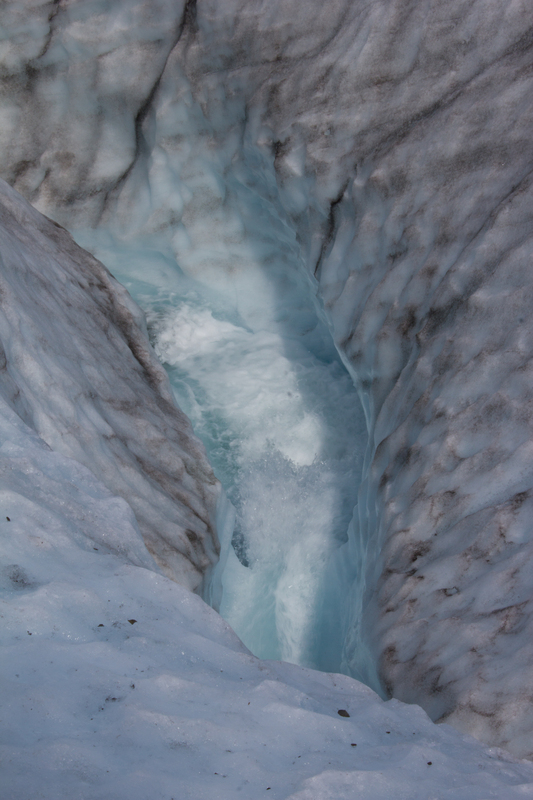 Crevasses and meltwater streams were appearing as the summer melt season kicked in. 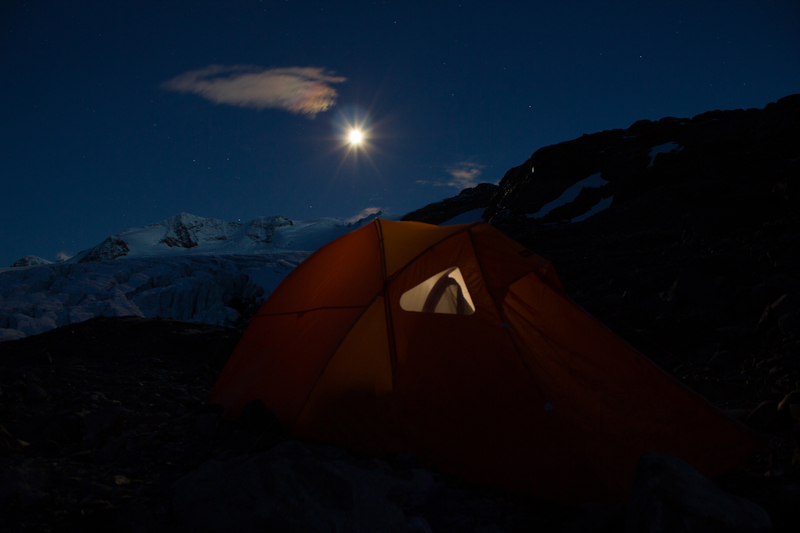 Mohammed Ali once said, ‘it isn’t the mountains ahead to climb that wear you out; it’s the pebble in your shoe.’ In this case, it was the mosquito inside your mosquito net. 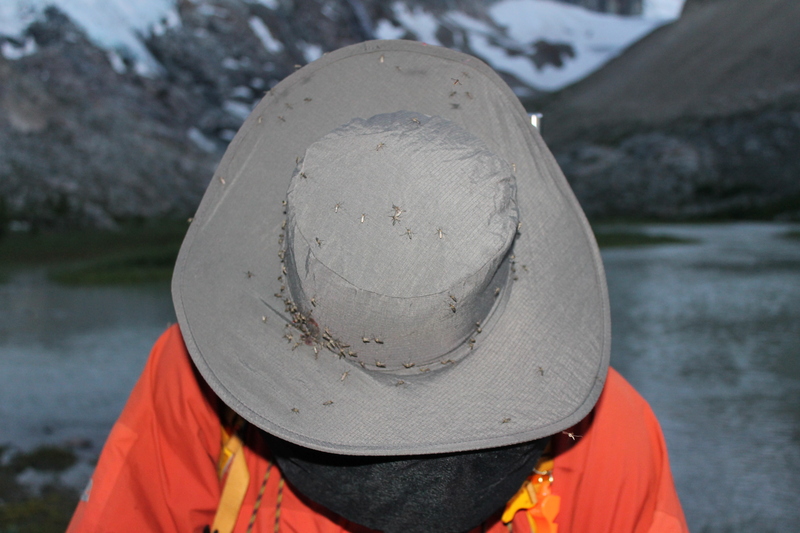 We carried out our field work during the buggiest few days of a particularly buggy season, and these mosquitoes couldn’t believe their luck when they saw us coming. 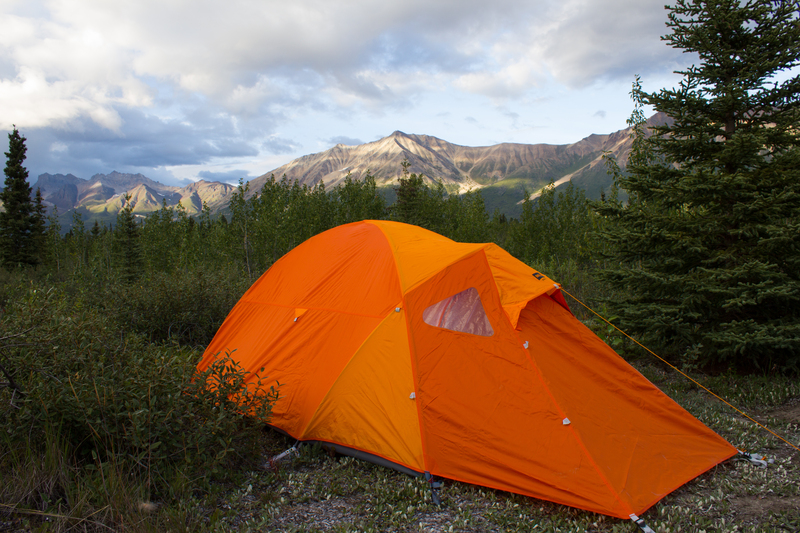 I’ve spent time in the Amazon jungle, and this was comparable. Once on the ice however, the buzzing clouds would disappear, and we could work in peace. My buzzing hat. 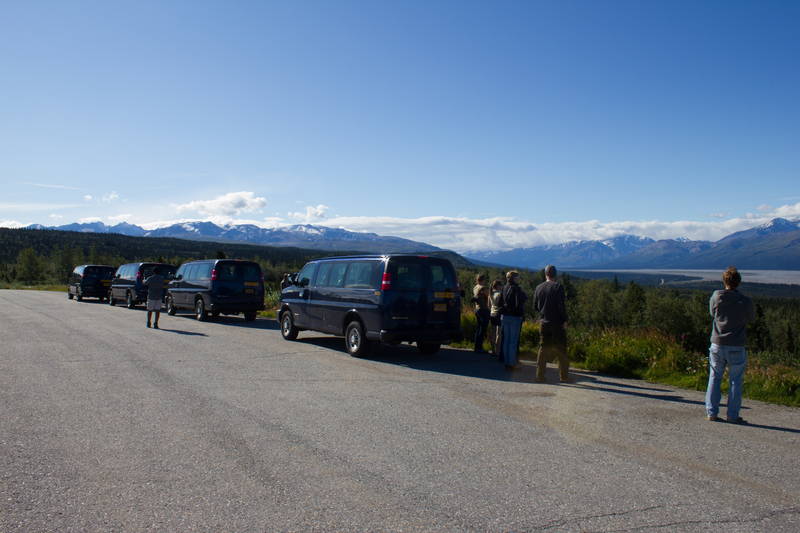 The locals were out in force to welcome us (Photo by Federico Ponce). 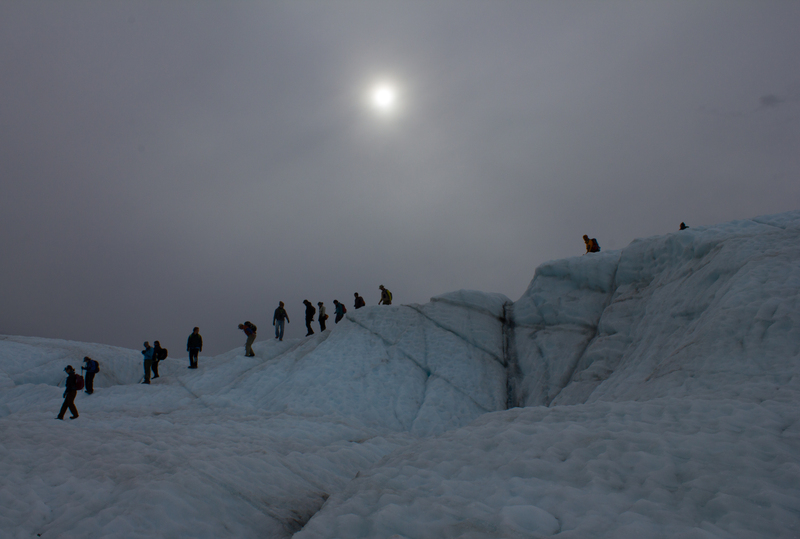 Each evening, with duties on the glacier finished, we would begin our return hike back to the lodge. 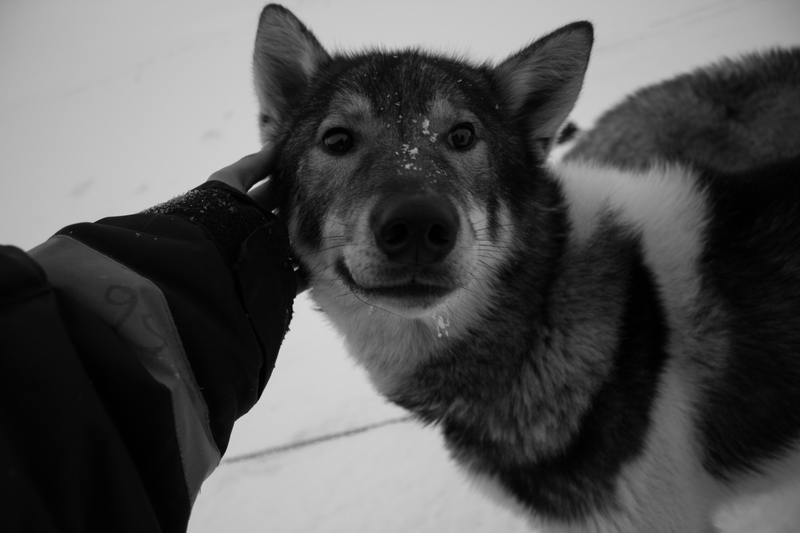 Despite being tired, this was always my favourite part of the day. No longer focusing on tasks that needed to be done, I could better appreciate the surroundings, particularly in the hour around sunset when everything would be painted gold and blue. 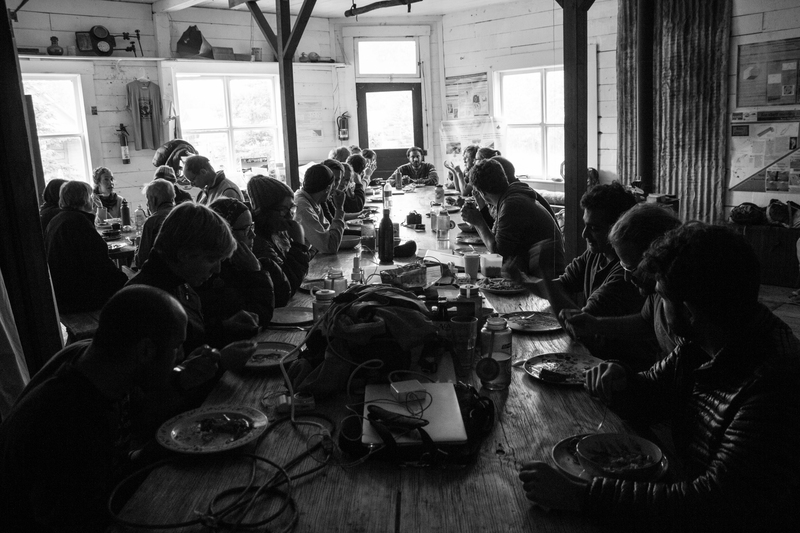 To work in such an environment is a privilege, and time needed to be taken to set aside concerns and stresses, and simply take note of where we were. 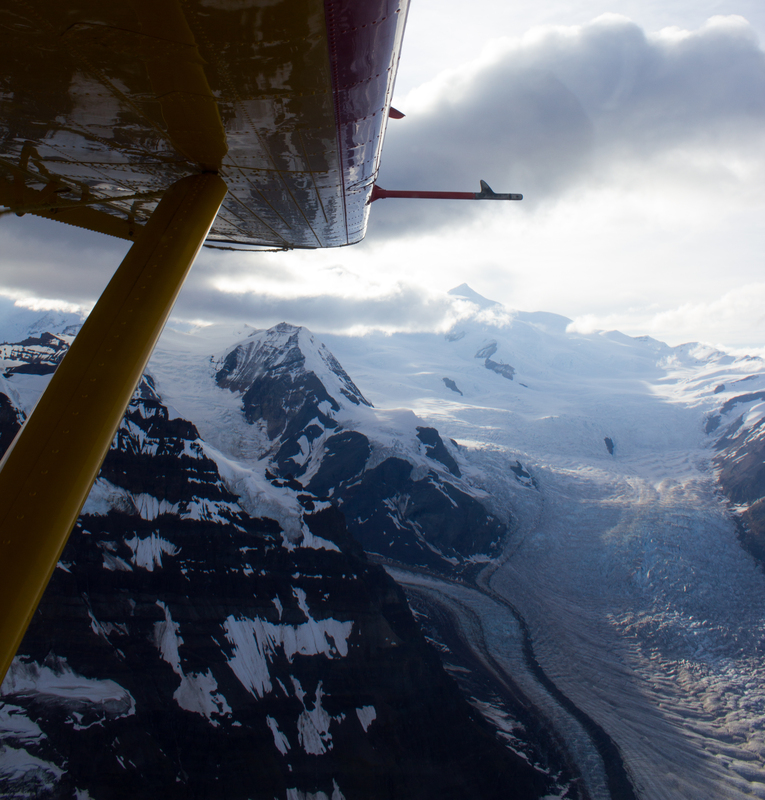 On the morning of departure, we flew over the glacier to get our last view of the station for the next two months. 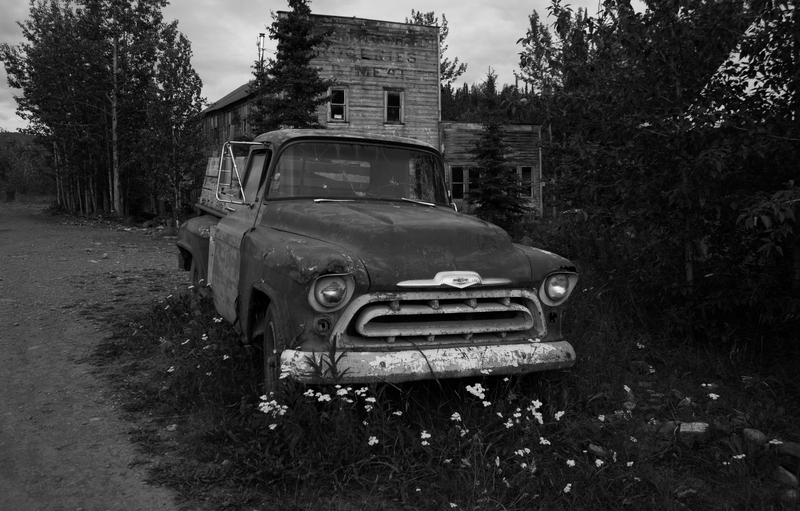 I will return at the beginning of September to see how well it survived, to dismantle and transport it back to Vancouver, and to start working on what its data can tell us. 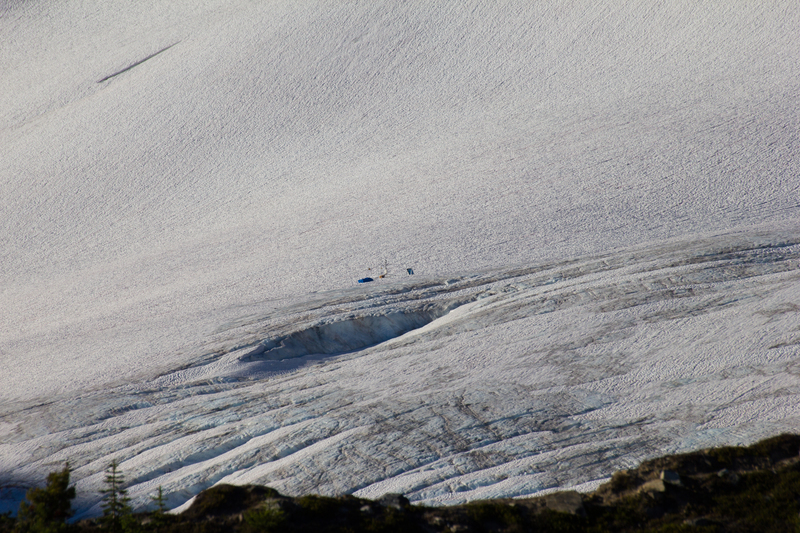 The station through a telephoto lens, as seen from the lodge on the morning of departure. Station from above as we flew out. 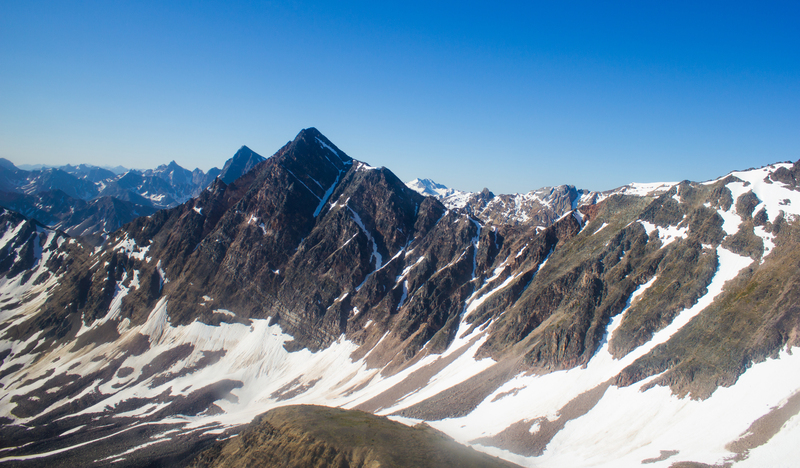 Passing through the Selkirk range (images above and below) on the flight back to golden. 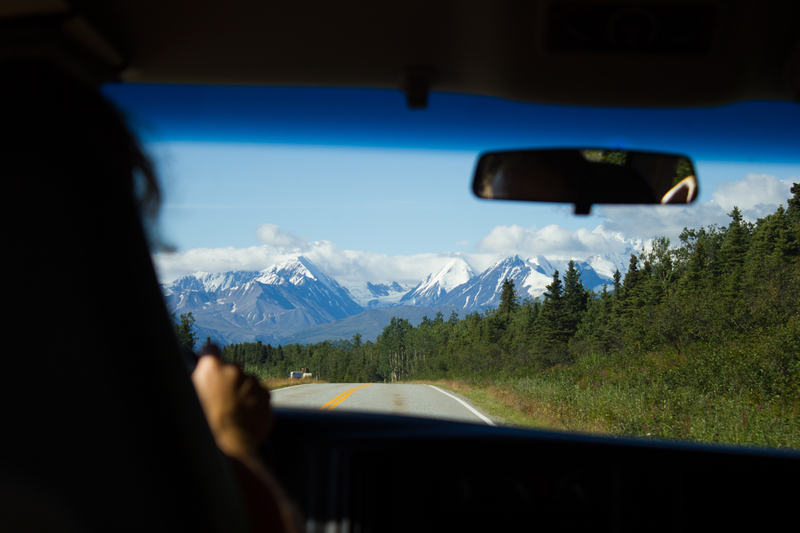 We tackled the drive back to Vancouver on the day we flew down, utilising several food/coffee/ice cream stops to keep sleep and the 35°C of the Interior Plateau at bay. 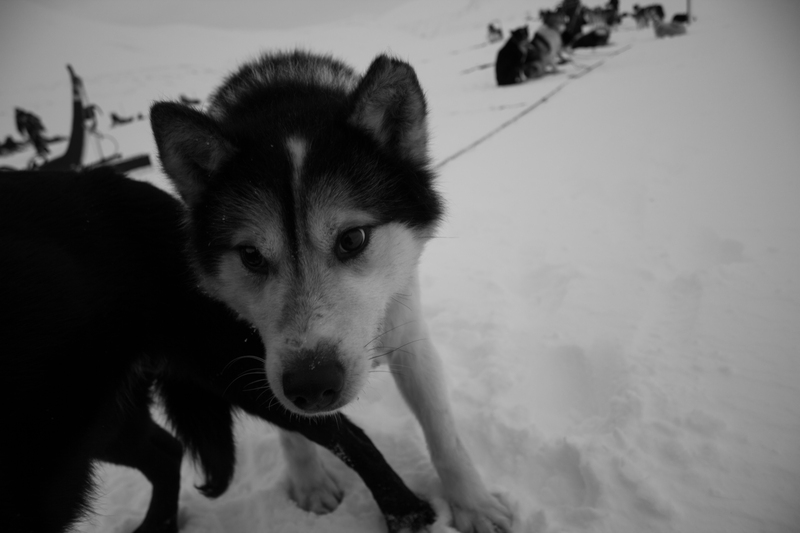 Arriving back to the city, I was tired but content that the work had gone well, and looking forward to taking it easy for a few days before preparing for my next trip (Alaska). 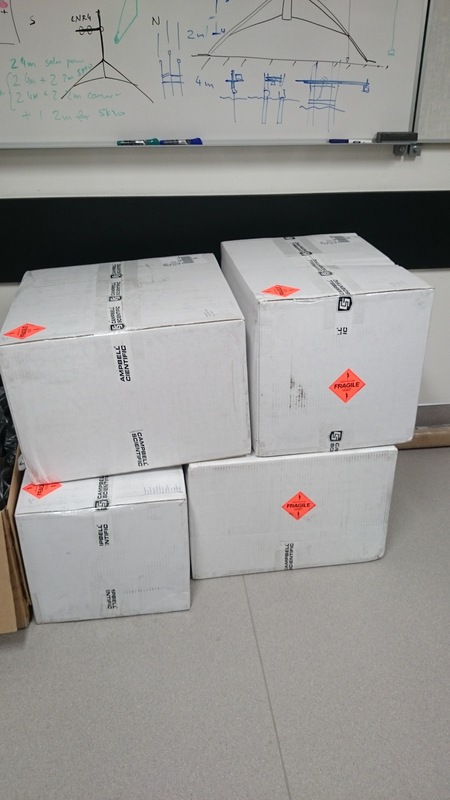 Calling into the lab to drop off a couple of items before going home, I was greeted by a delivery of 4 large boxes; the starting components for next year’s stations. 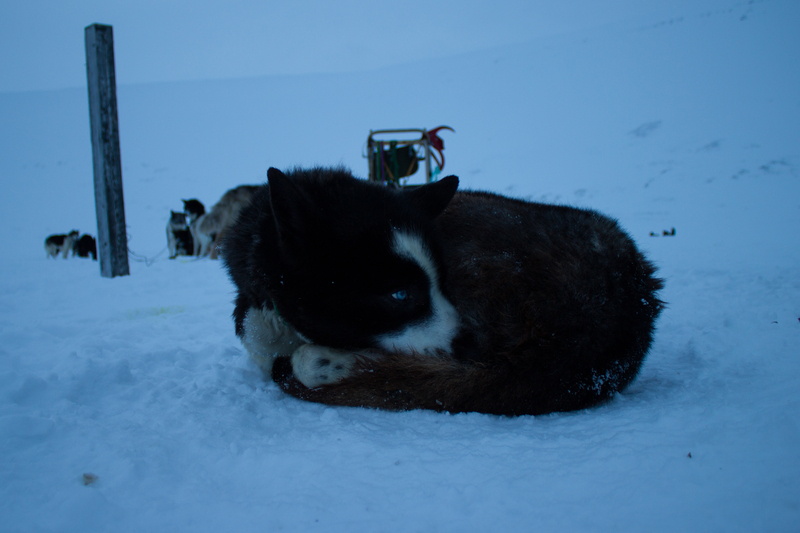 It was time to get some sleep. The beginnings of next year’s field campaign. 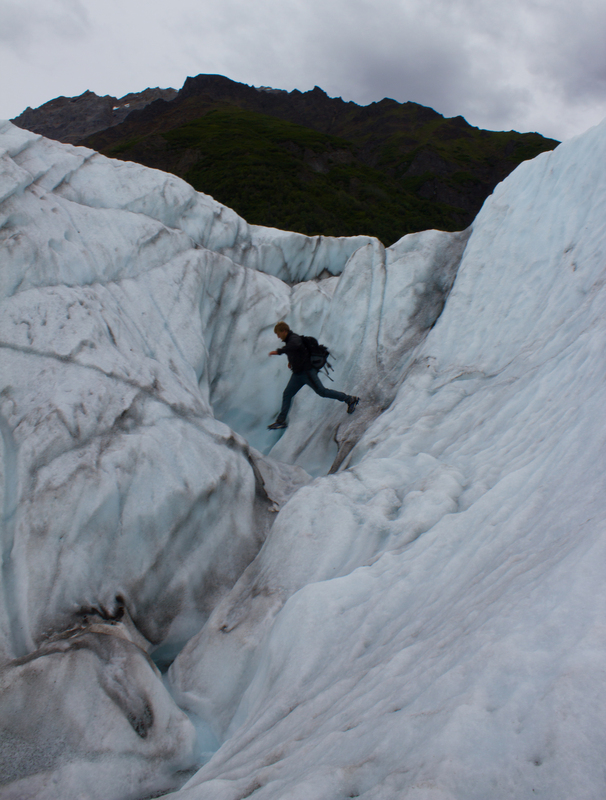 Up Next: I’ve just returned from a glaciology summer school in Alaska; photo-journal coming in the next couple of days. 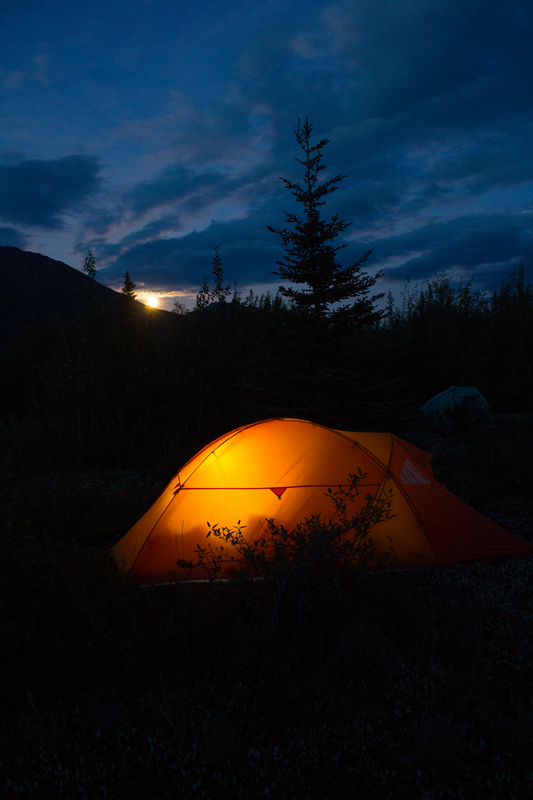 It’s finally time to head to the hills. 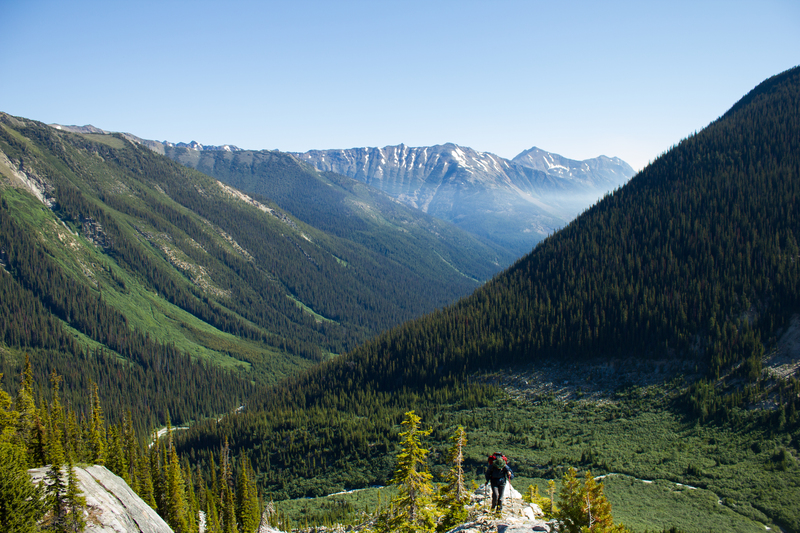 Since I arrived in Canada six months ago, the majority of my focus has been geared towards the next 8 days. 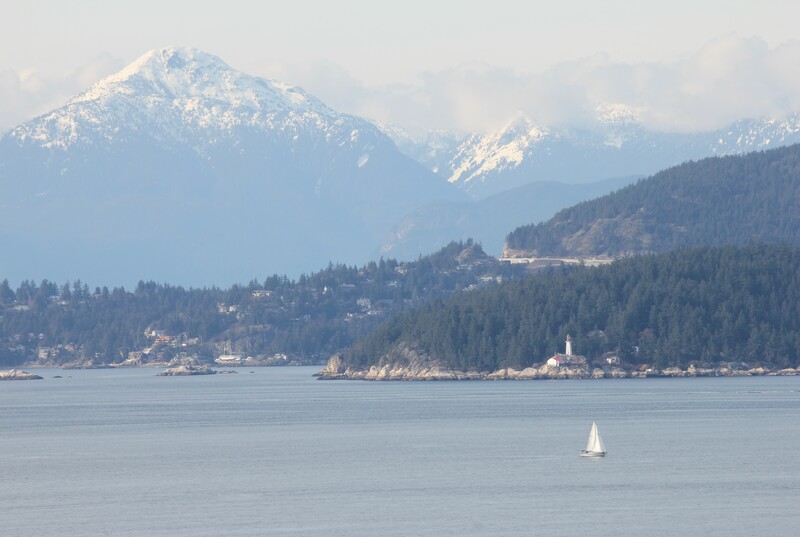 Early tomorrow morning, we leave Vancouver, and aim towards Nordic Mountain. 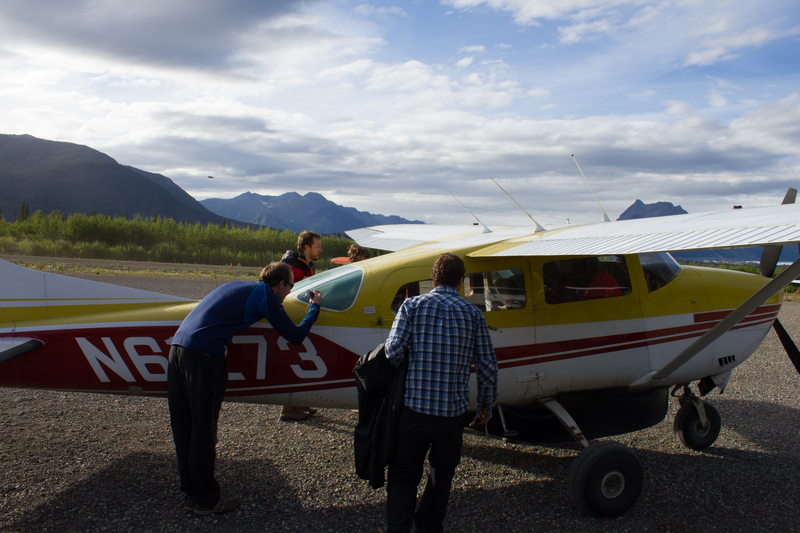 We will first travel to the town of Golden, where we will stay over night, and then load up the helicopter for the flight to the glacier. 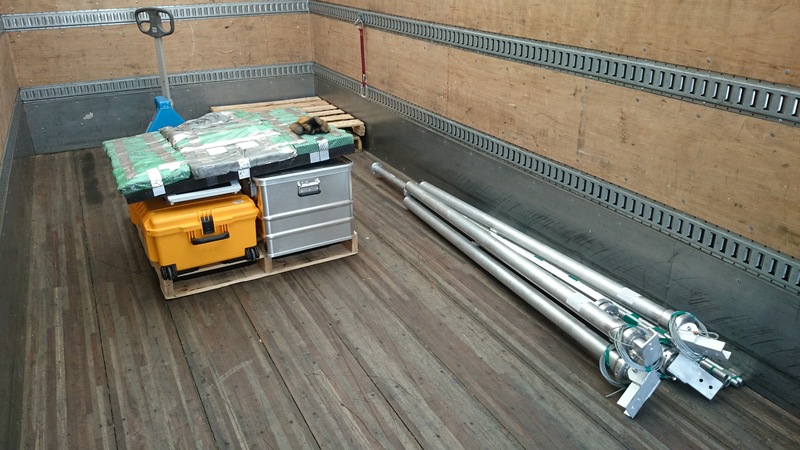 Large items were shipped out in advance last week. 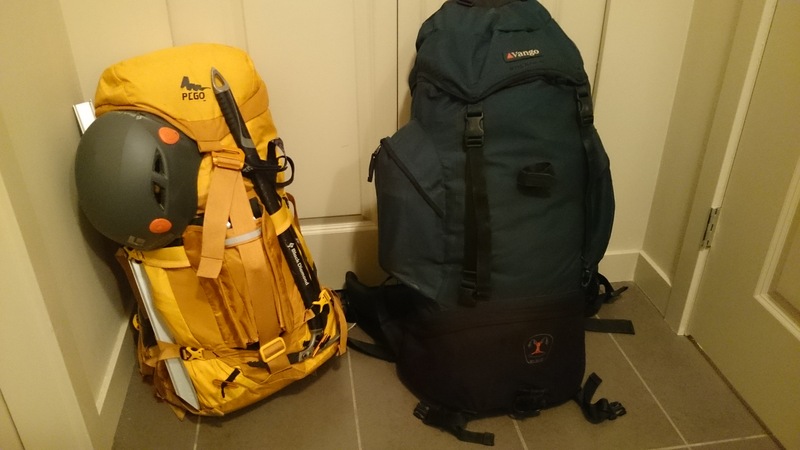 My own bags, ready for an early morning departure. So a brief explanation as to why I’m here is required. 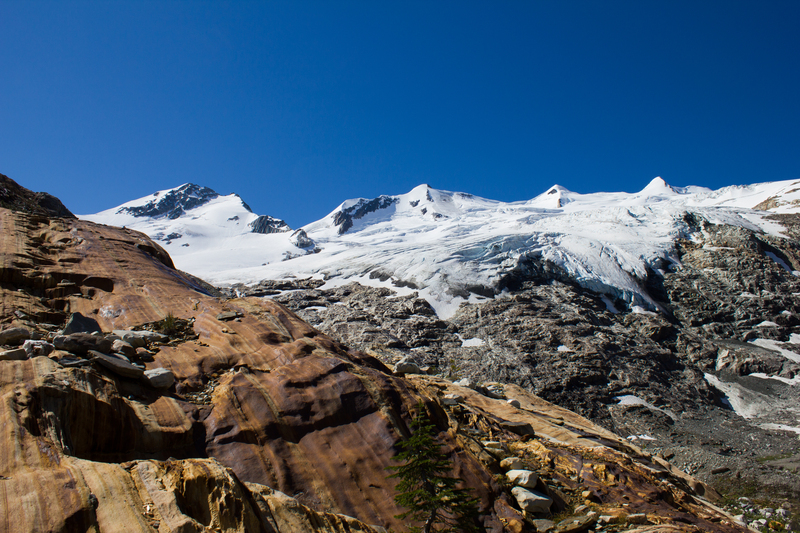 I’ve come to Vancouver to start a research project examining the relationships between the atmosphere and glaciers. 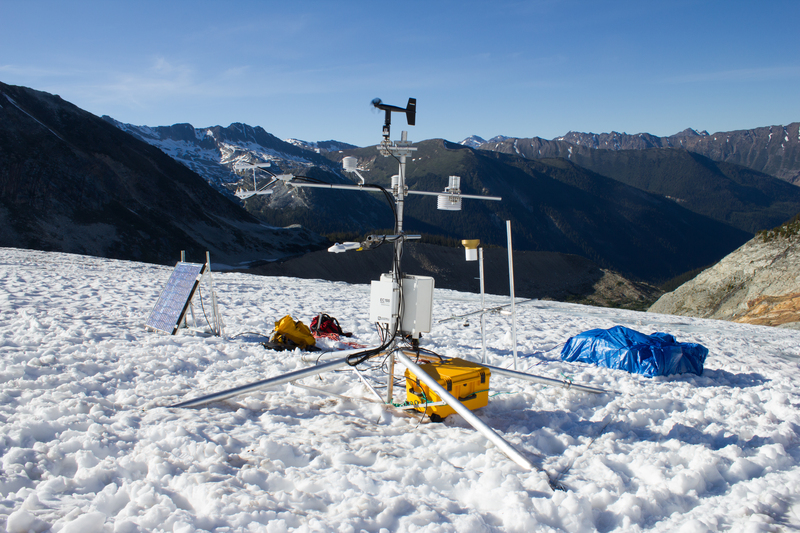 I had been working as a research meteorologist for Met Éireann (Irish national weather service), when the opportunity arose to take up a PhD in Atmospheric Sciences at the University of British Columbia (UBC). Evening view looking north over UBC, Vancouver. 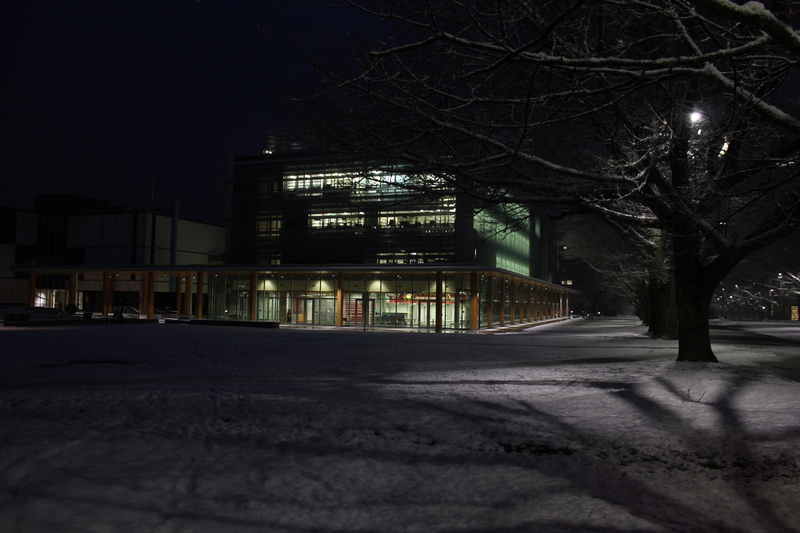 The Department of Earth, Ocean, and Atmospheric Sciences, UBC (snowfall is actually a relatively rare occurrence in urban Vancouver). 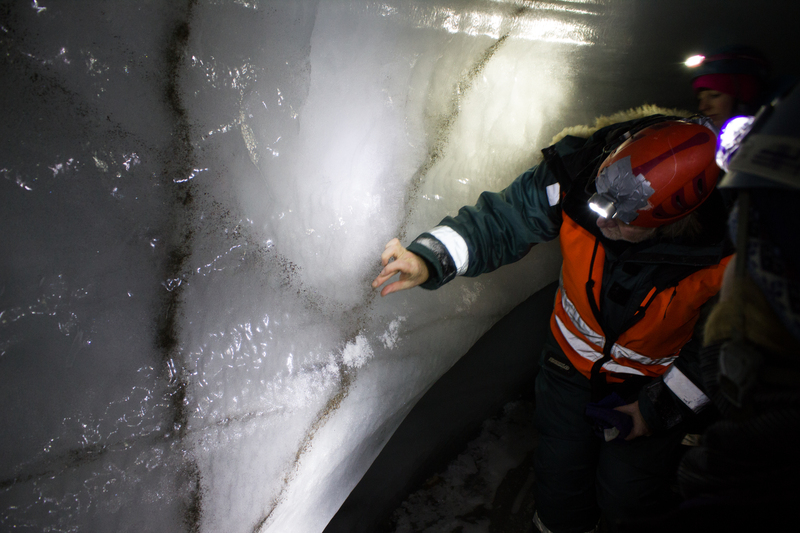 In a nutshell, my project aims to examine all the ways in which energy enters and exits the surface of a glacier, and how the balance between incoming and outgoing energy affects the melting or cooling of a glacier’s snow and ice. 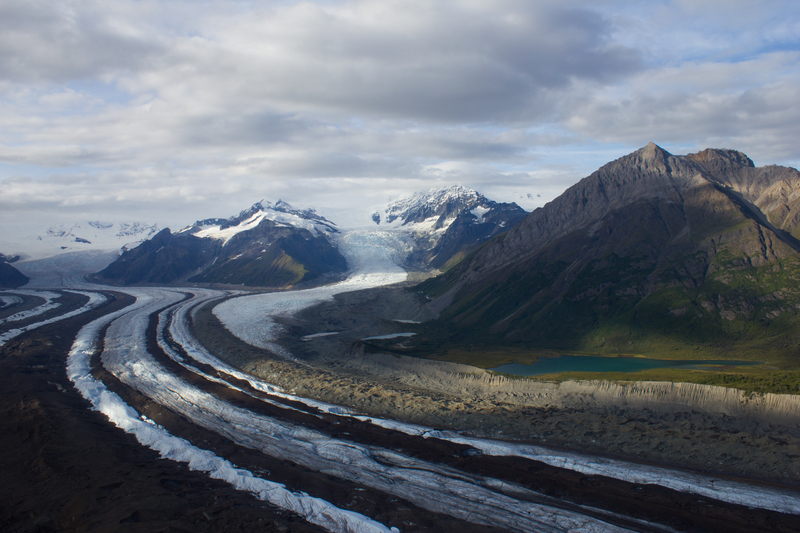 On a broader scale, my hope is to put this work towards improving our understanding of how glaciers will respond to changes in our climate. 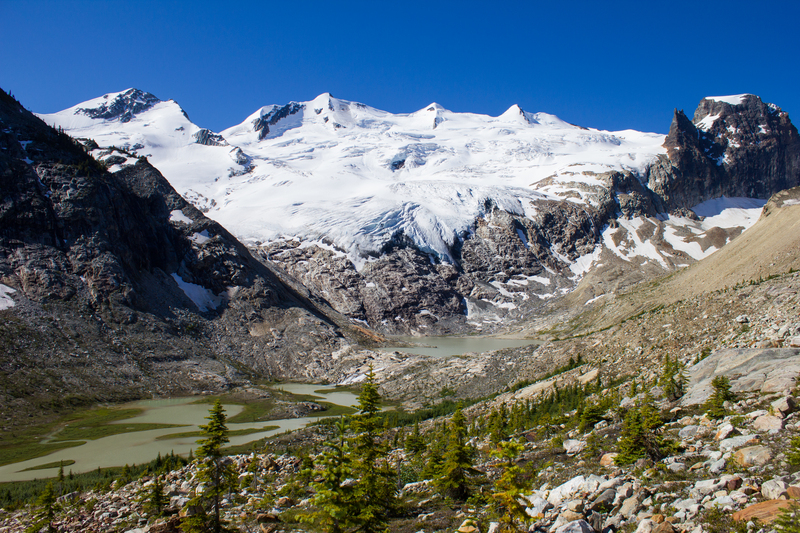 The initial plan is to install a weather station on a glacier in the Selkirk mountains in British Columbia, beginning this summer. So, what’s required for the design? 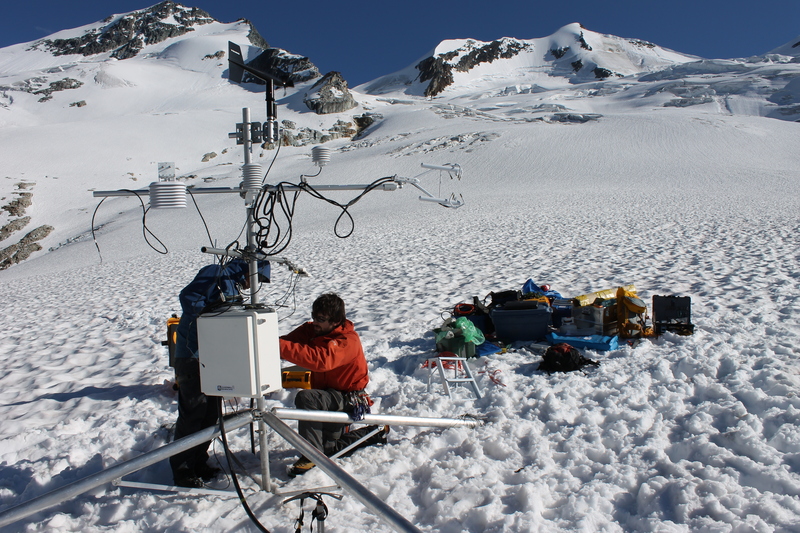 The station needs to have sensors to measure each of the variables relevant to glacier energy balance. 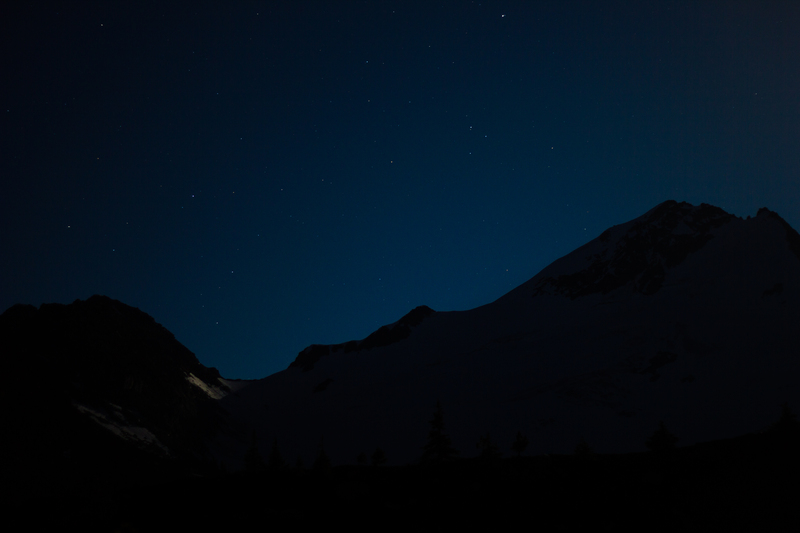 These include air temperature and humidity, radiation (for example, the incoming energy from sunlight), wind speed, and the transfer of heat and moisture by local air currents or ‘eddies’. 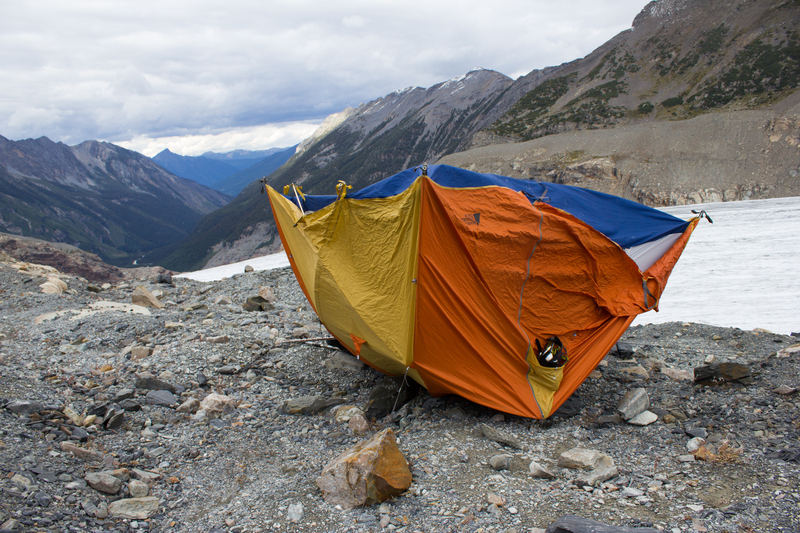 It needs to be robust and reliable enough to operate in a remote mountain environment, unsupervised for several months. It needs to have its own independent power source. 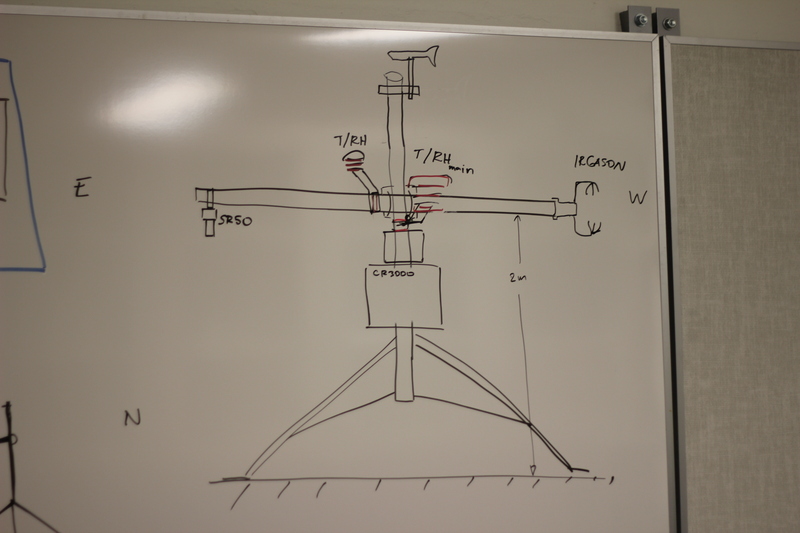 Initial design and set up stage. Despite extensive testing, no interesting weather was detected in the lab. 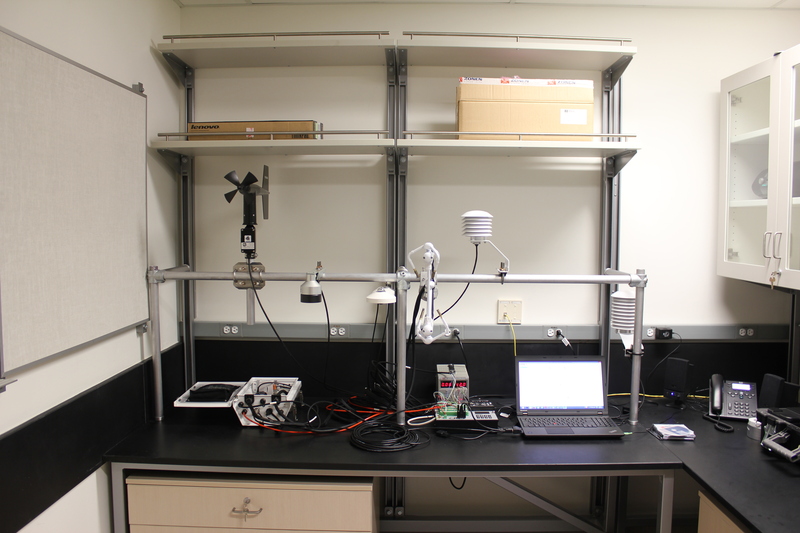 The first step was to assemble and test all of the individual components in the lab, and to set up a method to automatically record and save the measurements made by each sensor. The lab is where you want to make your mistakes, and where you want things to go wrong. 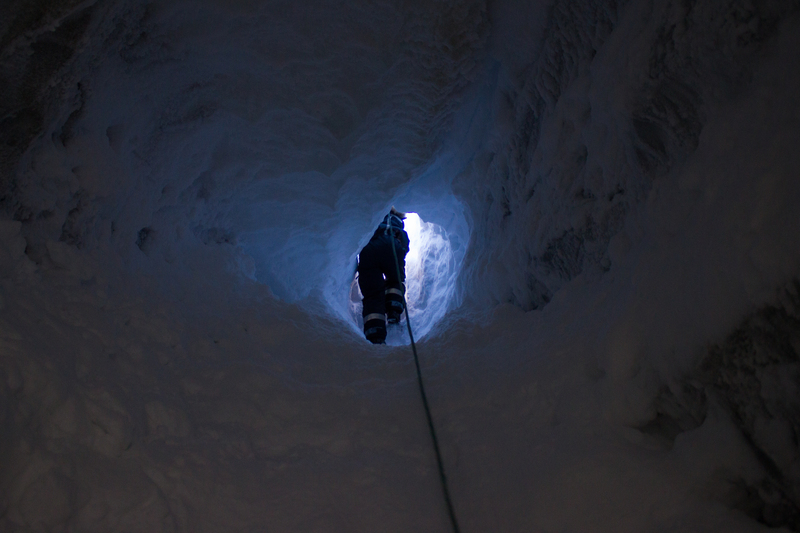 The more problems that present themselves in the warm, dry lab, the fewer that will come as a surprise when you’re struggling with cold fingers on the side of a mountain, or worse, when you’re already hundreds of kilometers away, oblivious to the fact that your PhD is falling into a metaphorical or very literal crevasse. 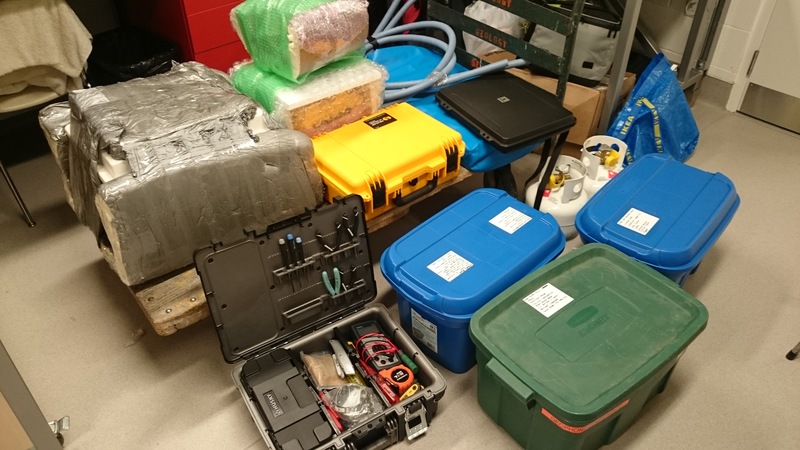 With things up and running in the lab, thoughts turned to how all the components will be brought together and mounted on the glacier, and on how to reliably power the station in such a remote setting. 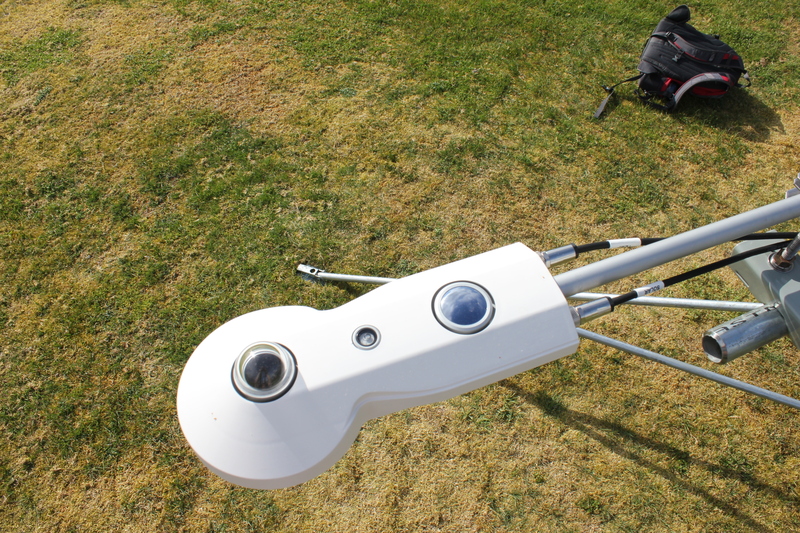 The plan is to rig the sensors on to a wide, stable tripod, with power provided from two marine batteries (like rugged car batteries for boats). 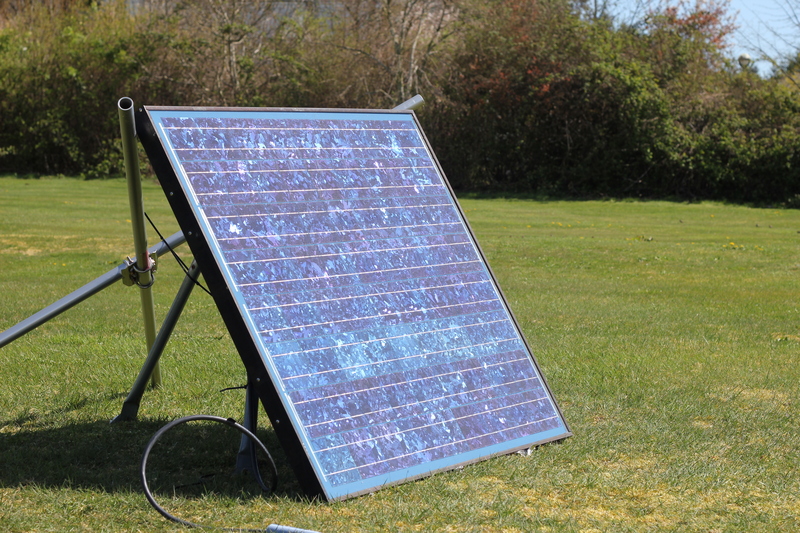 The batteries will be recharged using a solar panel mounted nearby. From sketches, to nuts and bolts. 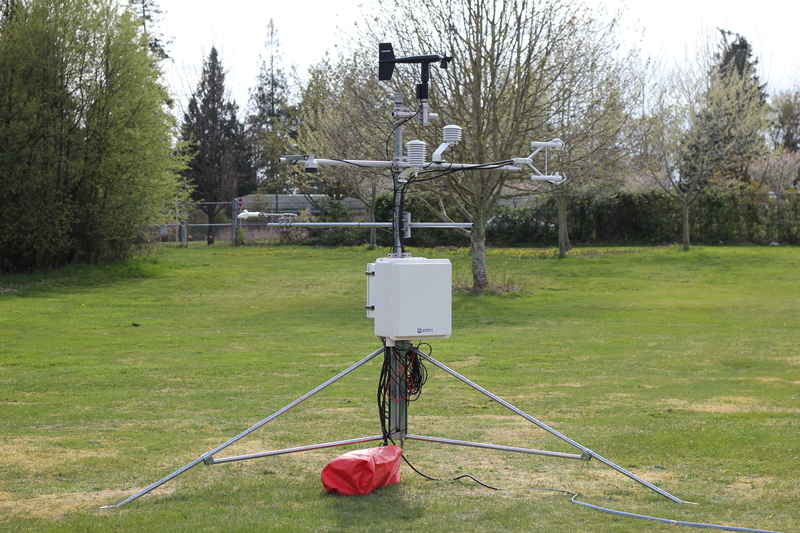 A test rig has been put together, and is now running at an outdoor site on campus. The main issues I’ll be keeping an eye on during this test include insuring the system records all the data it’s supposed to, when it’s supposed to, that the data makes sense and the sensors aren’t interfering with each other, and that a few cloudy days don’t cause my power system to flat line. 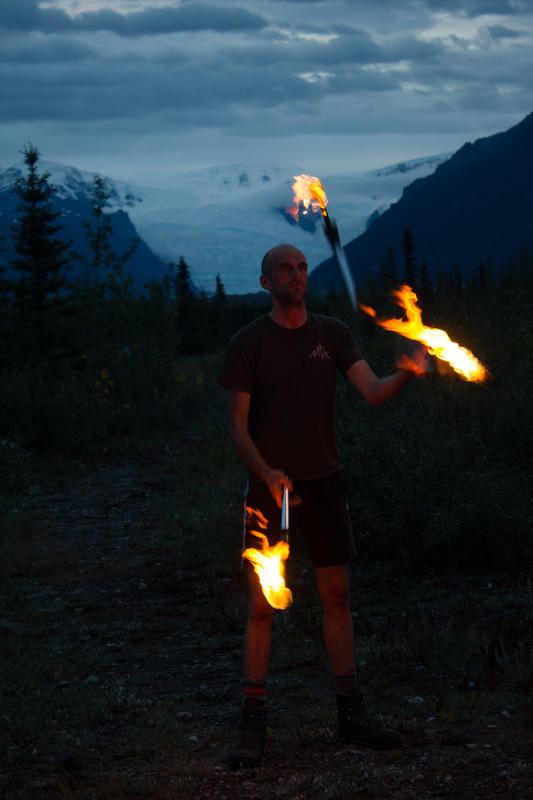 Below are some images of the sensors I’m using and what they are for. 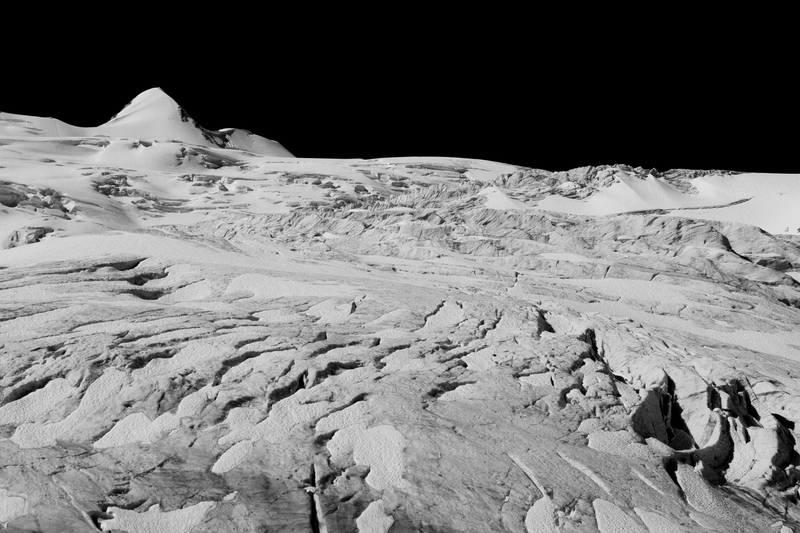 For anyone interested, I intend to go into a little more detail on the science behind the project in future posts. I’m no expert though, so it should all be fairly readable! Above and below views of the four component radiometer. 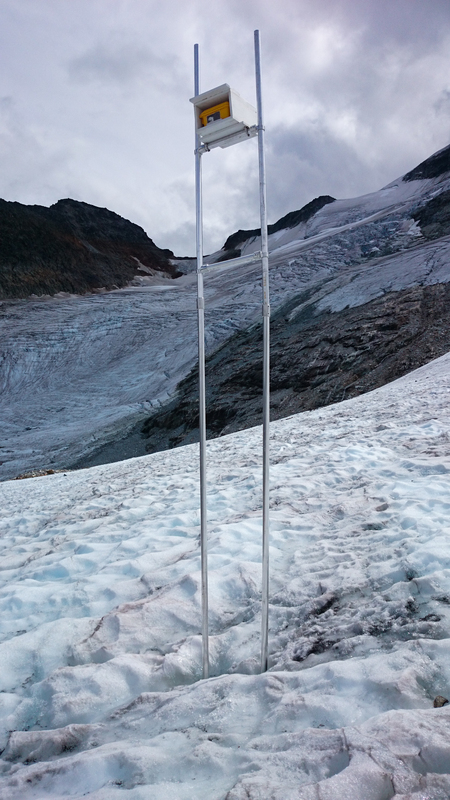 This sensor measures incoming short and long wave radiation (from the sun, clouds etc) using the two instruments on top, and also outgoing short and long wave radiation reflected or emitted by the glacier using the bottom facing instruments. 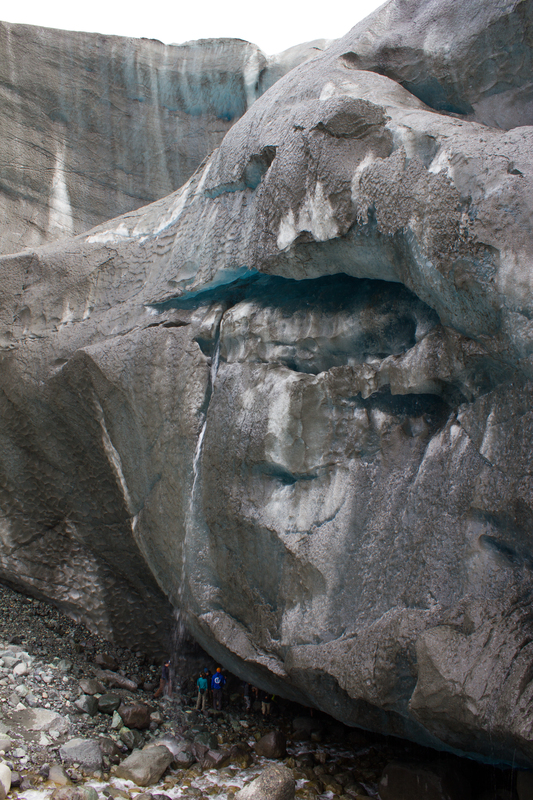 The balance of incoming and outgoing radiation is one of the most important controls of glacier surface energy. 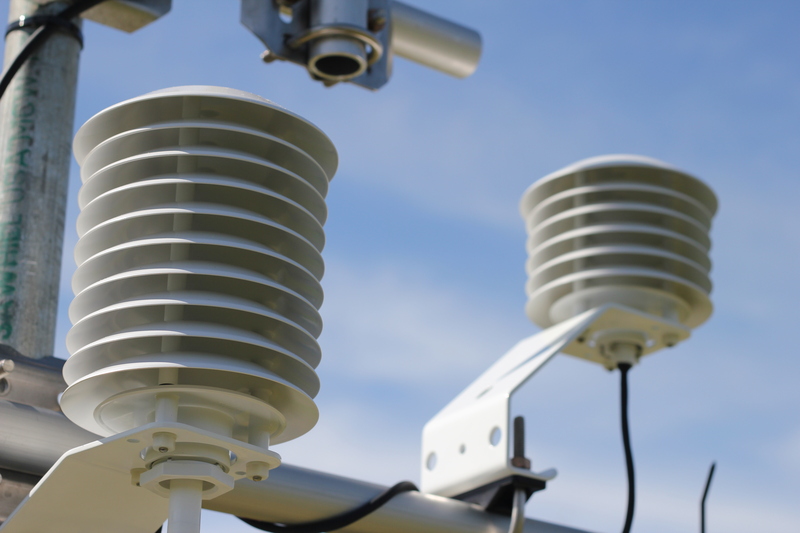 The sensors for measuring air temperature and humidity are housed in beehive-like enclosures known as radiation shields. 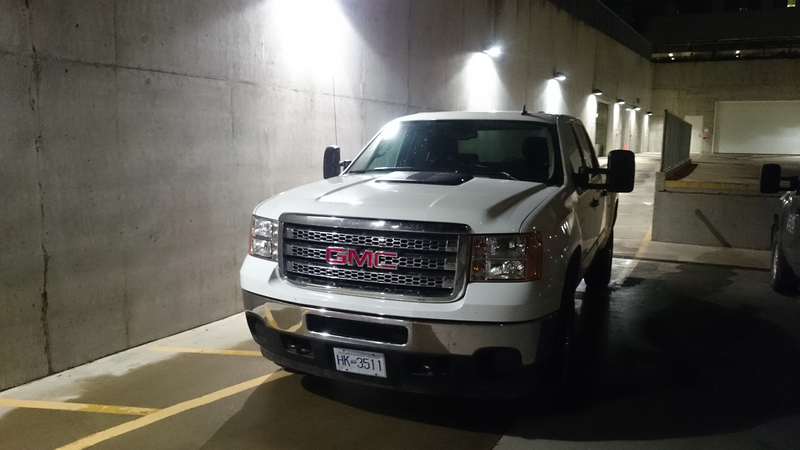 These white shields protect the sensors from direct heating by the sun or excessive cooling at night (which would cause inaccurate readings), while still allowing the air to flow past the sensor and be measured. 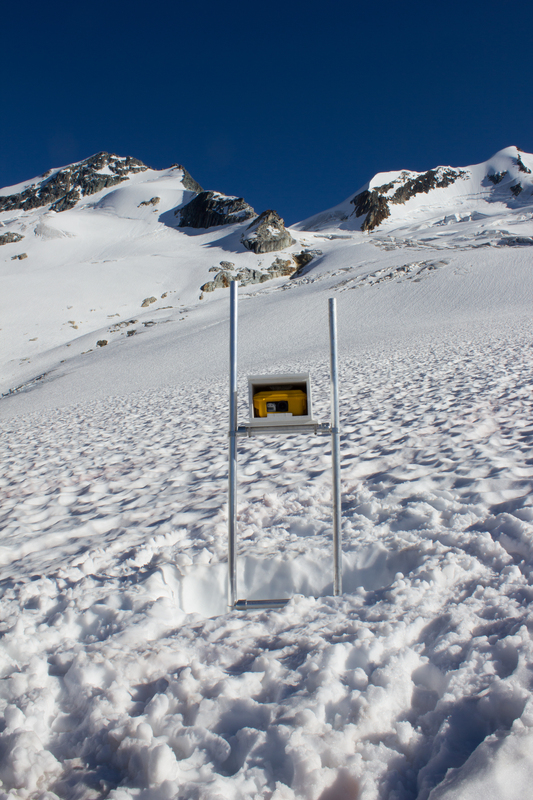 The snow depth sensor (also known as a sonic ranger) measures the time it takes for a sound wave to travel from the sensor down to the surface and back. 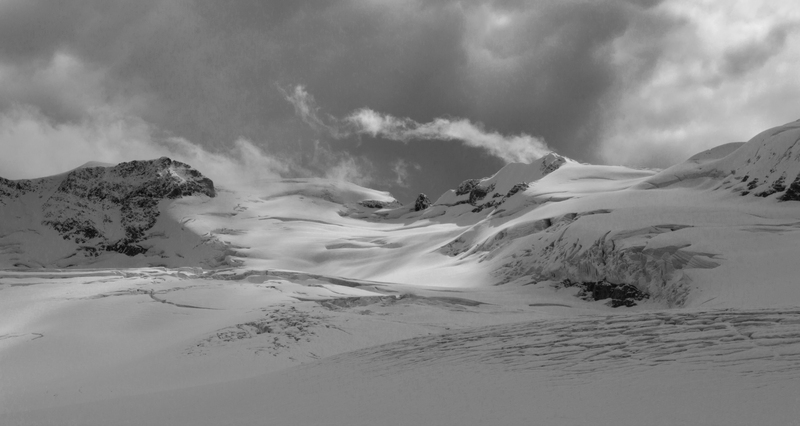 Changes in the length of time taken equate to changes in the height of the snow/ice surface. 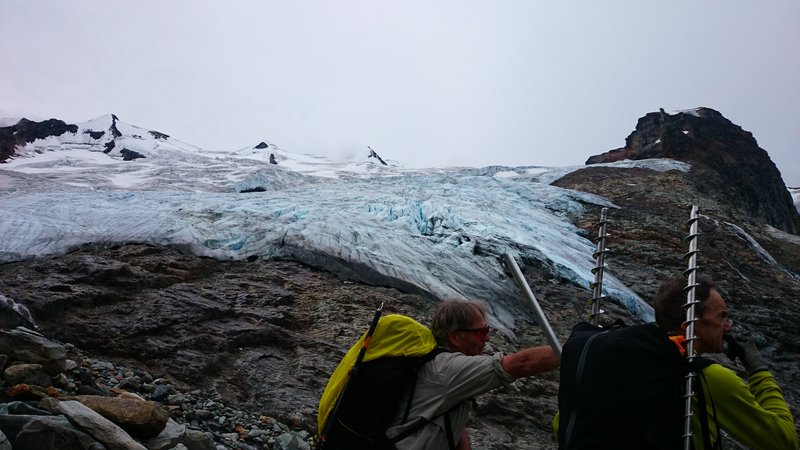 In this study, it will be used to measure the rate of surface melting on the glacier, and it will be mounted on a separate fixed mast to the other sensors. 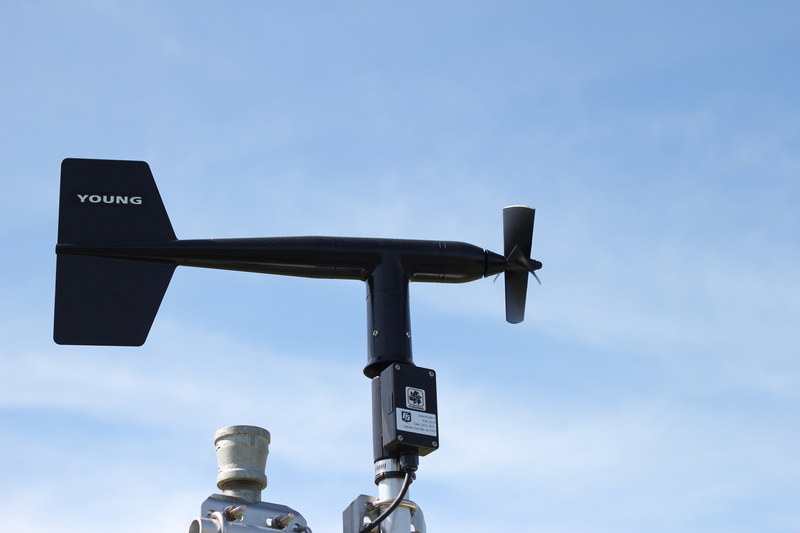 The wind sensor measures wind speed by the rate at which the propeller at the front is rotated by the wind, and the wind direction by which way the wind turns the sensor (it is designed so that the propeller end will always turn to face the direction of the oncoming wind). 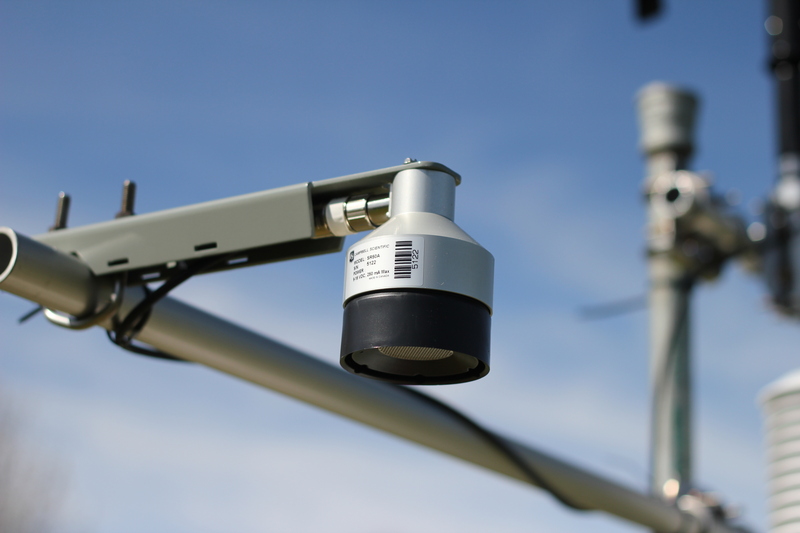 This is a combined sensor which measures both the movement of air (wind), and its water content. 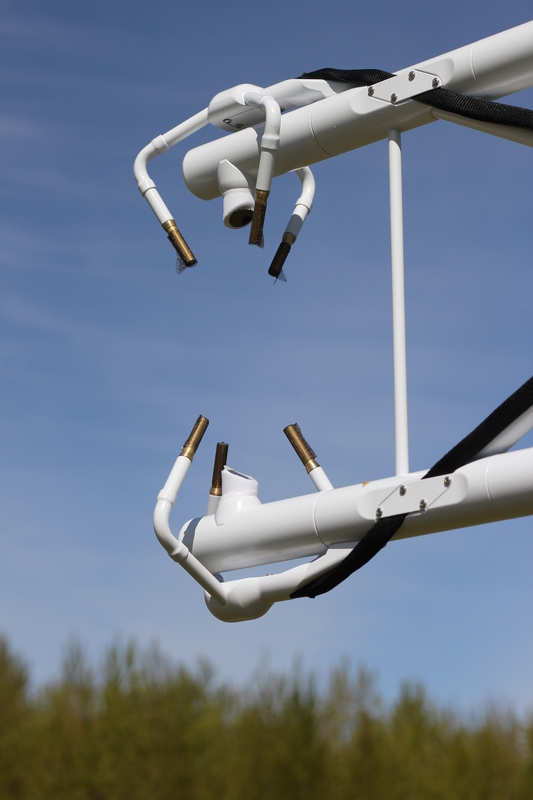 The two claw-like structures make up the wind sensor, which is known as a 3D sonic anemometer. 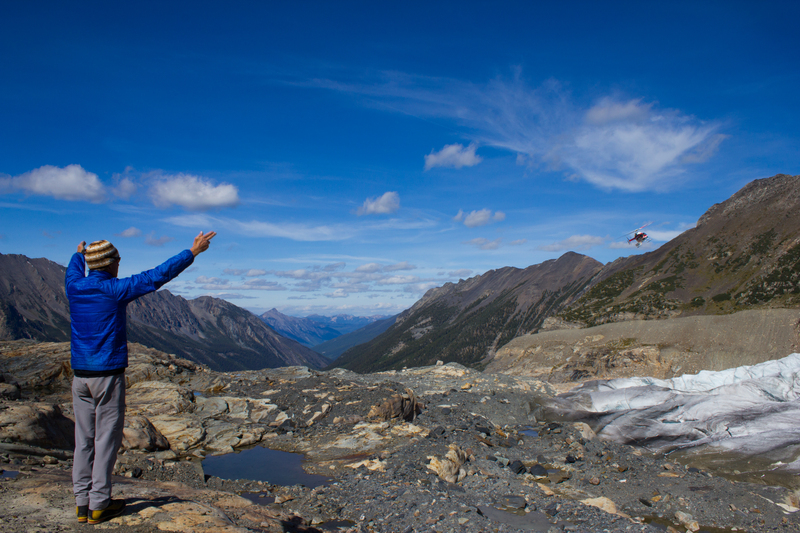 It measures wind speed or air movement in three dimensions. 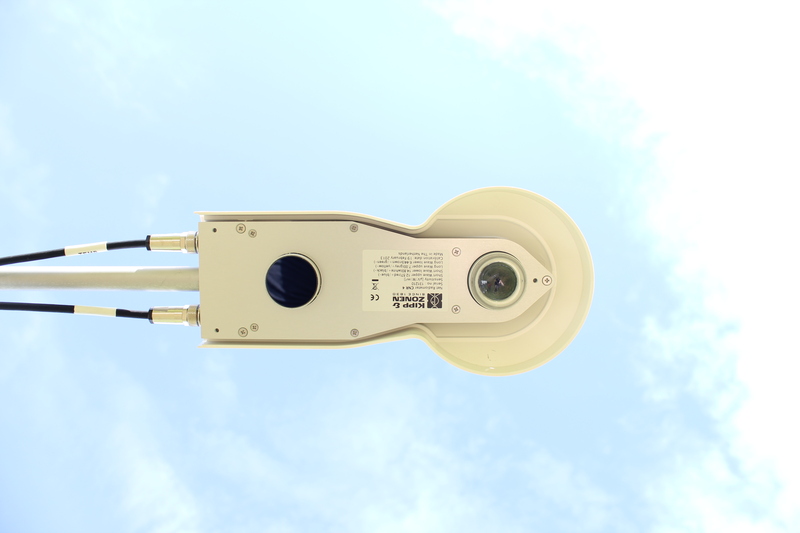 The two lenses in between this sensor make up the gas analyser, which uses an infrared beam to estimate the water content of the air flowing past. 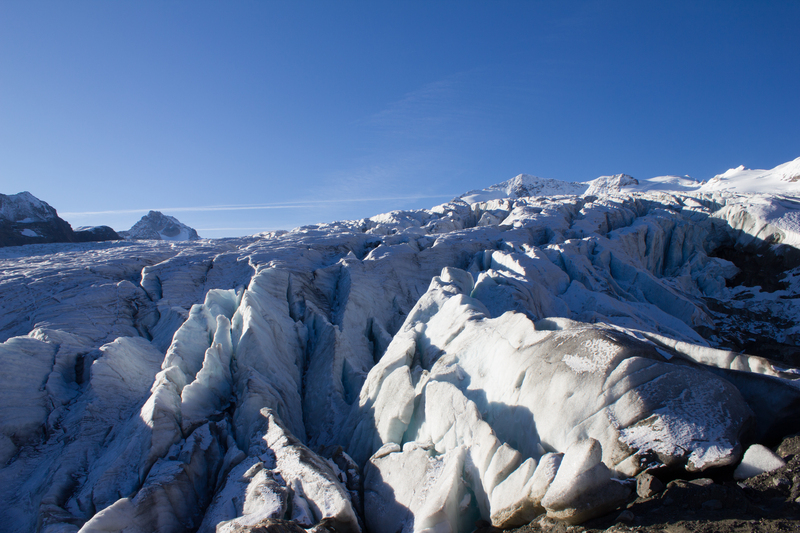 This sensor will be used to observe the the air currents or eddies which can transport heat and water to and from a glacier surface. 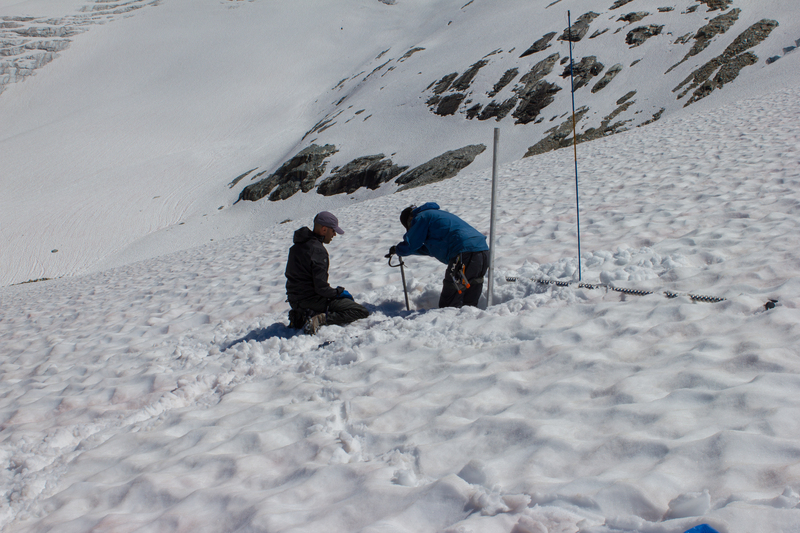 These measurements are one of the more unique aspects of this project, know as the eddy covariance technique, and will be explained in greater detail in future posts. 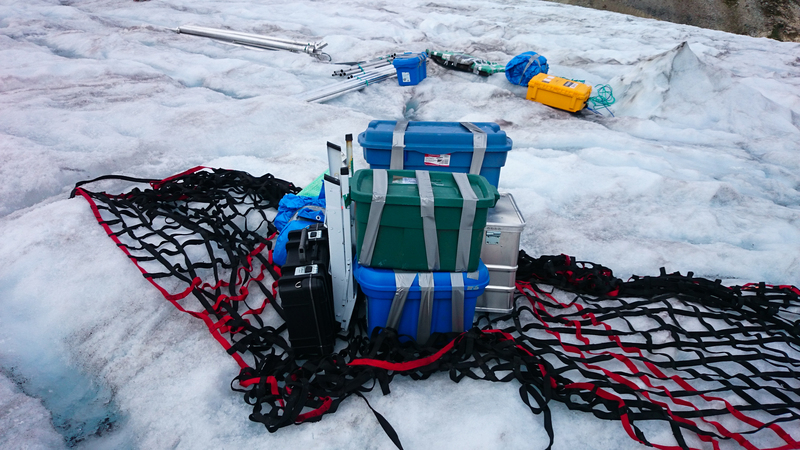 The brains of the operation: the data logger (top right) has been programmed to communicate with each sensor, telling it how and when to take measurements, and saving the data produced. 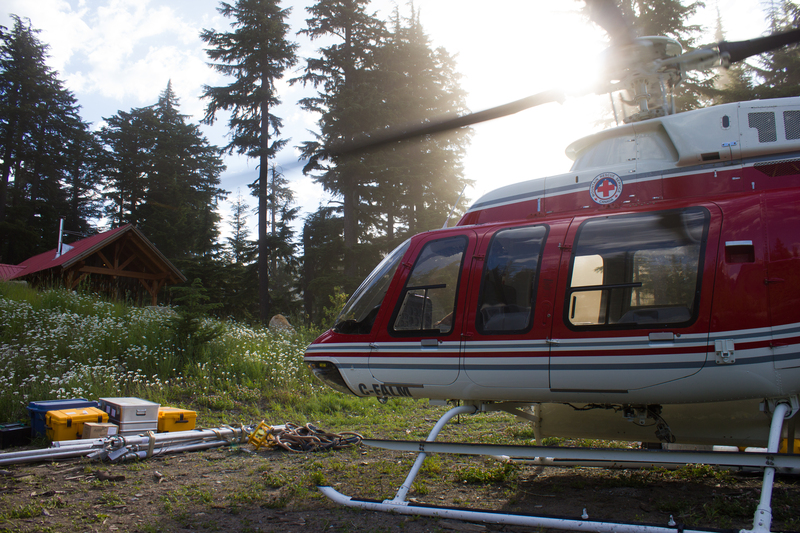 The white box to its left controls how power from the solar panel (below) recharges the batteries. 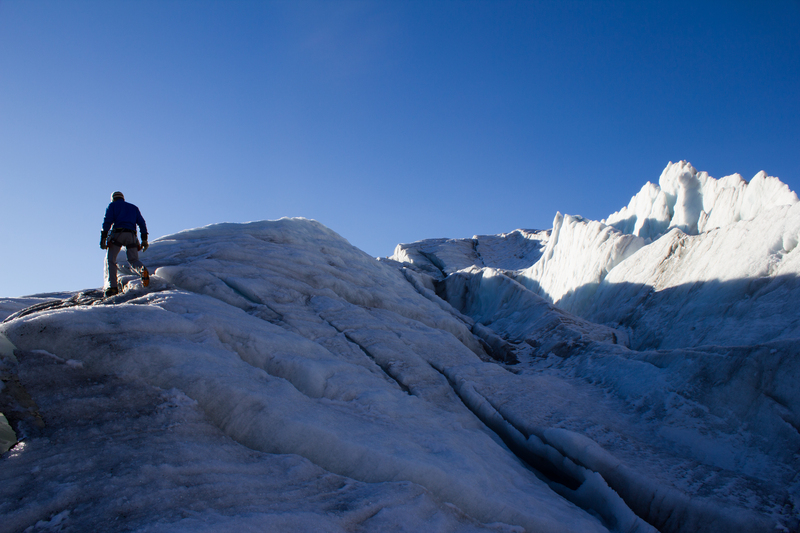 All going to plan, we will travel to the glacier and install the weather station this July. There will be some modifications and additions leading up to this, including a new custom made 4 legged ‘tripod’ (quadpod? 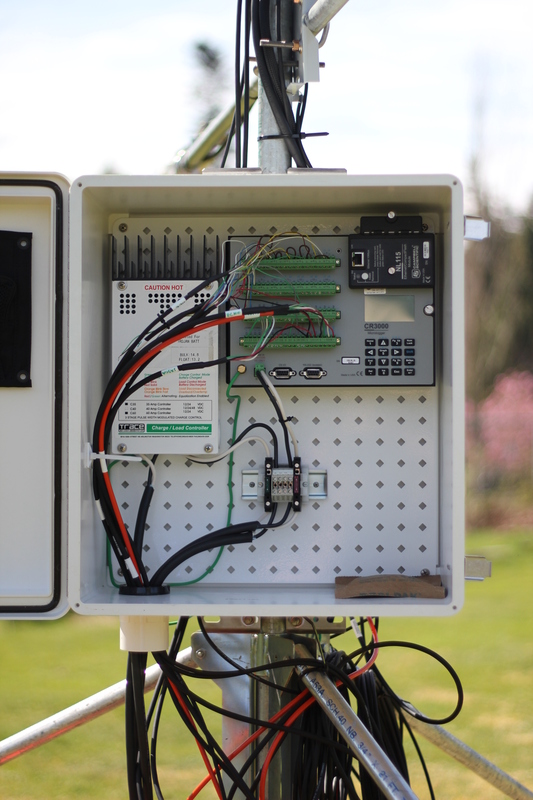 ), and a timelapse camera system which I will be building in the meantime. Many more hours in the lab and office will be required to get everything ready, but from this campus, reminders for why we are doing this are never far away. 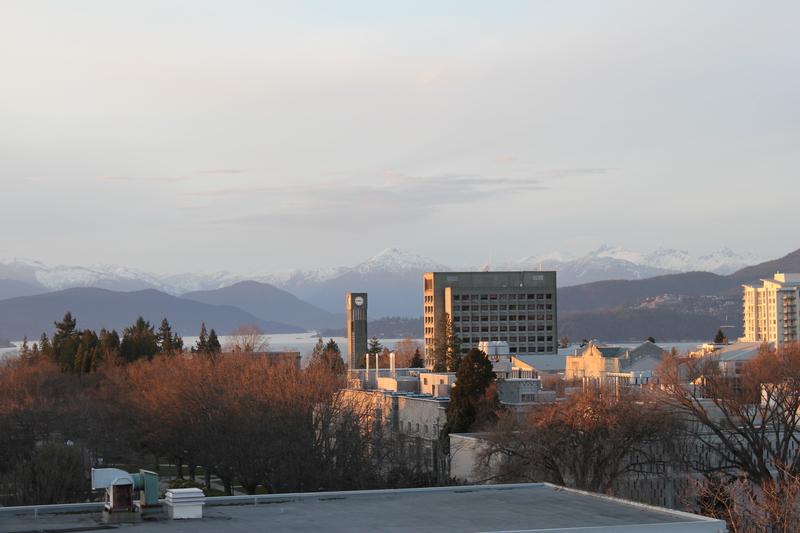 Looking north from UBC campus towards the peaks of Tetrahedron Provincial Park.